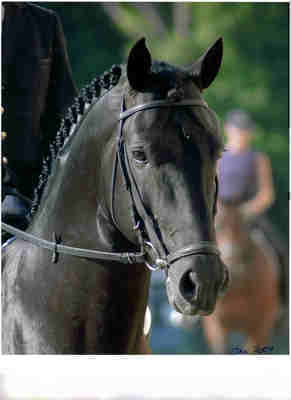 In the troubled year 1788, one Colonel De Lancey, a King’s officer, and a patron of horse racing, was in command of a regiment stationed at a point on Long Island connected with the mainland by a long bridge. 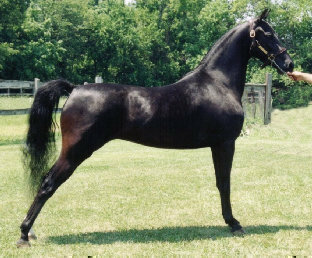 As his private charger, the Colonel had a very handsome bay stallion, a thoroughbred, called True Briton, and afterward Beautiful Bay. 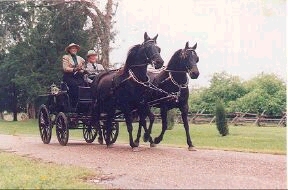 True Briton was by Lloyd’s Traveler, by Imported Traveler. 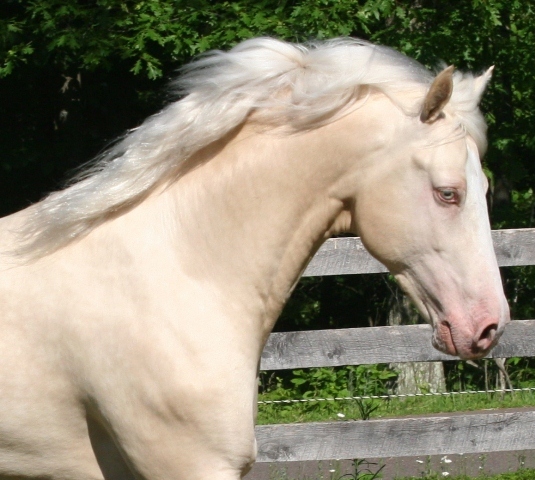 Some nameless person, perhaps a patriot ambitious to despoil the enemy, or as is more likely, a miscreant bent upon plunder, stole this True Briton, and ran him across the bridge to Connecticut, and thereupon he became an American possession, and was kept at East Hartford. 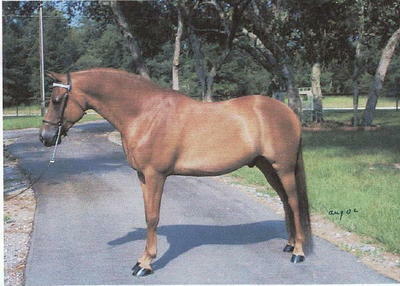 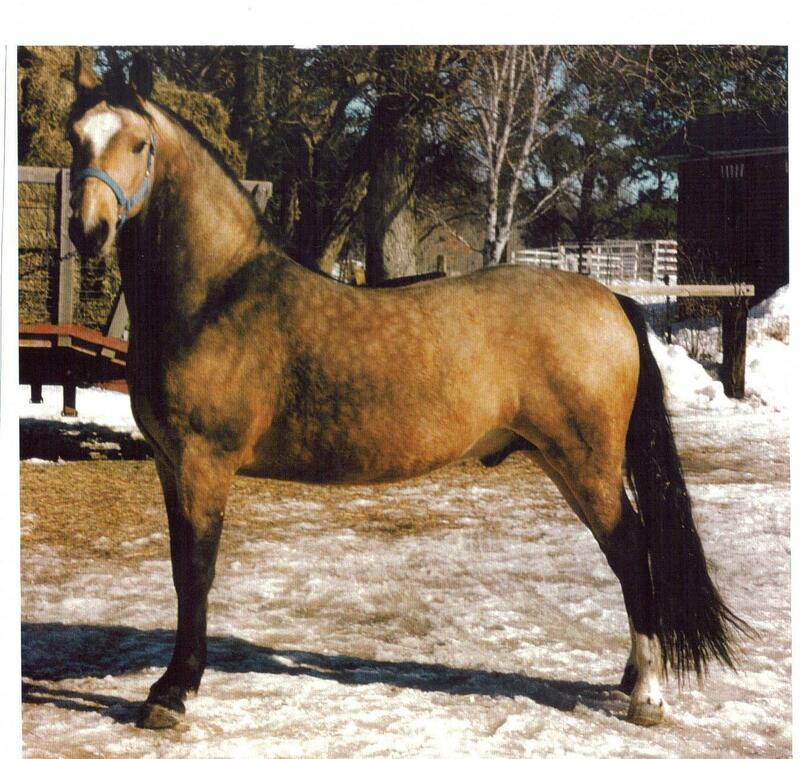 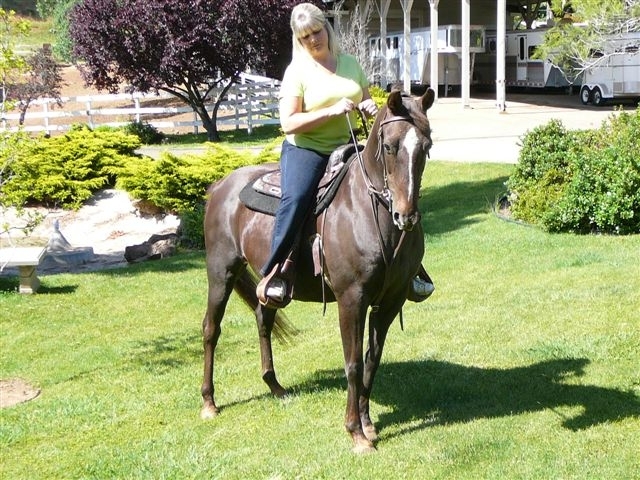 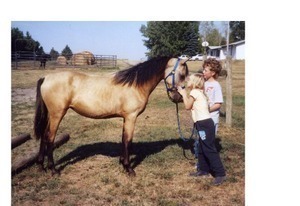 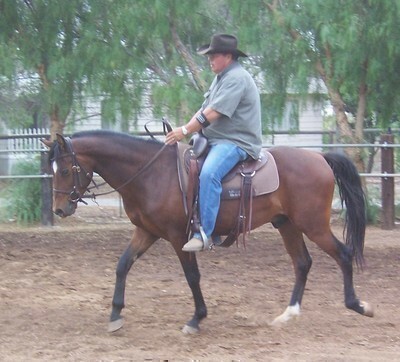 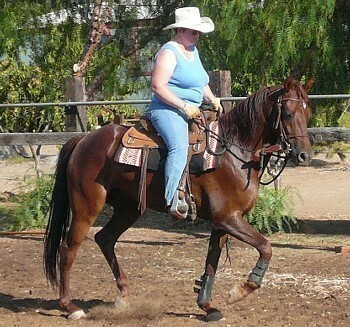 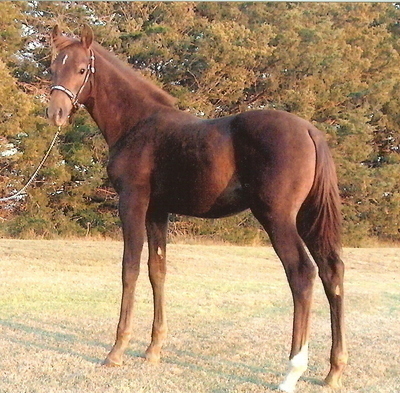 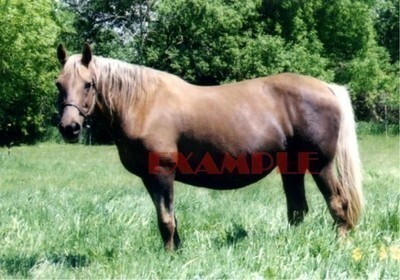 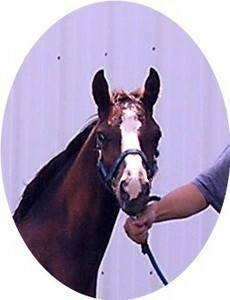 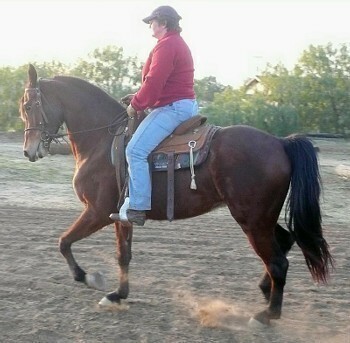 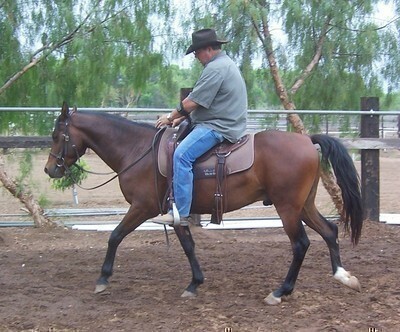 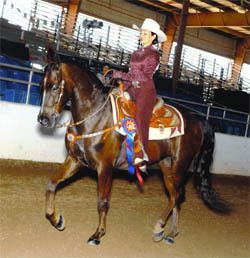 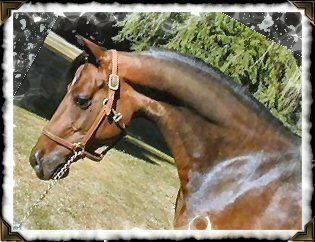 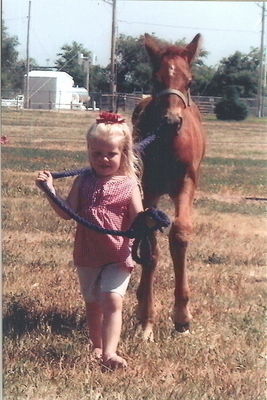 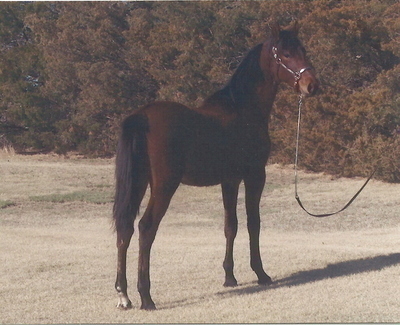 This horse was the sire of the bay colt afterward known as Justin Morgan. 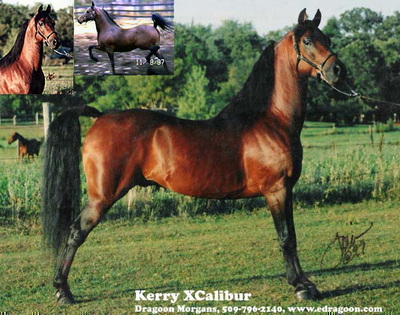 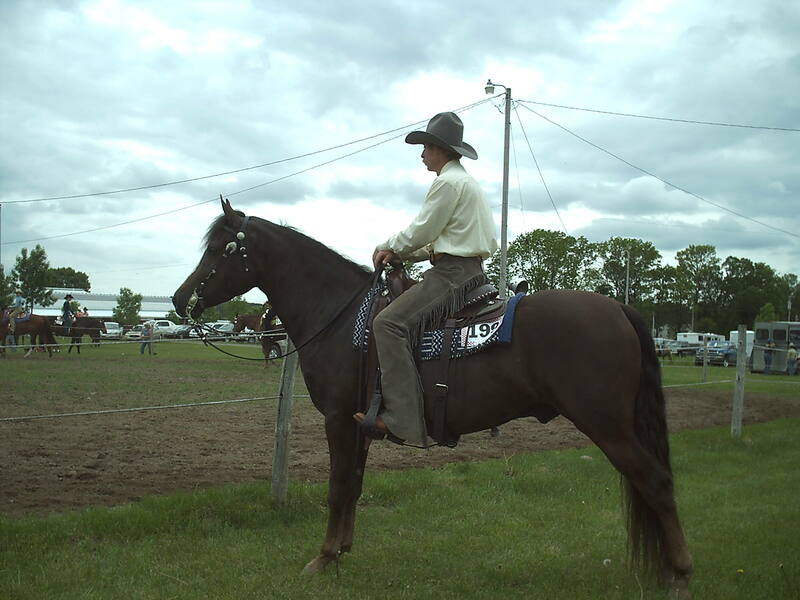 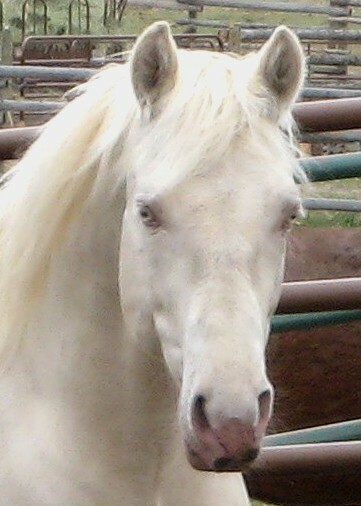 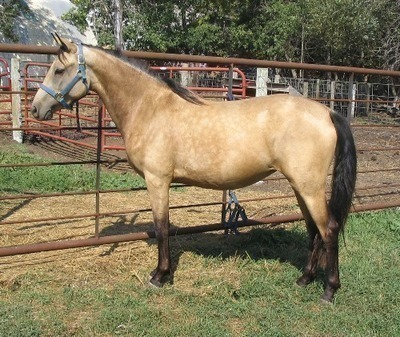 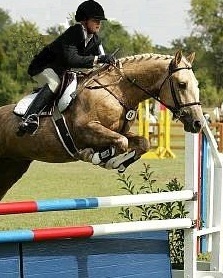 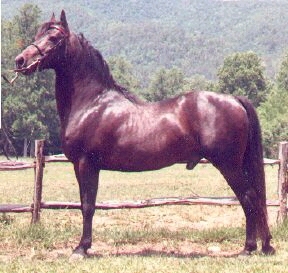 The dam of Justin Morgan is represented to have been of the Wildair breed. 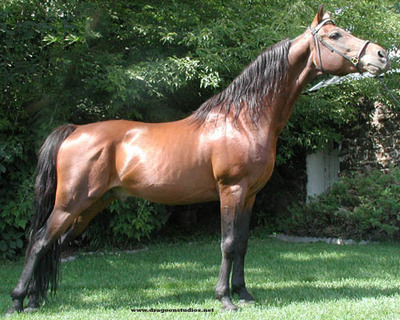 Wildair, a horse of the very first quality, was imported from England, and afterward repurchased at a high price and returned to that country. 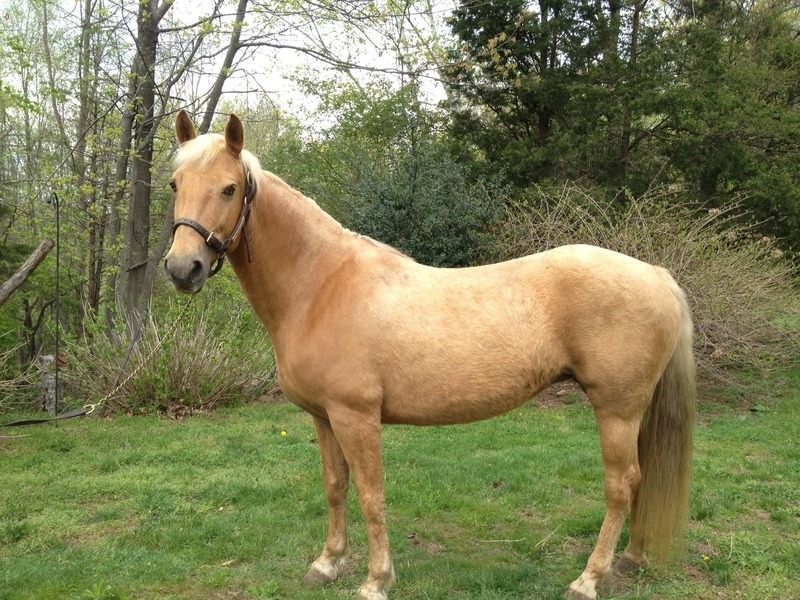 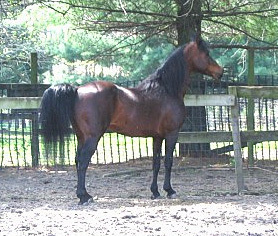 According to other accounts, Justin Morgan’s dam was descended from the Lindsey Arabian, a noted animal kept first in Connecticut and afterward in Maryland. 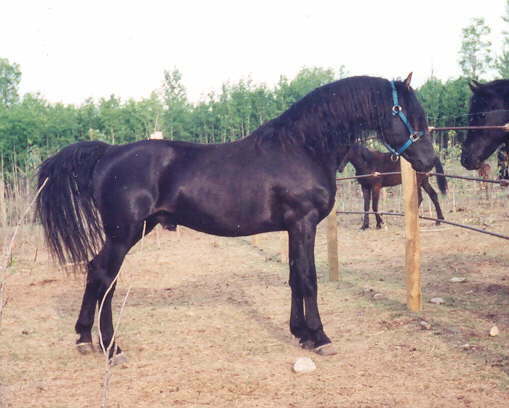 At all events, it is probable that she was nearly, if not quite, as well bred as True Briton, for so remarkable an animal as Justin Morgan could hardly have been a mongrel. 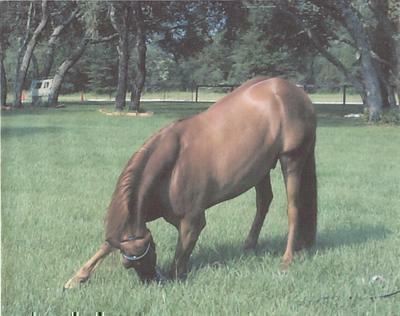 It must be remembered that at the time when Justin Morgan was foaled the typical thoroughbred was very unlike the thoroughbred of the present day. 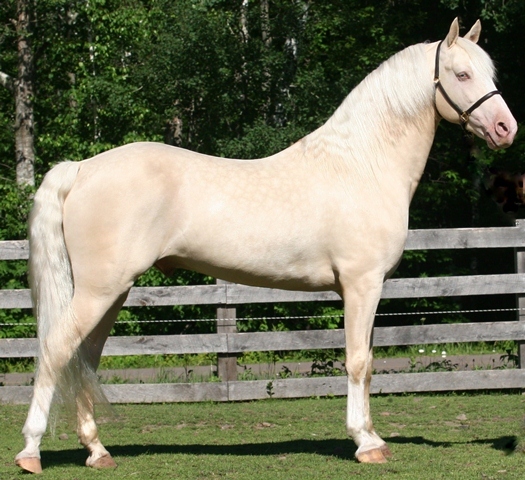 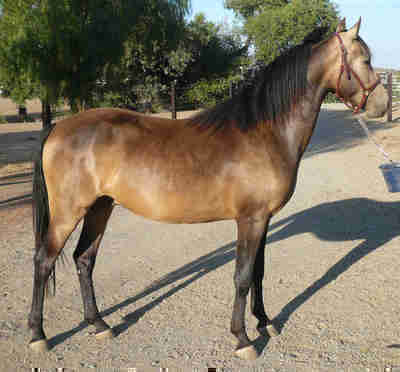 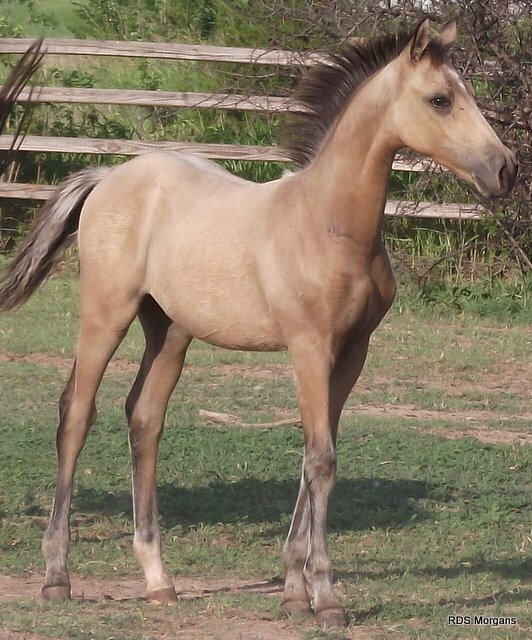 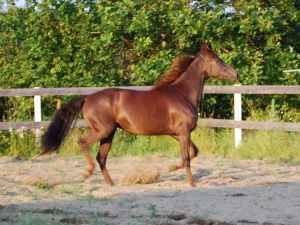 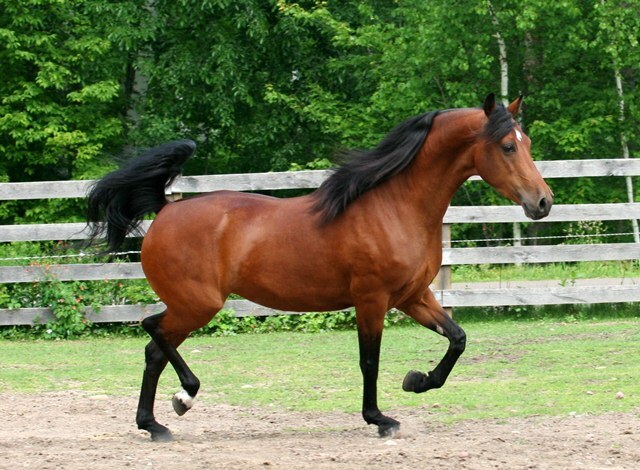 He was close to the Arab foundation, and consequently he was a short-legged, rounder built, more compact animal than the race horse of the nineteenth century. 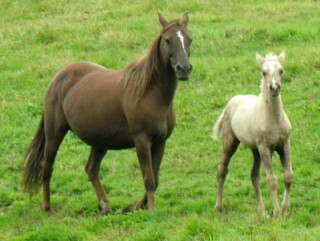 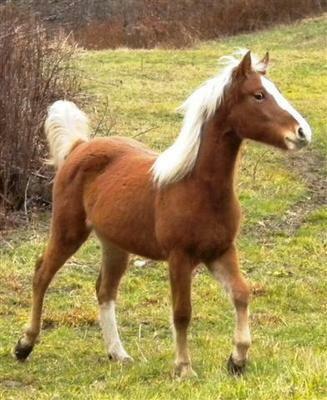 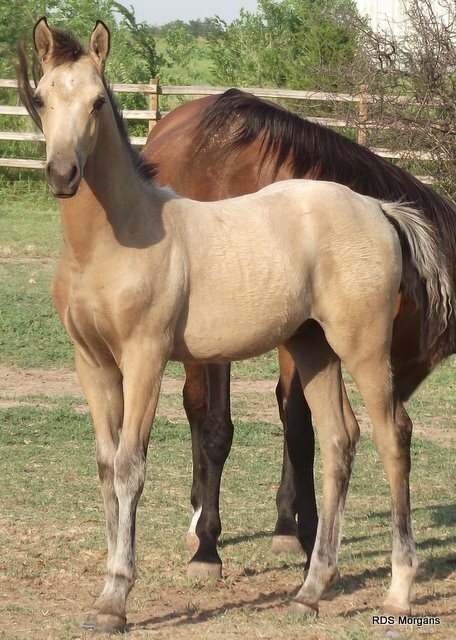 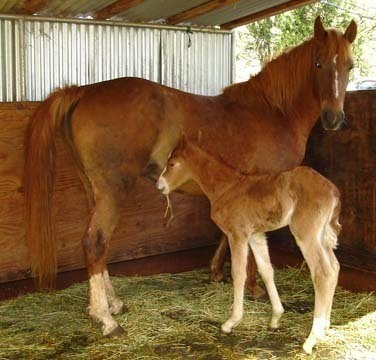 Such was the famous and beautiful Gimcrack, foaled in 1760. 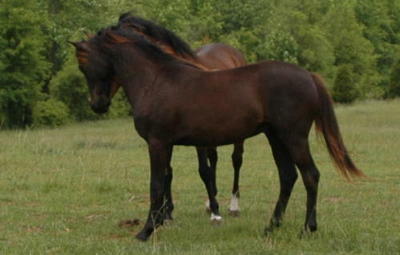 It is not surprising, therefore, that Justin Morgan, though well-bred, was a chunky little horse, with short legs and round quarters. 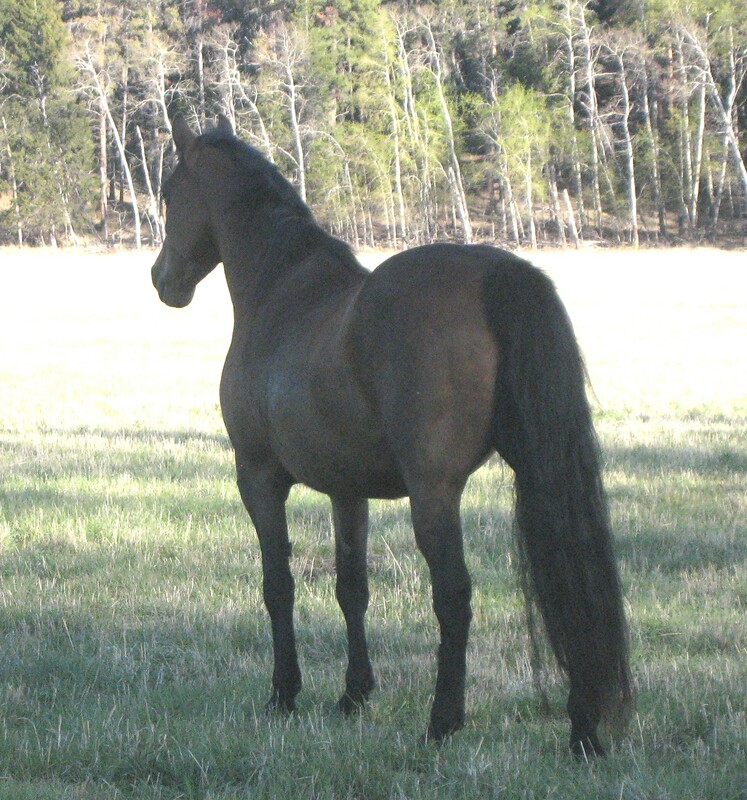 He had a fine mane and tail, a short, powerful back, a longish body, strong, oblique shoulders, a delicate ear, a noble head, and the most intelligent, expressive, and courageous eyes that the spirit of a Houyhnhnm ever looked out of. 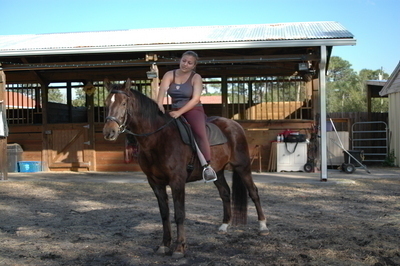 He stood fourteen hands only, and weighed about nine hundred pounds. 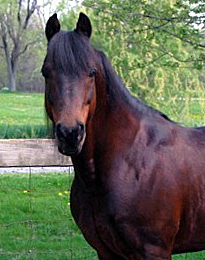 He was foaled in Springfield, Massachusetts, in 1793, and as a two year old he was taken in part payment of a debt by a school teacher named Justin Morgan, who brought him to Randolph, Vermont. 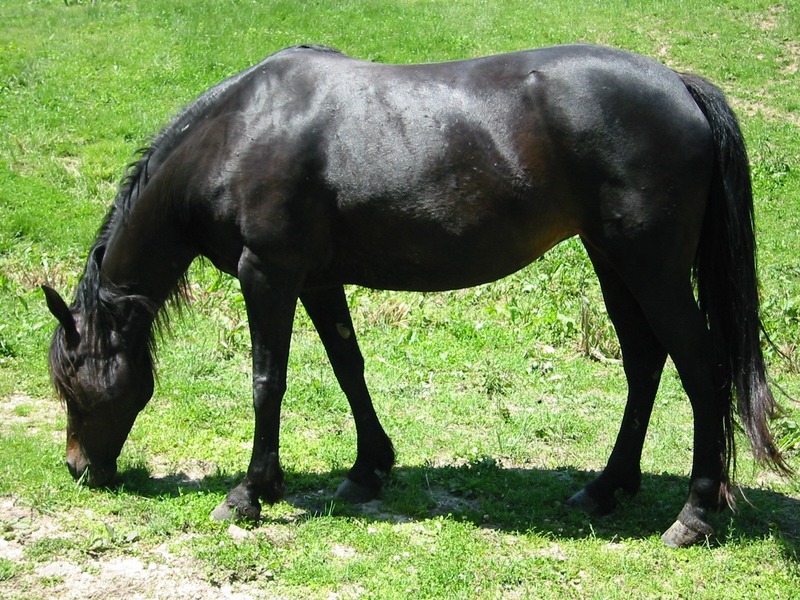 The horse died in 1821, near Chelsea, Vermont. 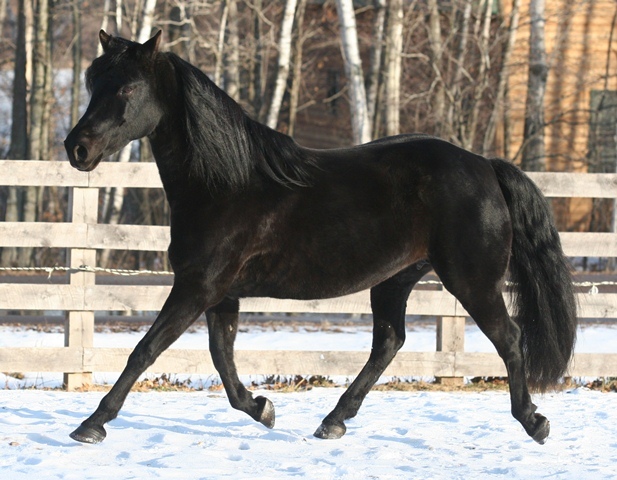 Justin Morgan was no trotter, and not till the third or fourth generation did a trotter arise in his family, but he was distinguished in three ways, as a draught horse, as a short-distance runner, and as a military charger or parade horse. 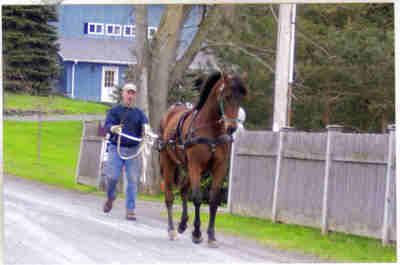 In his day there were no race courses and no stated races in Vermont; but when the sporting element gathered at a tavern on a spring or summer evening, they were wont to amuse themselves by running their horses on the level road in front of the tavern, the prize being a gallon of rum, and in these races Justin Morgan is said never to have been beaten . 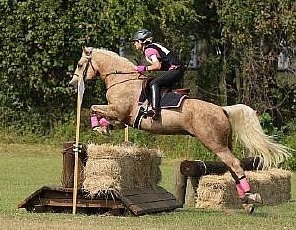 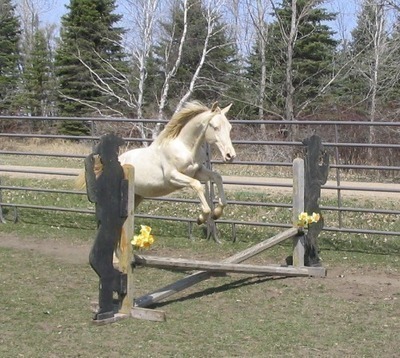 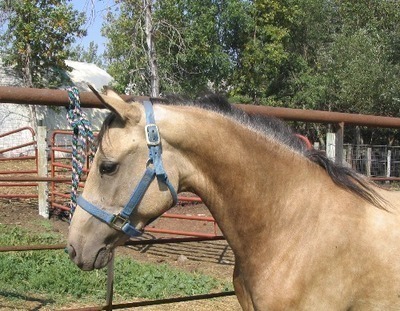 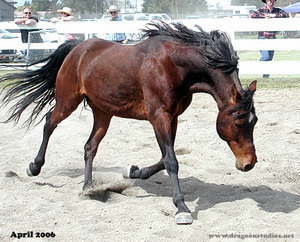 On the same occasions a contest would often be had in pulling logs; and when the other horses concerned had done their best, it was the custom of Justin Morgan’s owner to hitch him to the heaviest log that had been stirred, them jump on himself, and the little horse never failed to move the load. 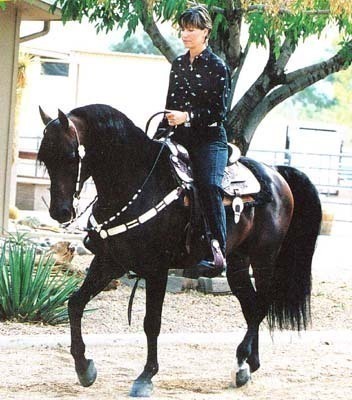 When ridden at a muster, his proud carriage made him the cynosure of all eyes; and he was so intelligent and tractable that women could ride him. 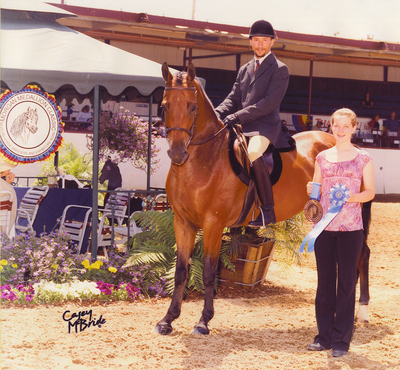 In fine, Justin Morgan was an animal of extraordinary utility and style. 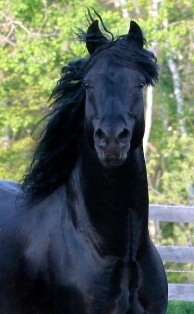 To an extraordinary extent, also, he stamped his image and impressed his qualities upon his descendants. 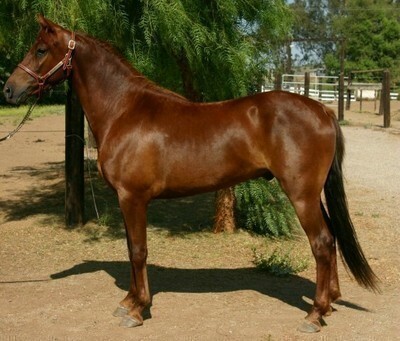 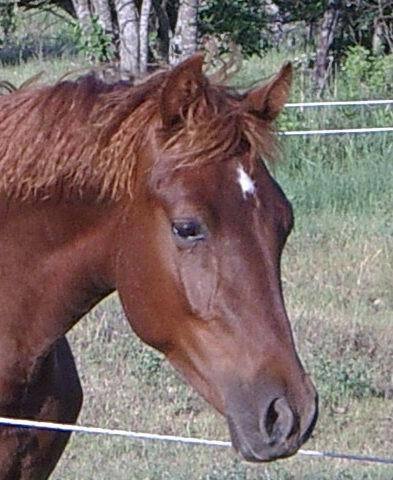 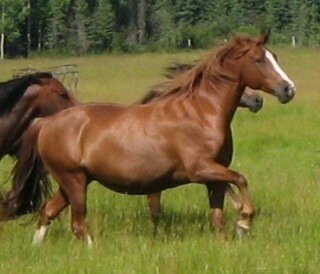 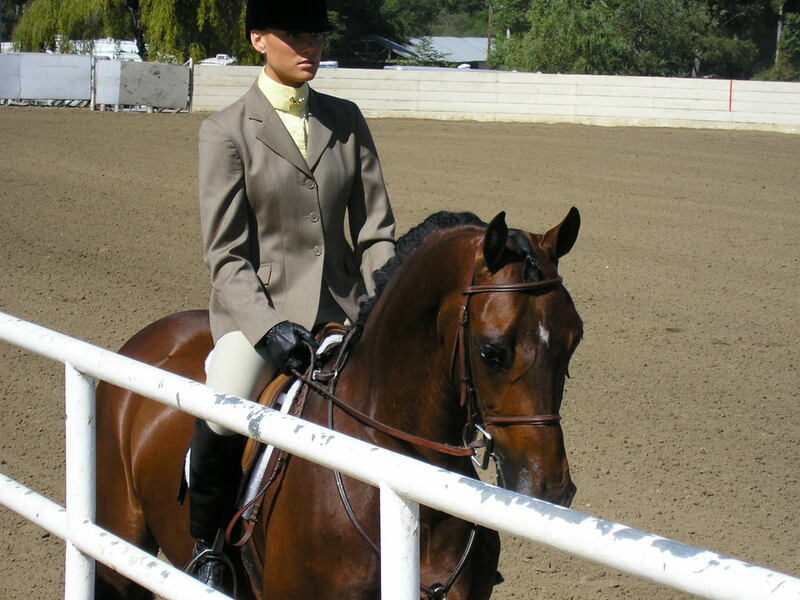 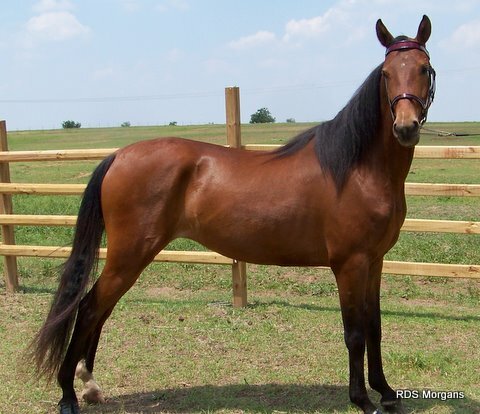 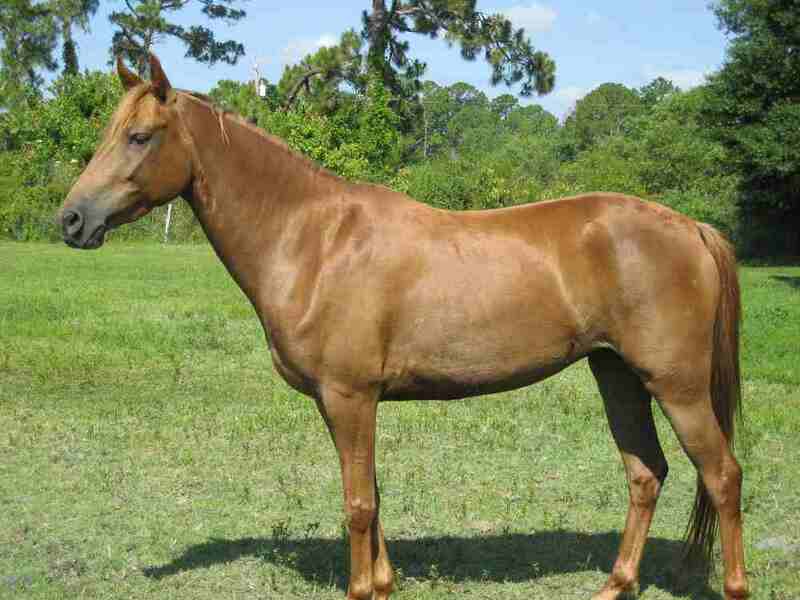 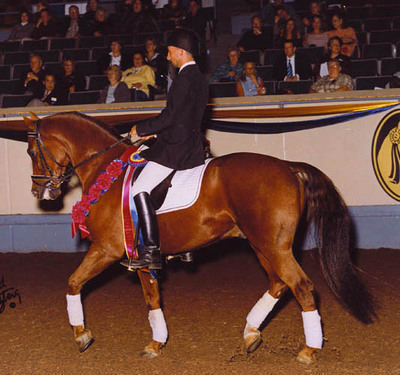 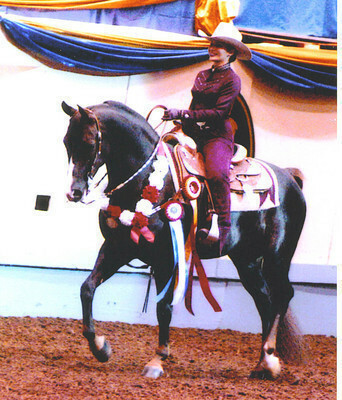 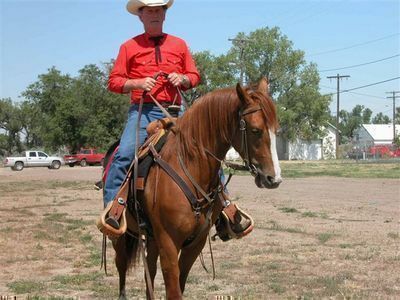 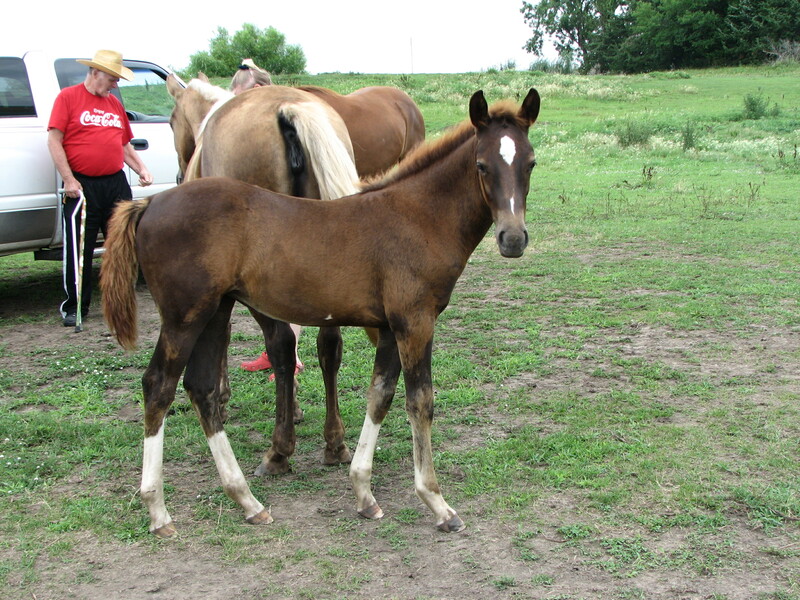 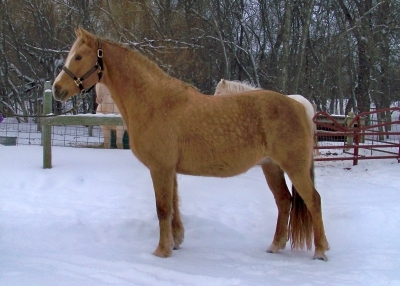 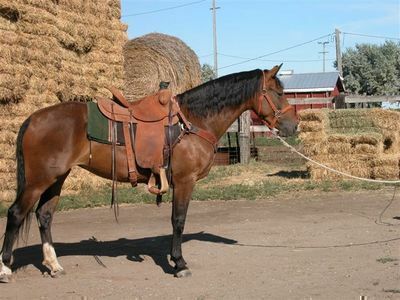 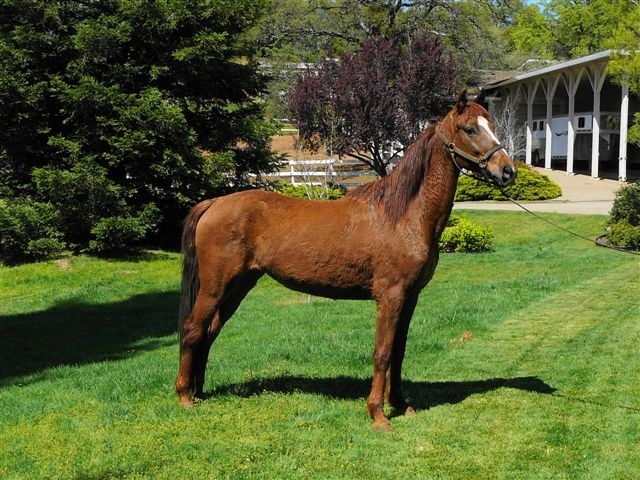 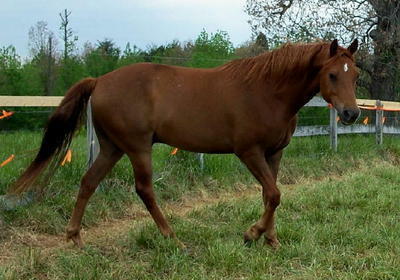 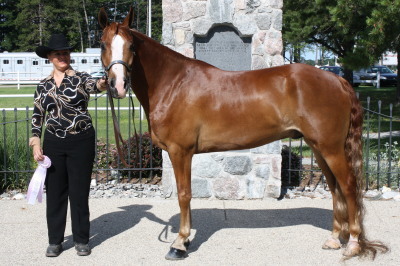 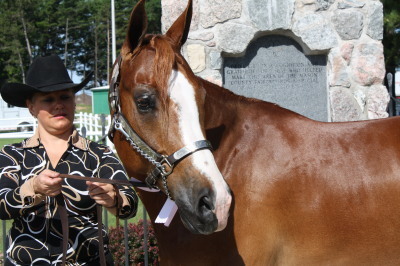 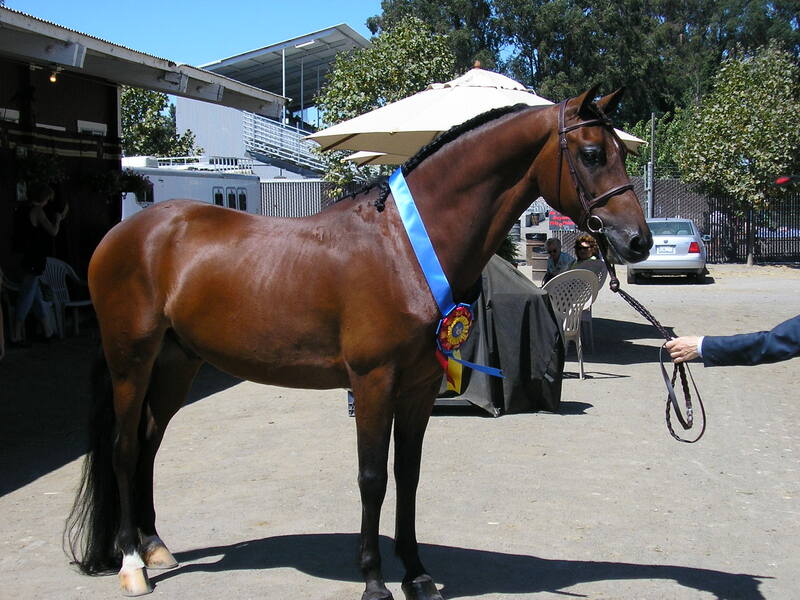 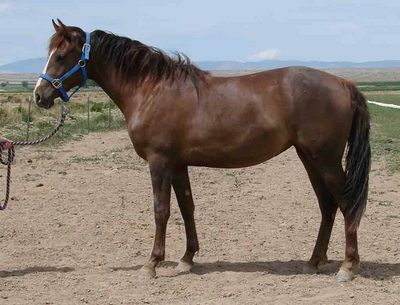 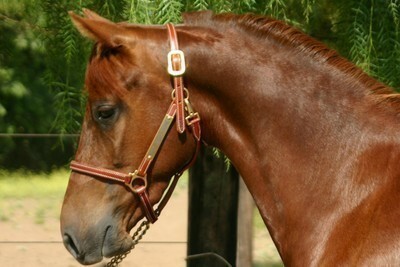 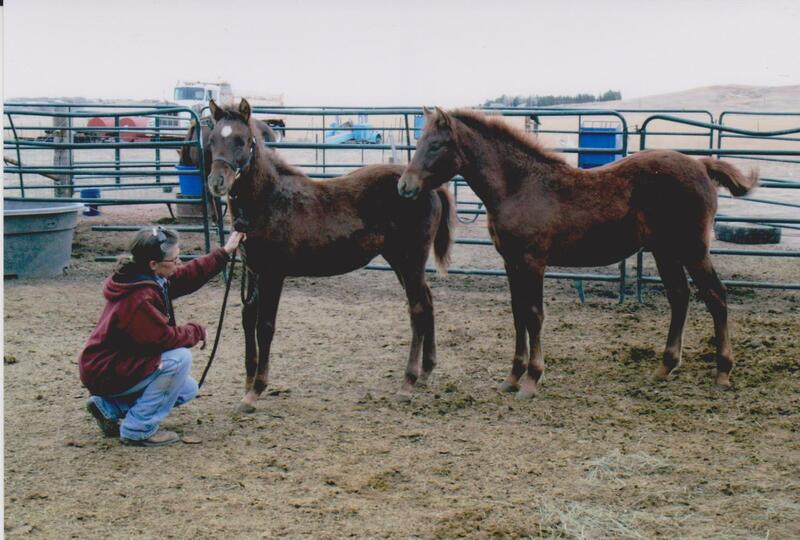 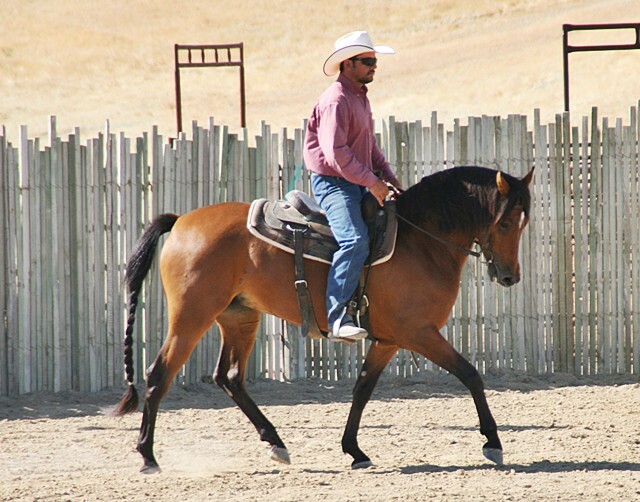 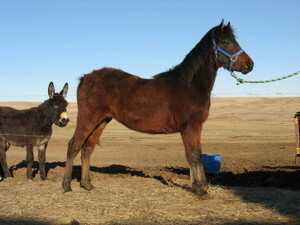 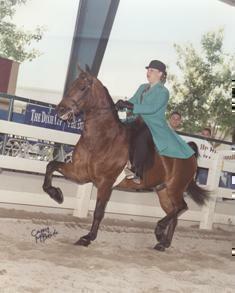 Justin Morgan’s finest son was Sherman, whose dam was a small but highly bred chestnut mare. 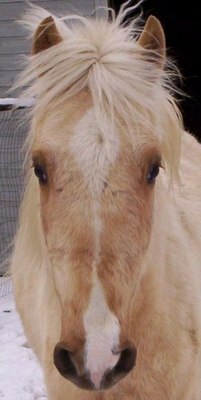 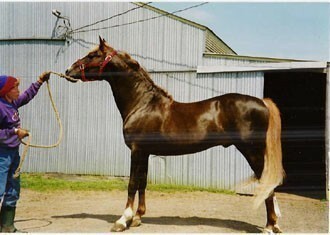 Sherman himself, a bright chestnut in color, stood no taller than a pony, for he measured nly 13 3/4 hands. 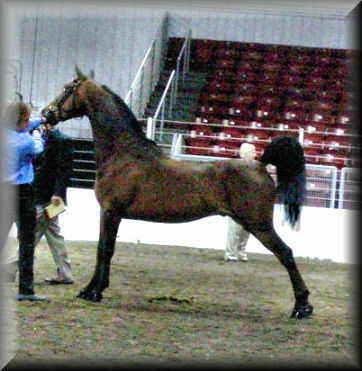 He weighed, however, 925 pounds. 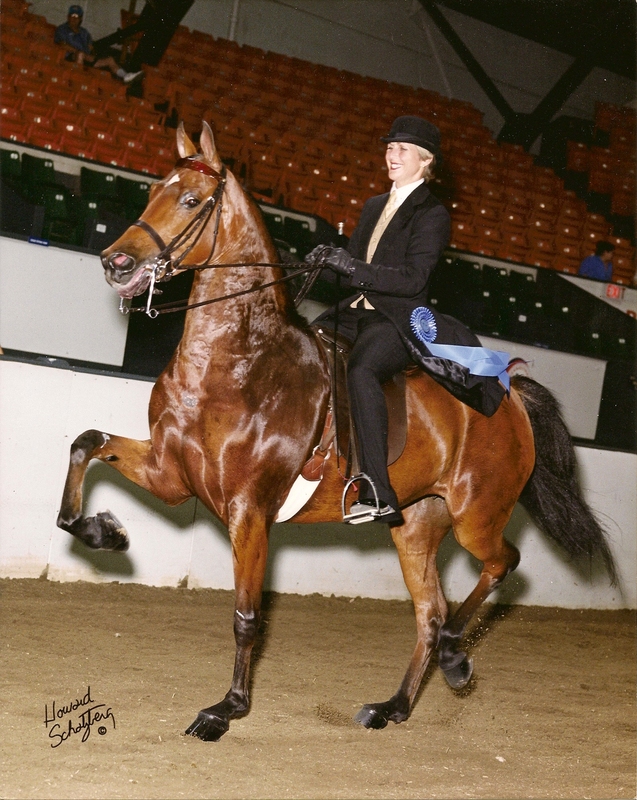 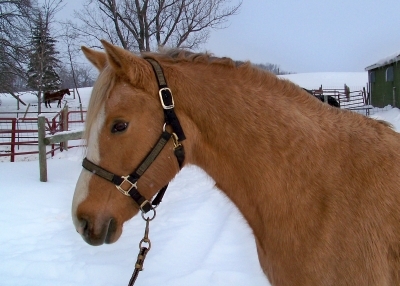 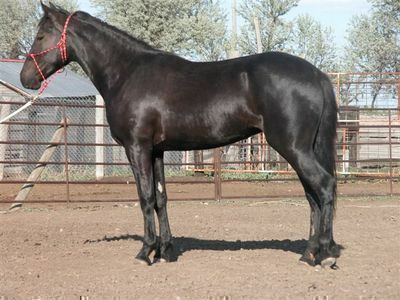 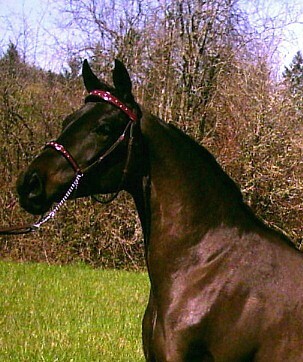 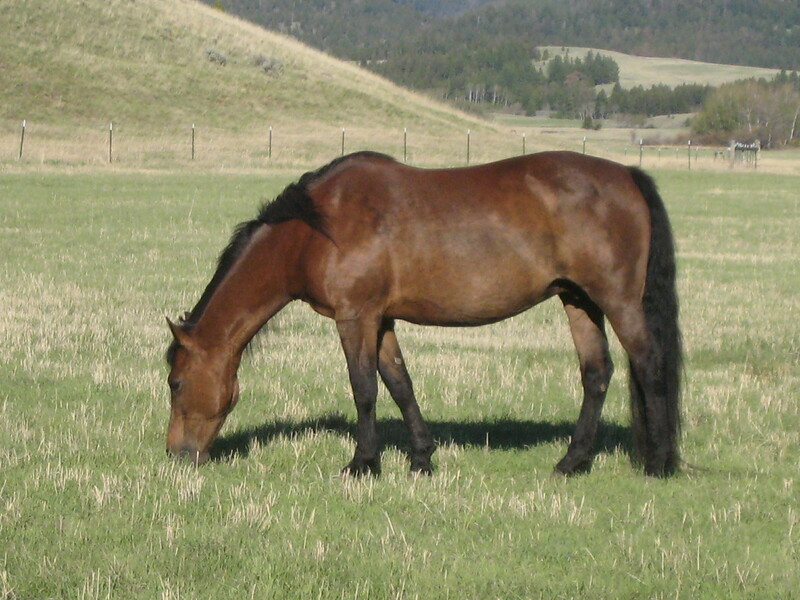 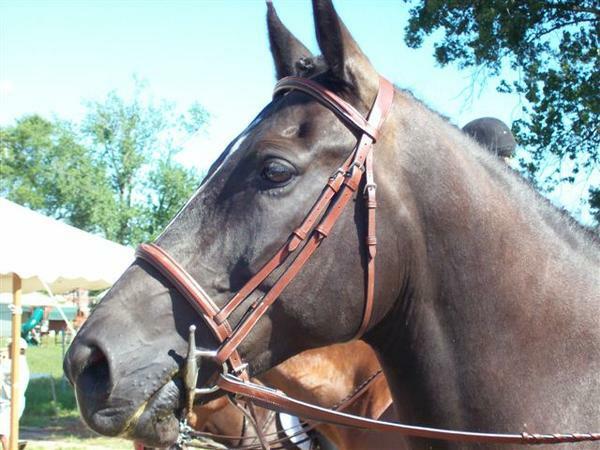 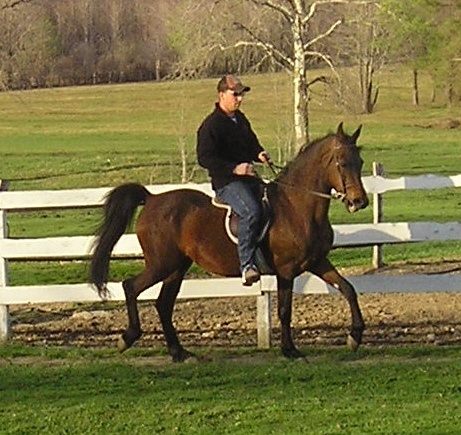 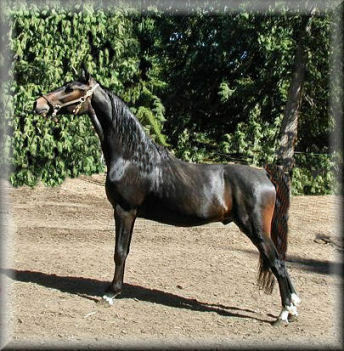 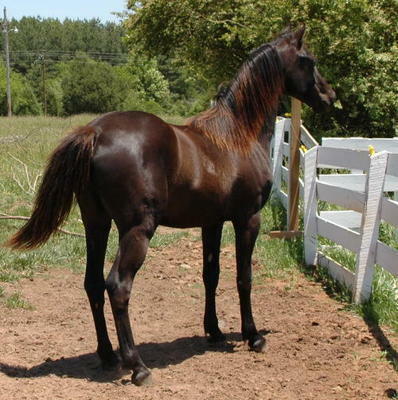 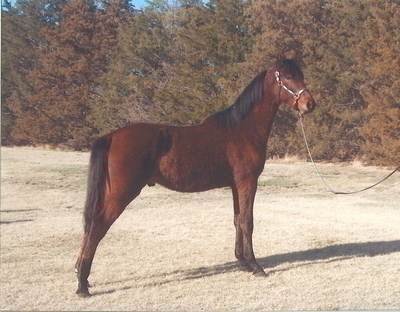 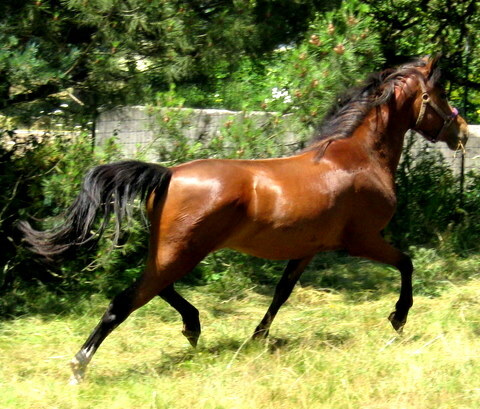 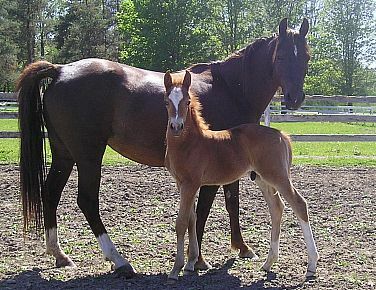 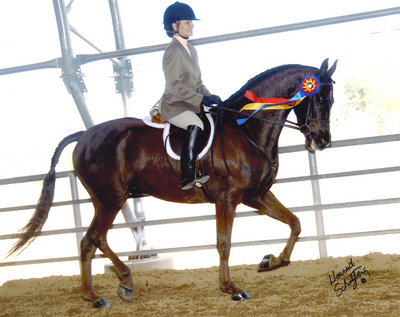 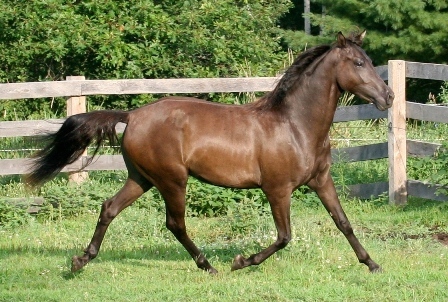 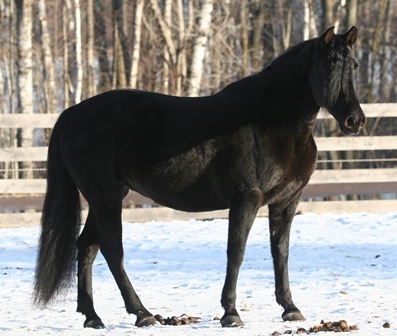 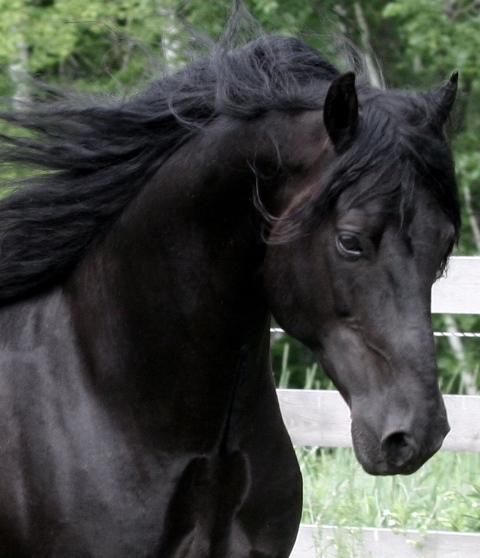 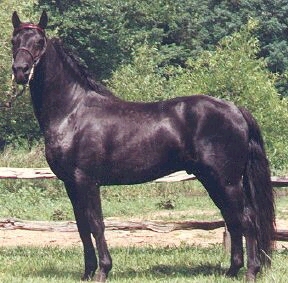 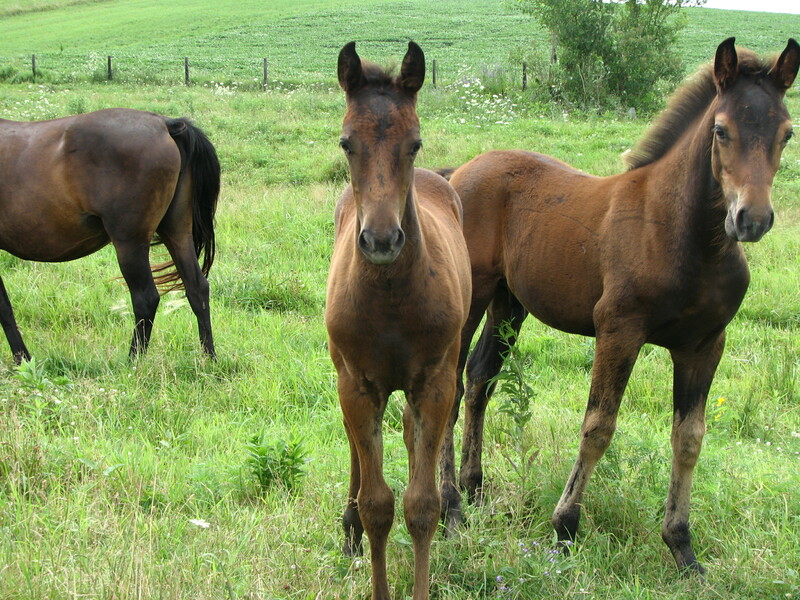 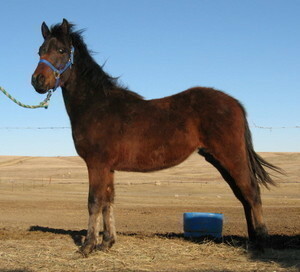 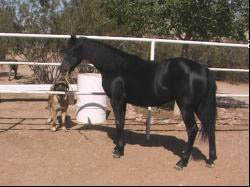 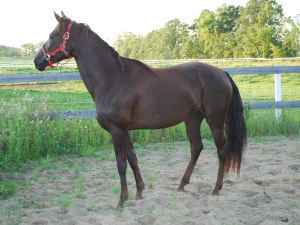 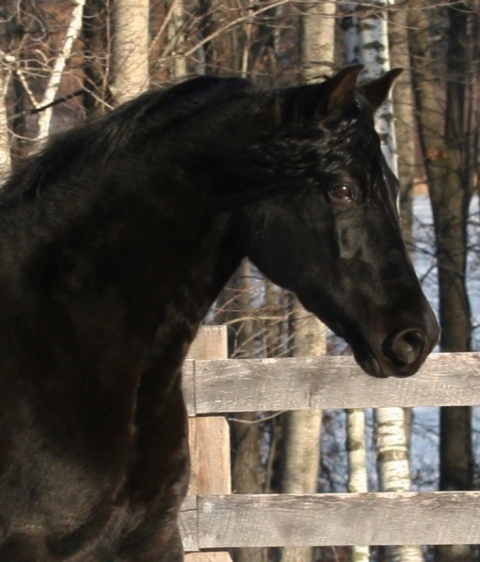 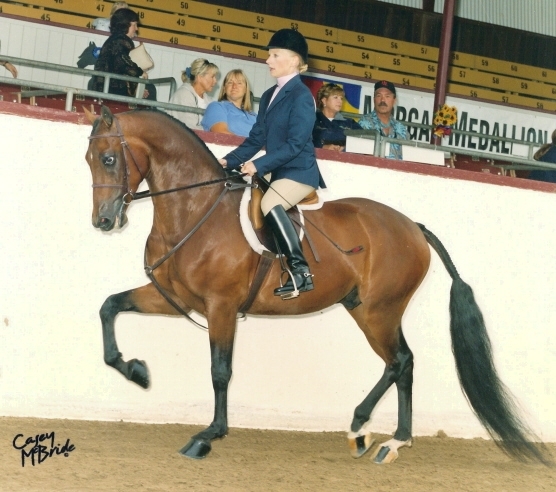 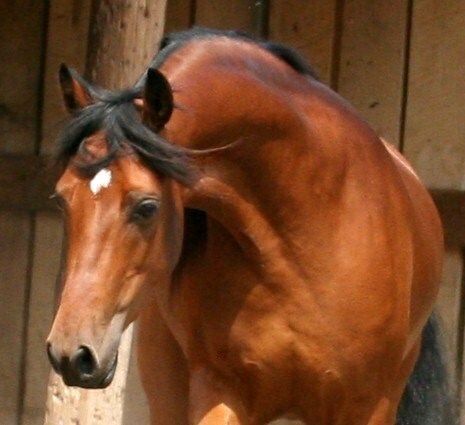 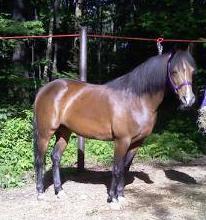 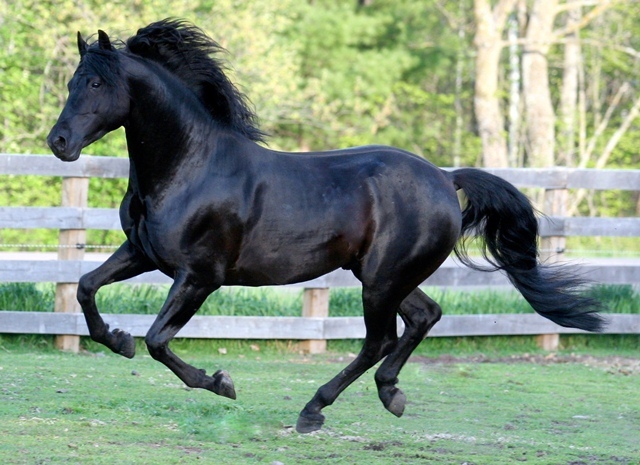 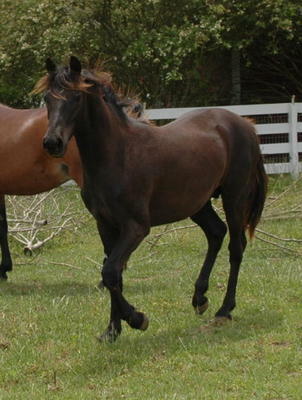 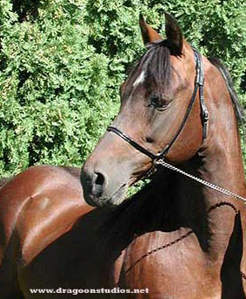 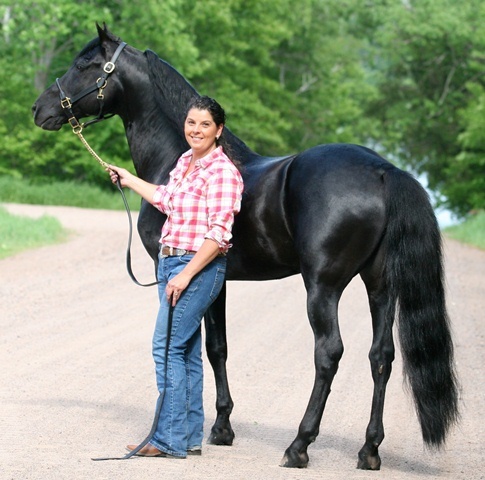 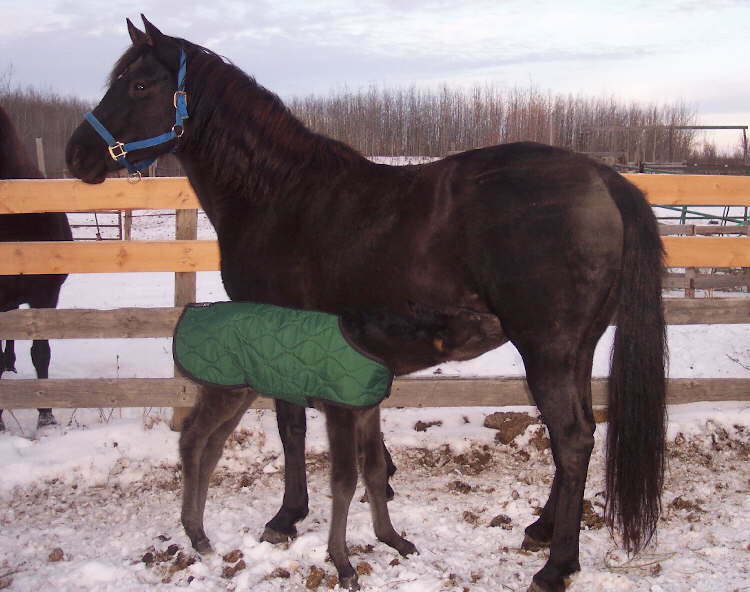 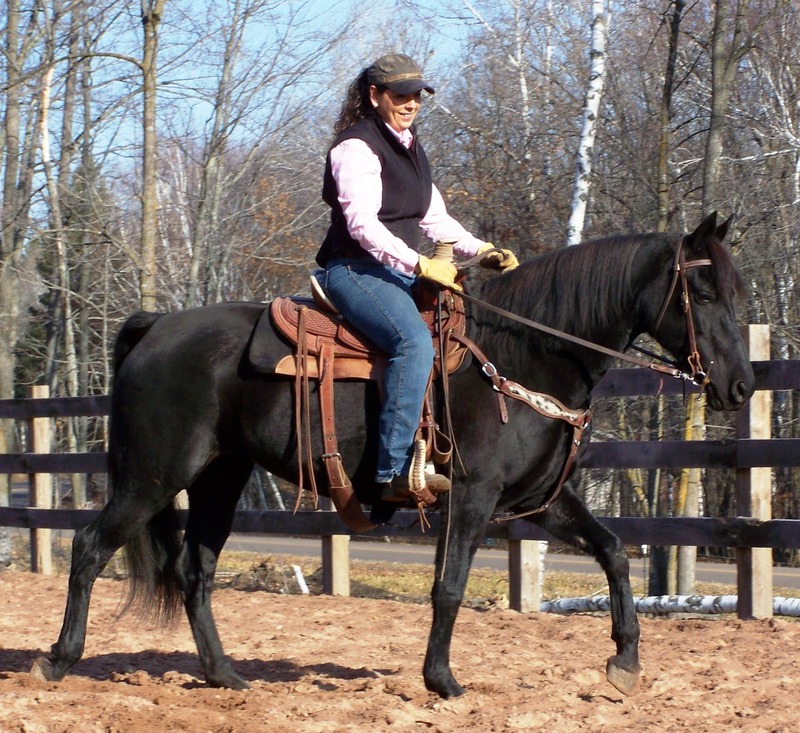 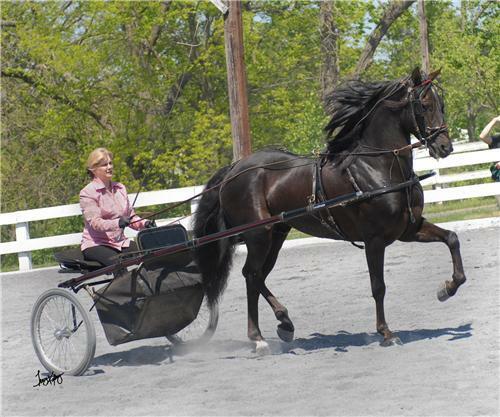 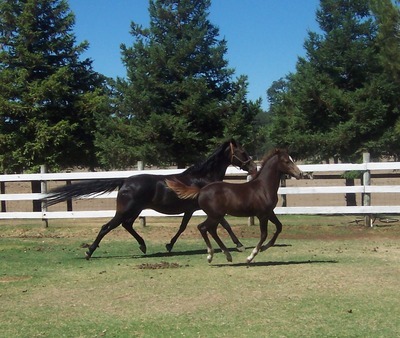 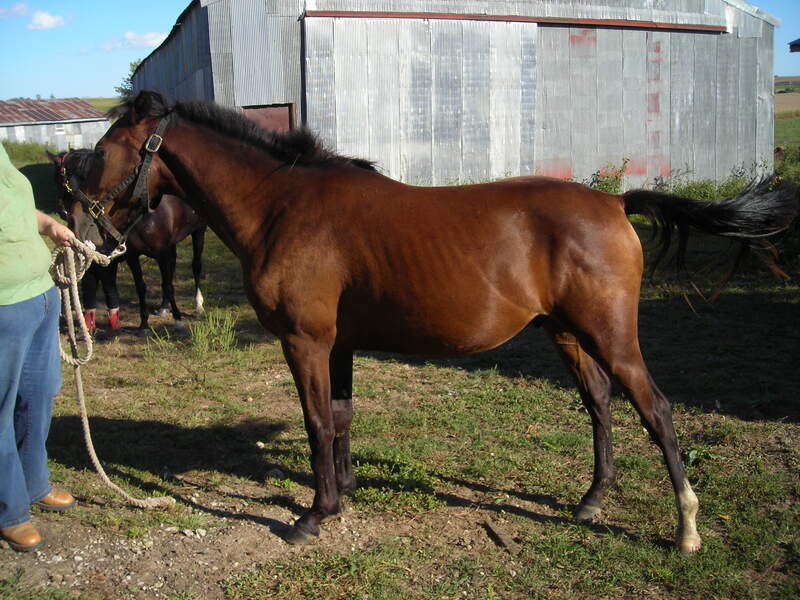 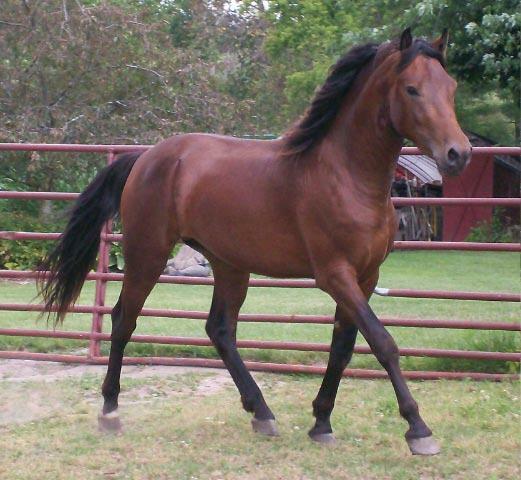 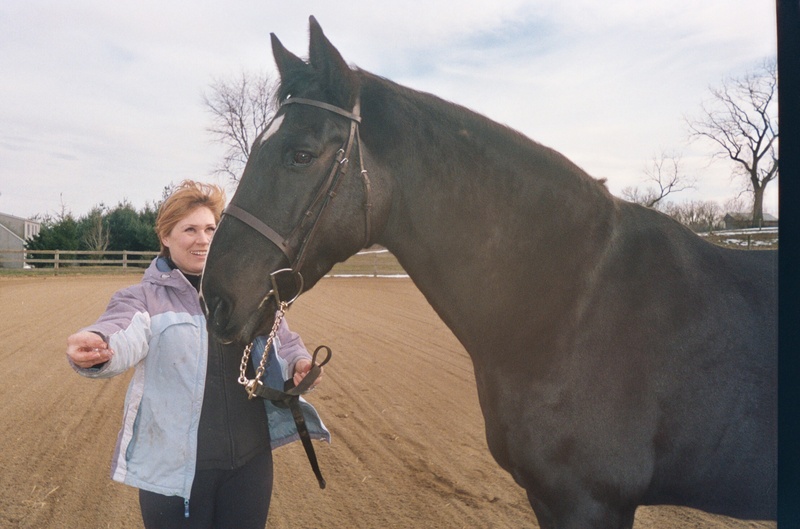 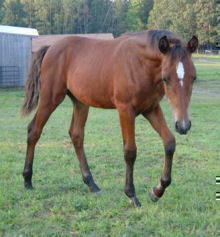 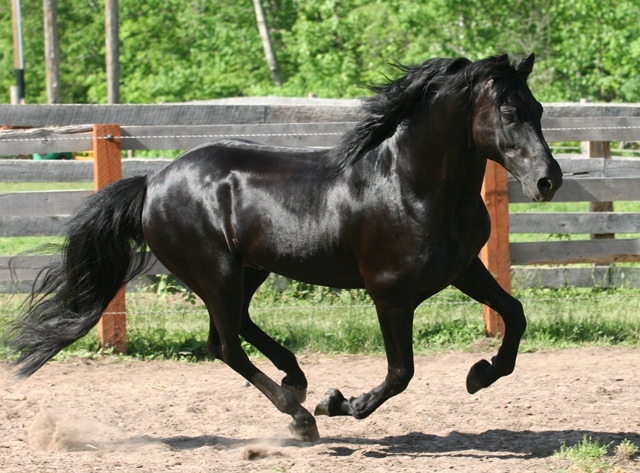 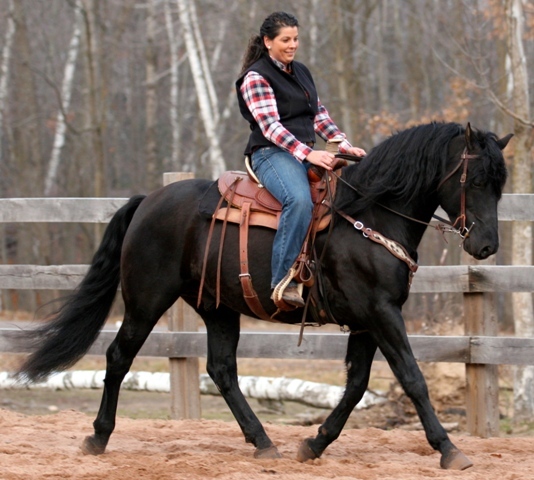 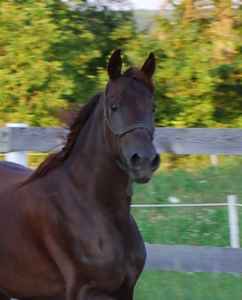 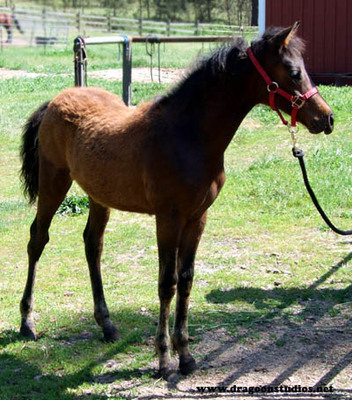 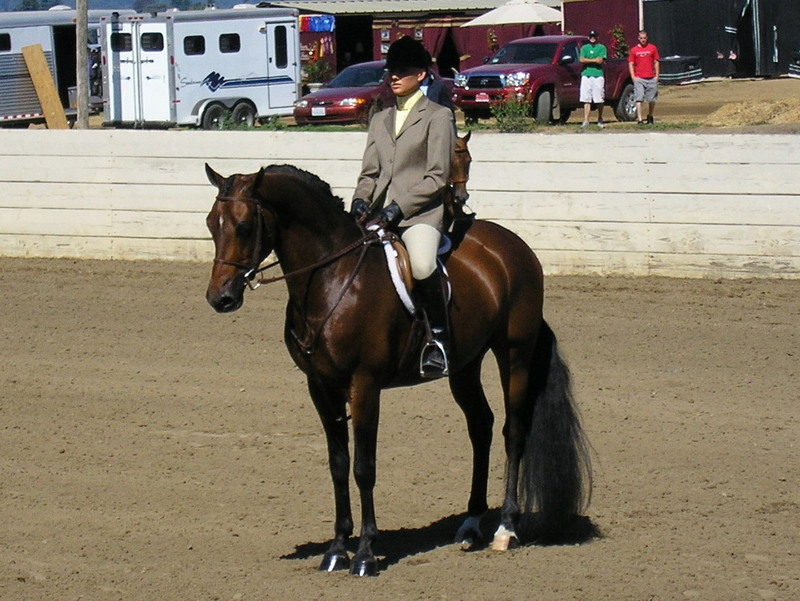 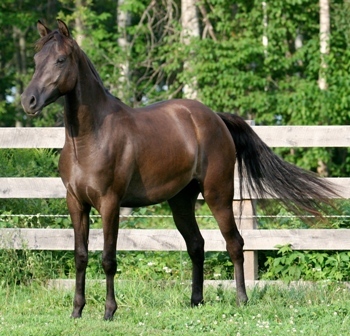 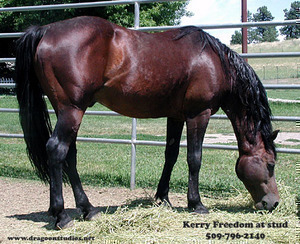 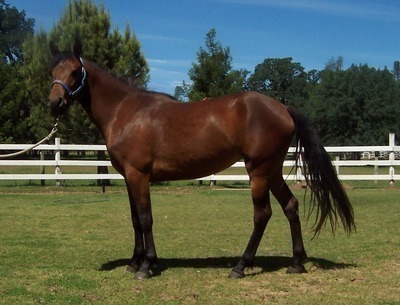 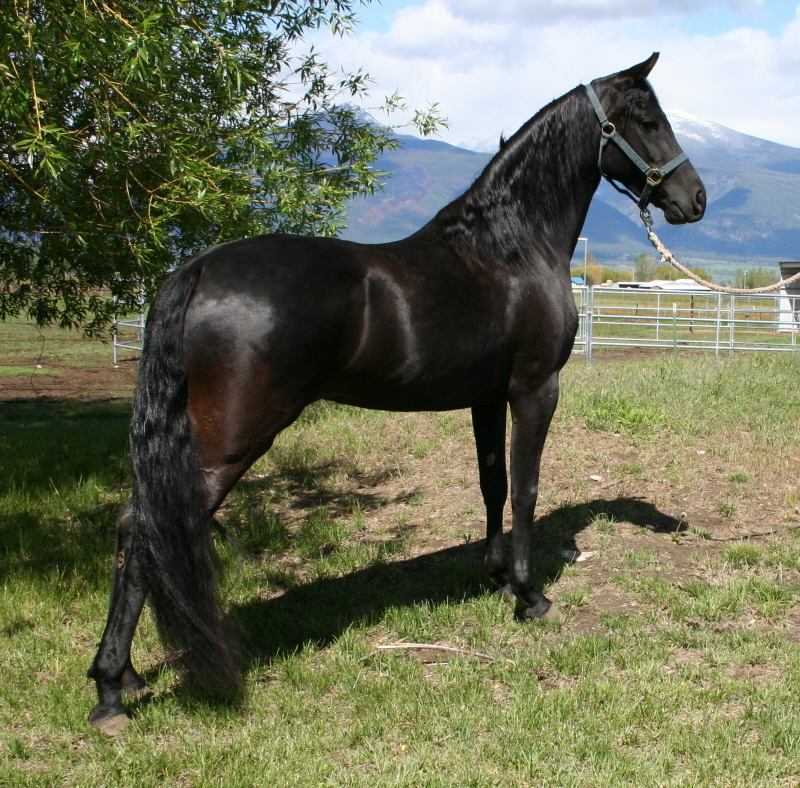 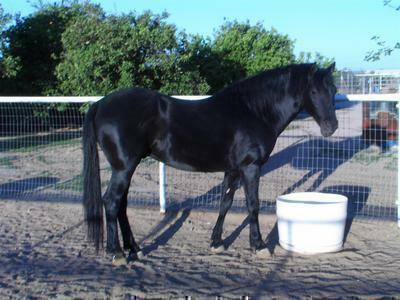 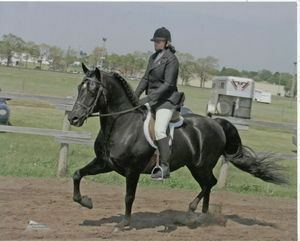 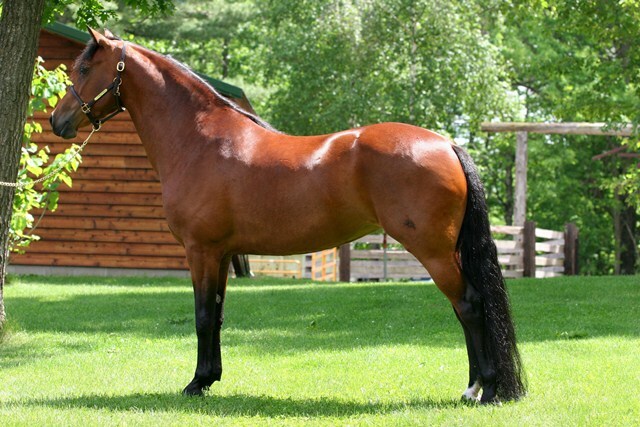 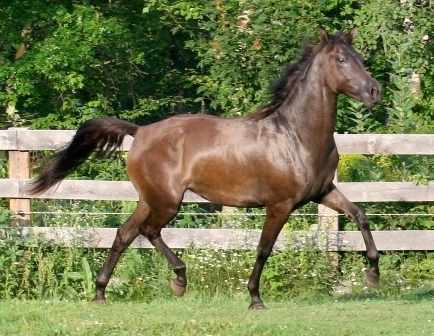 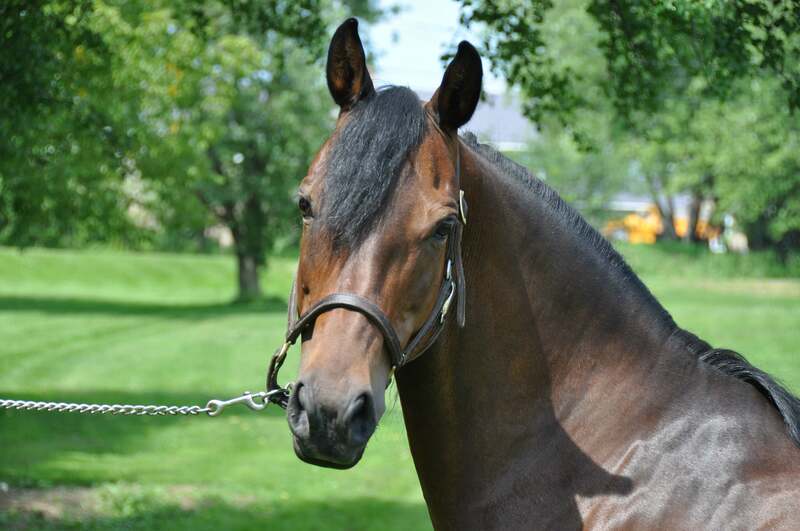 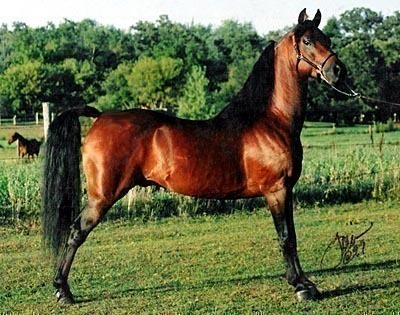 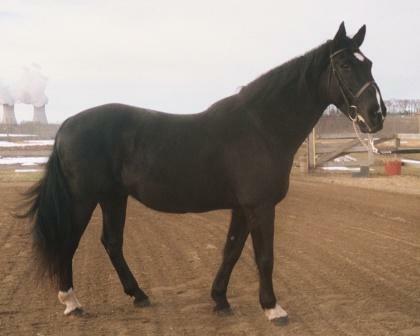 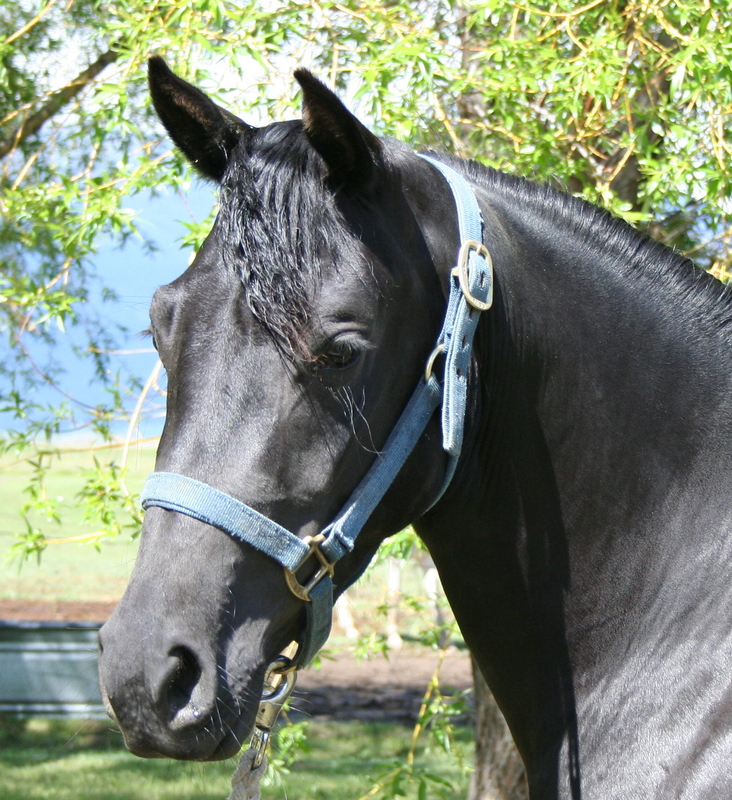 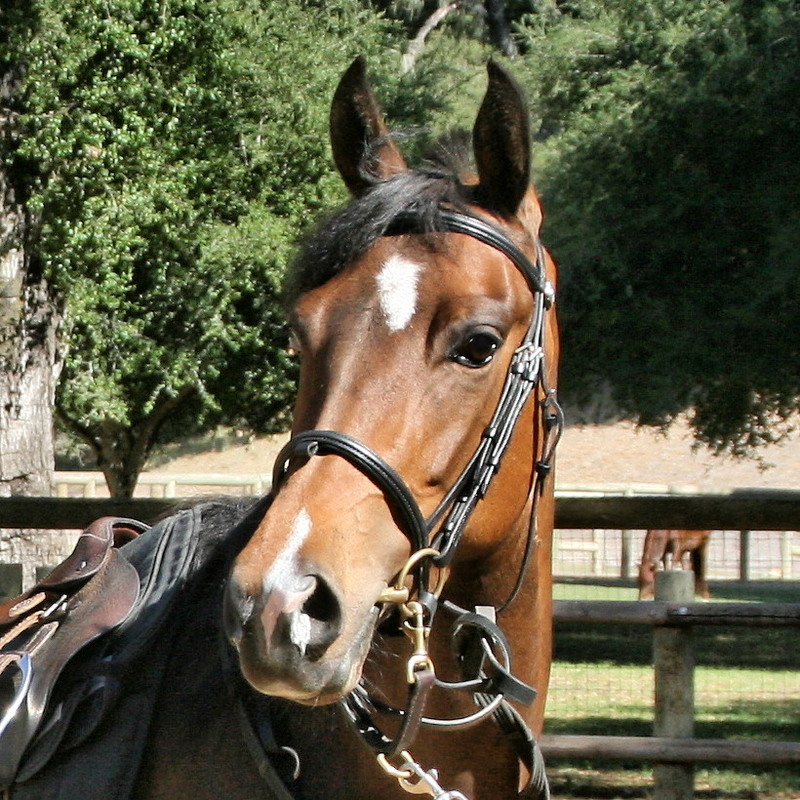 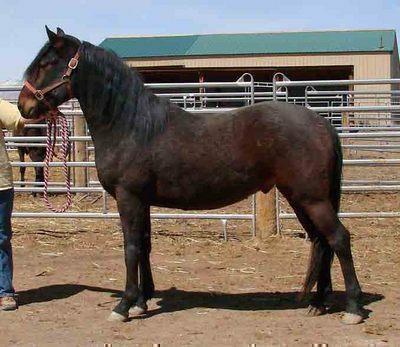 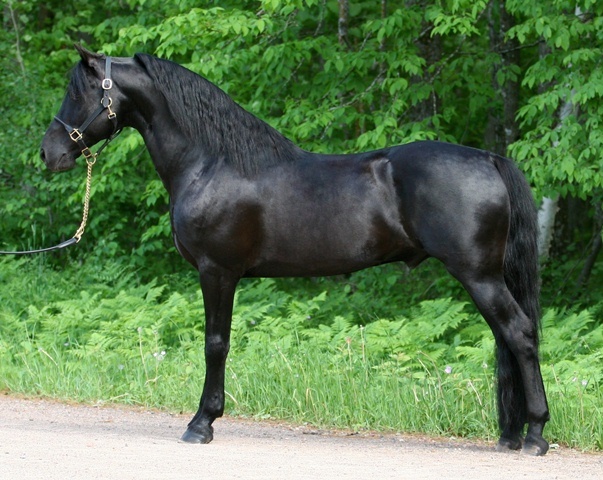 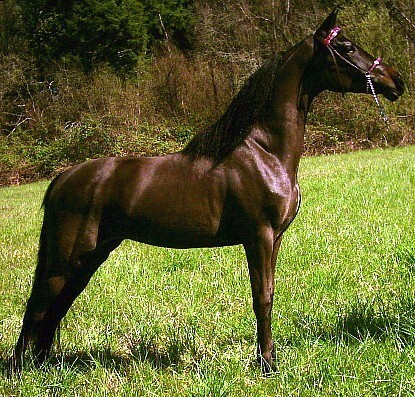 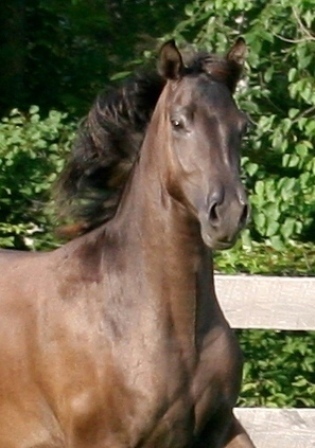 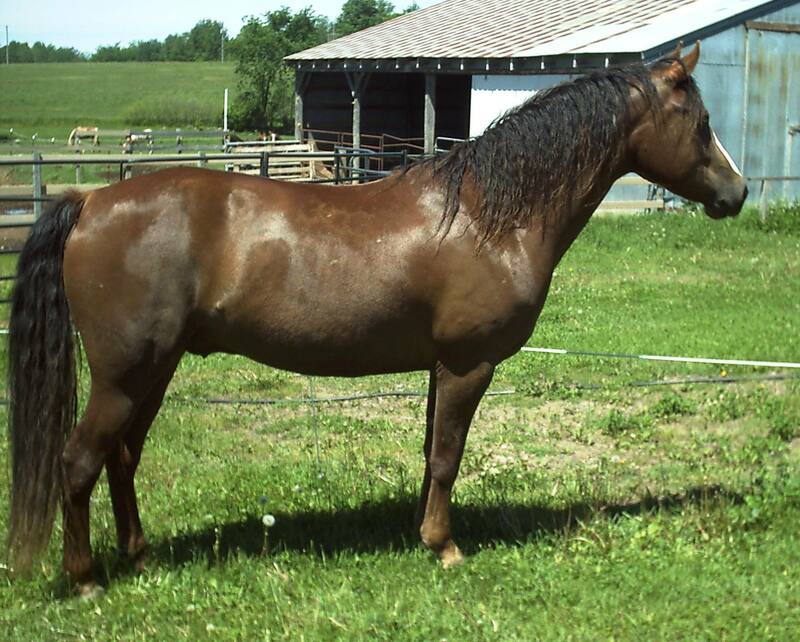 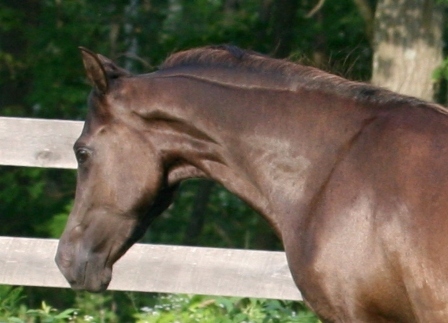 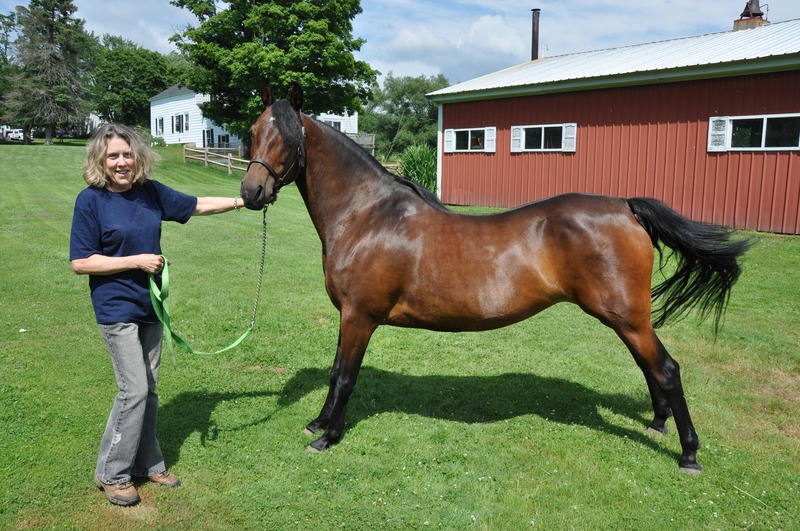 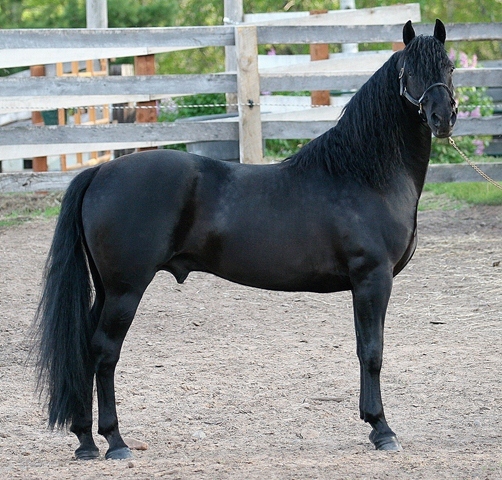 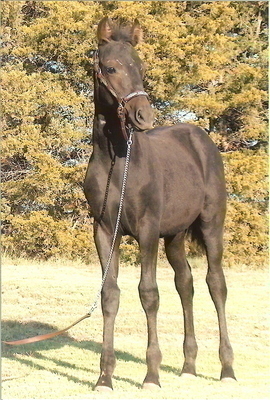 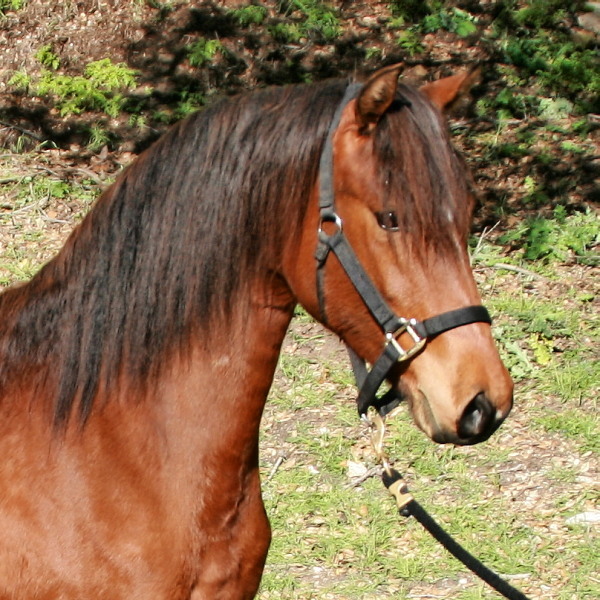 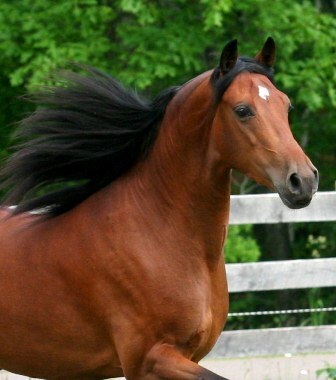 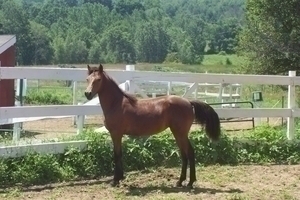 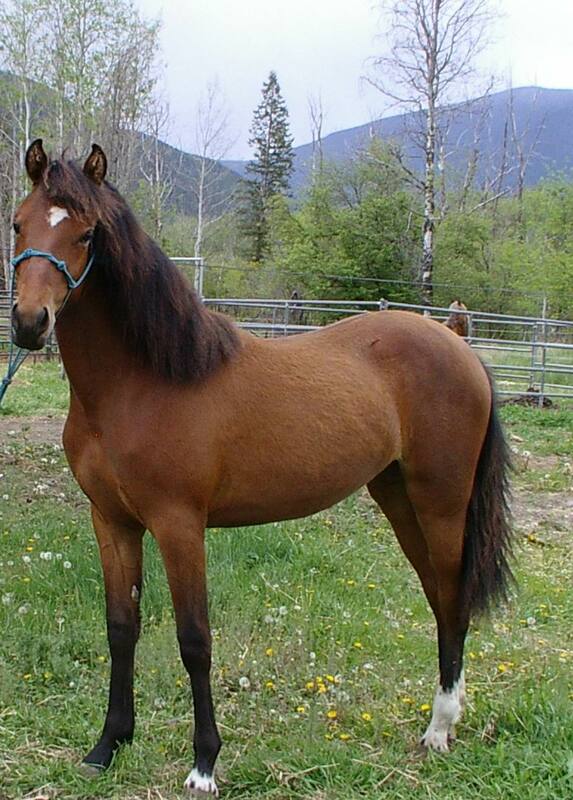 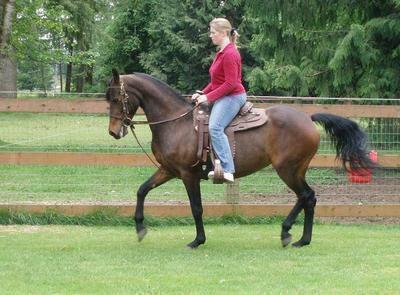 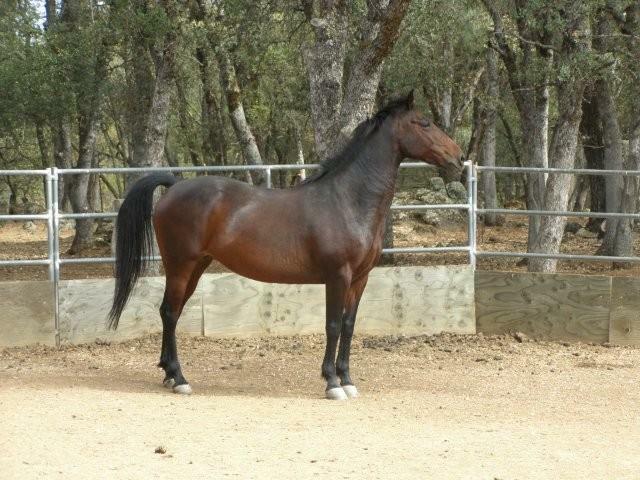 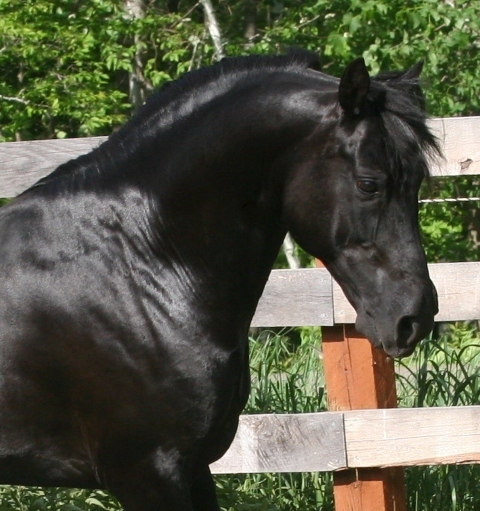 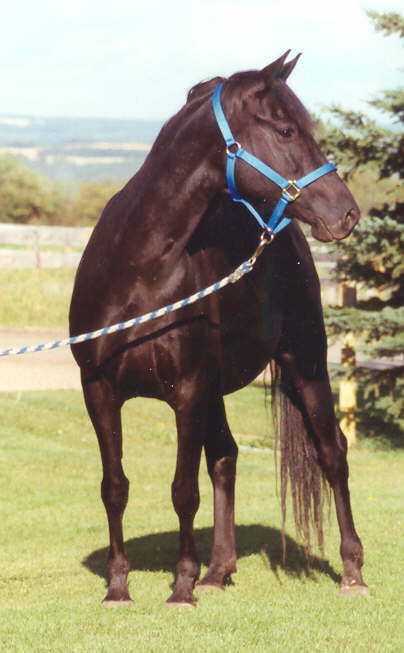 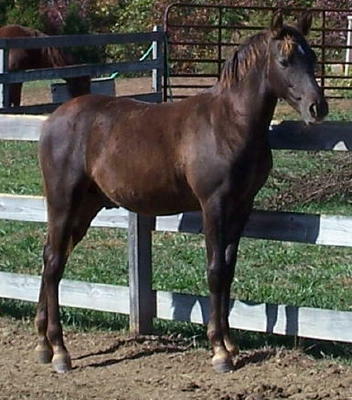 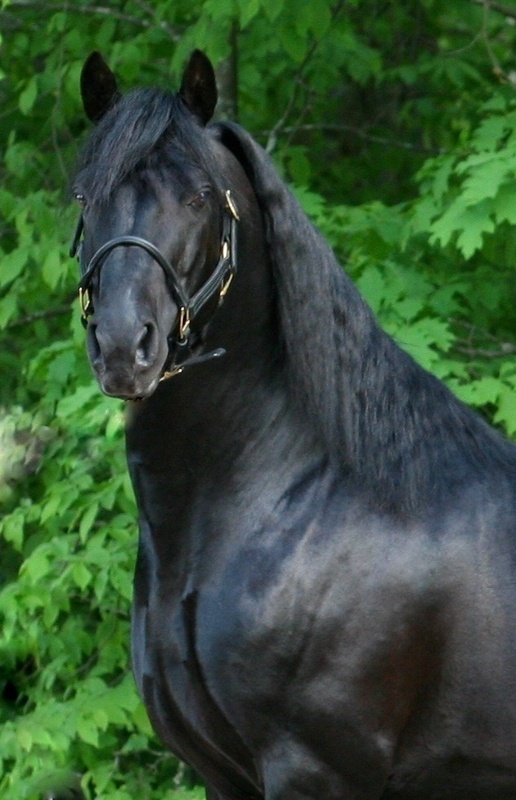 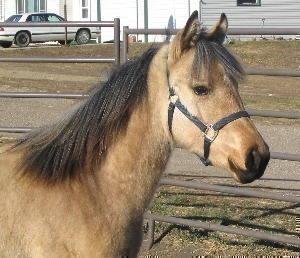 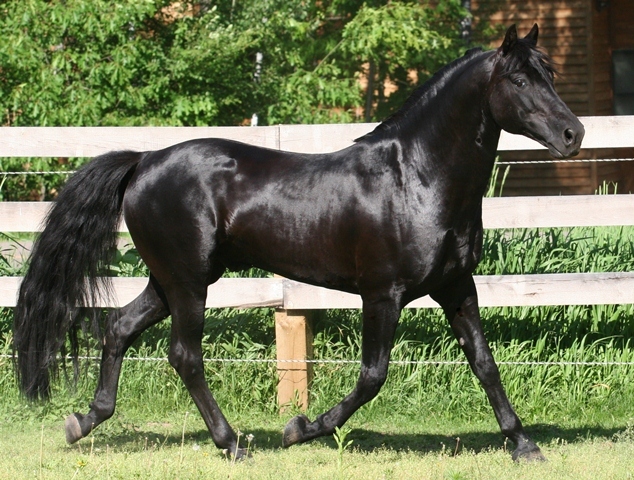 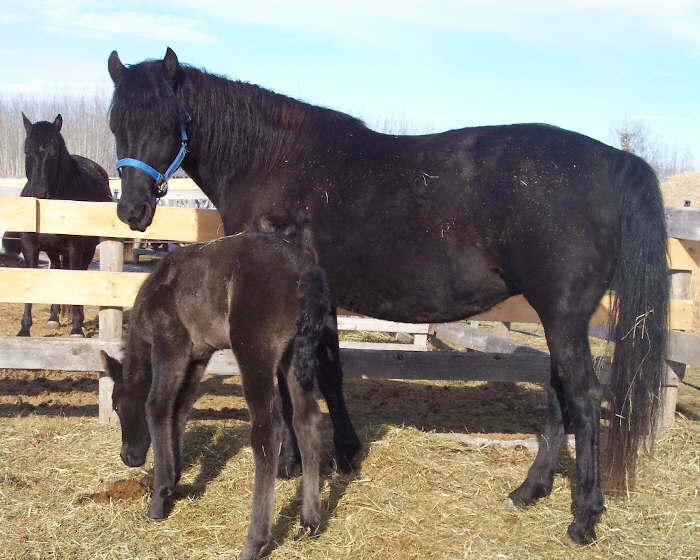 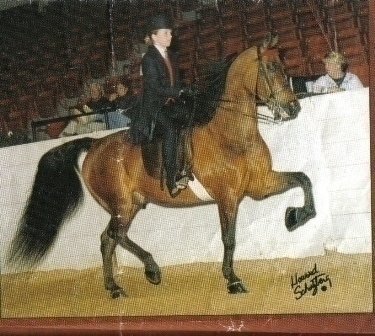 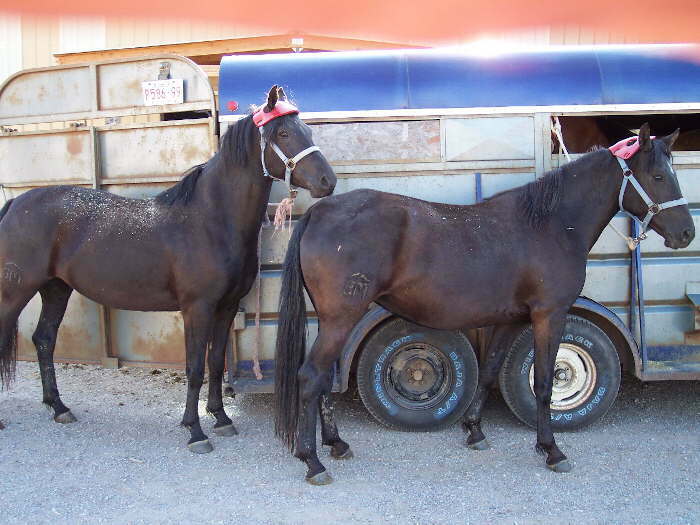 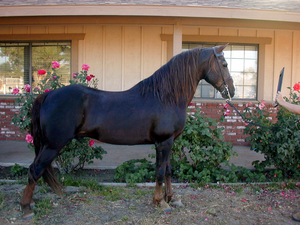 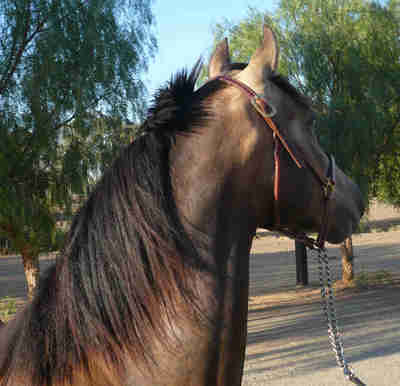 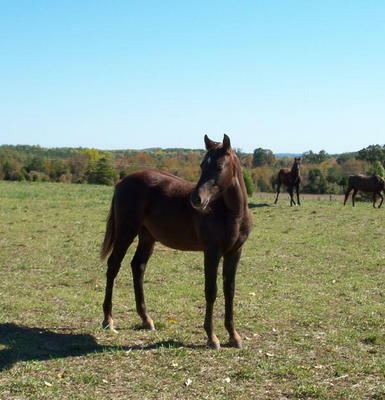 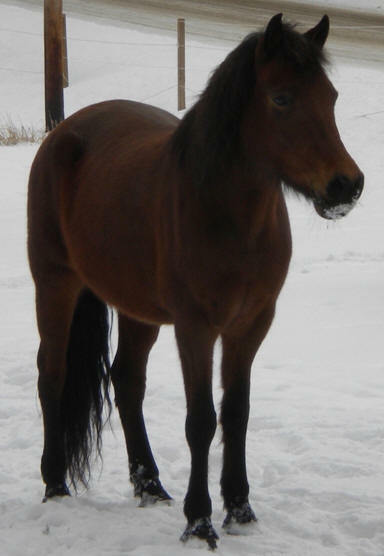 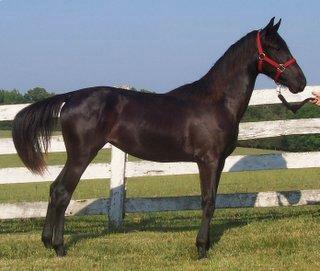 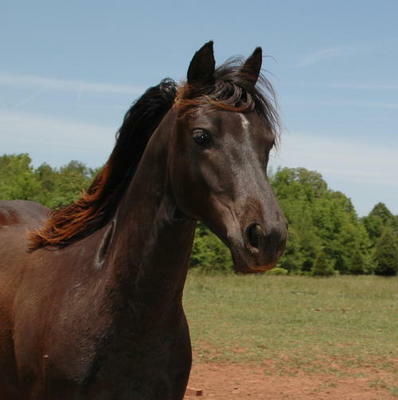 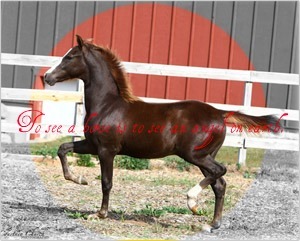 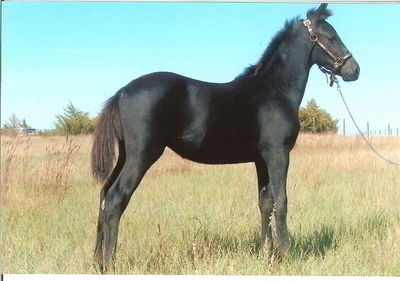 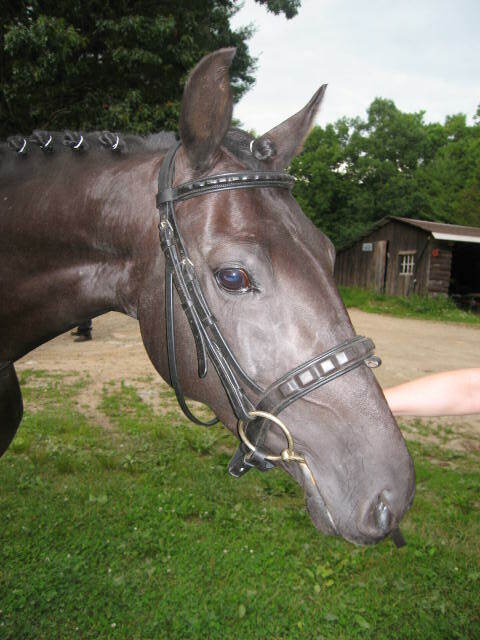 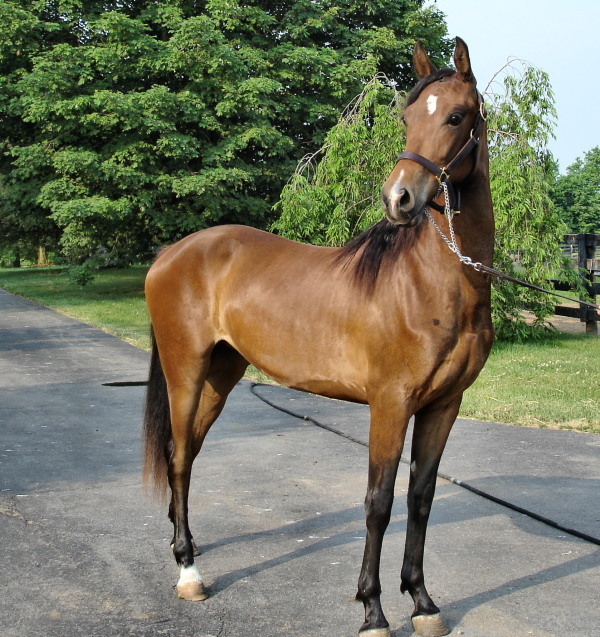 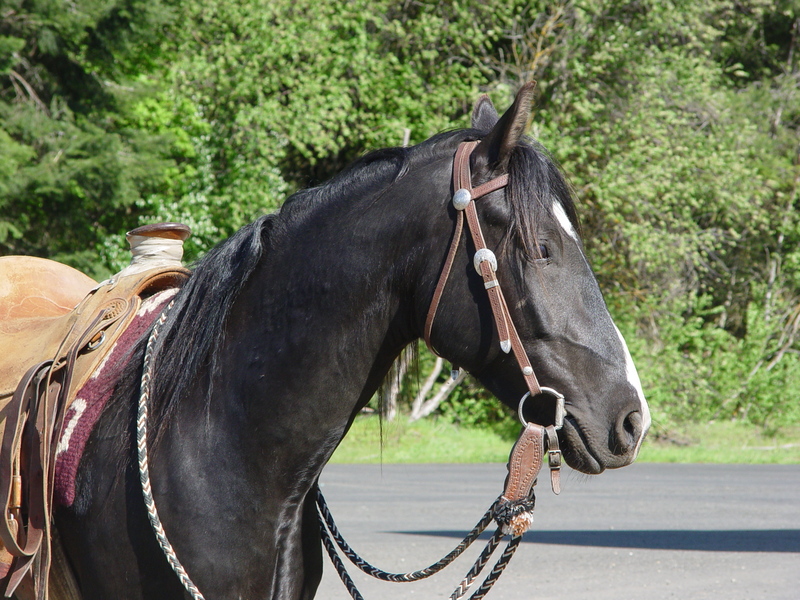 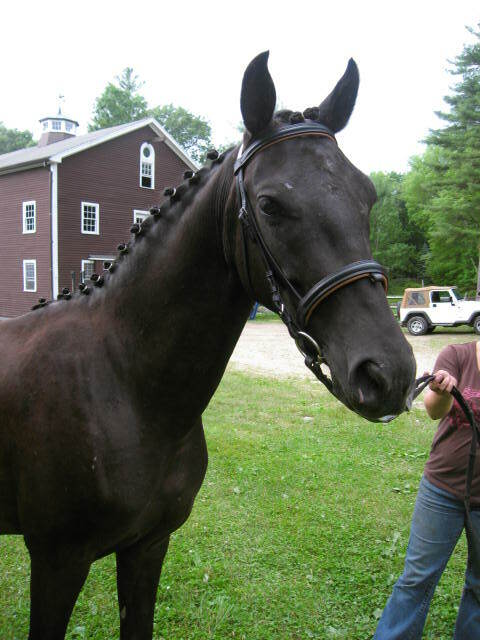 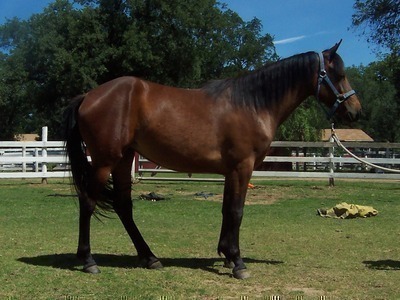 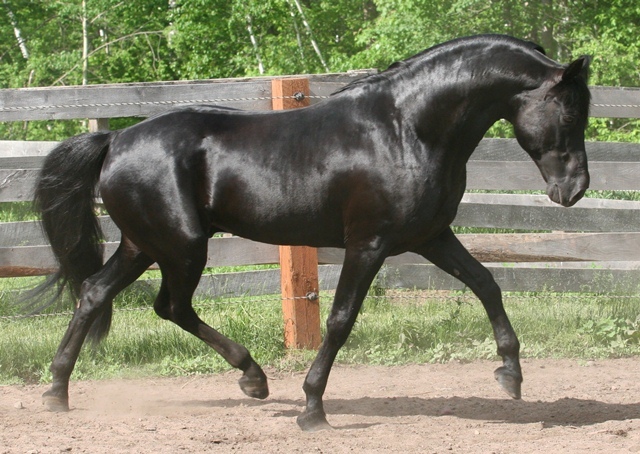 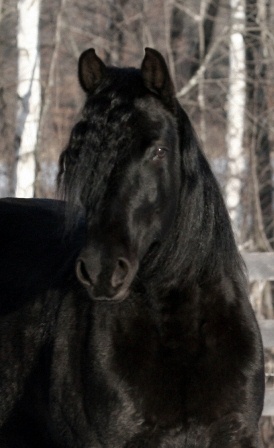 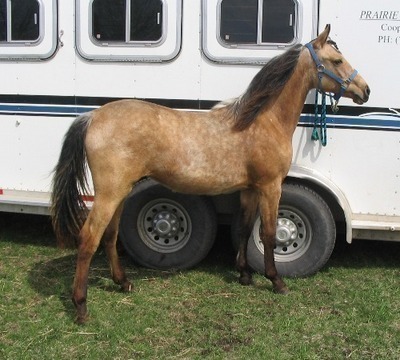 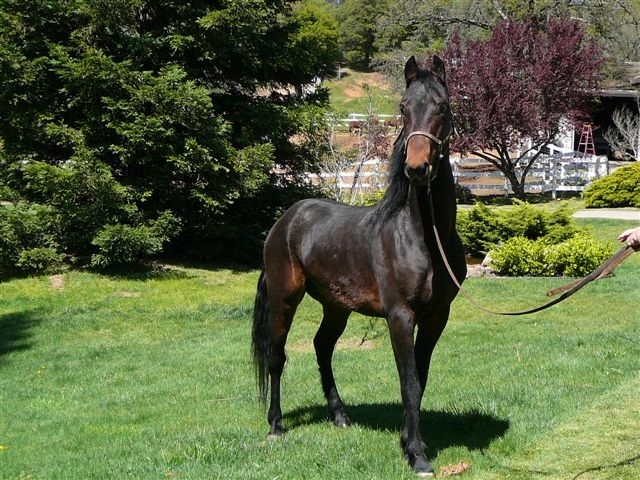 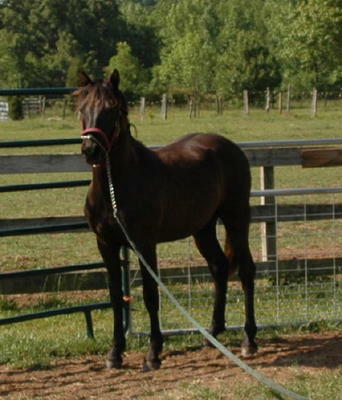 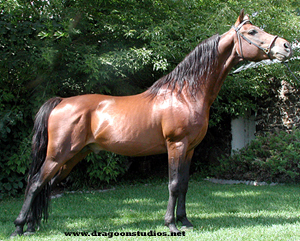 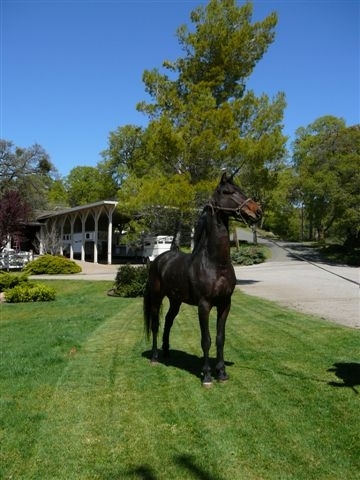 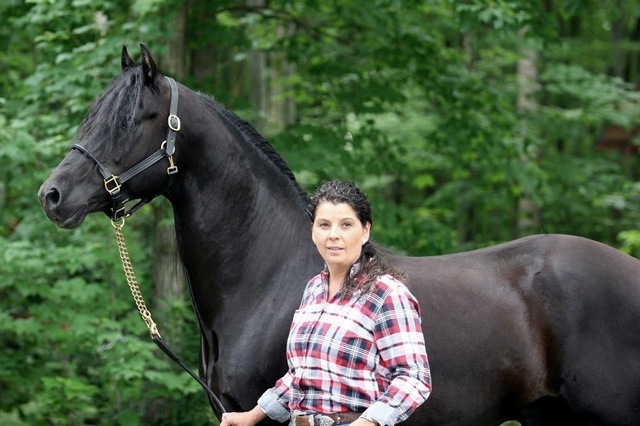 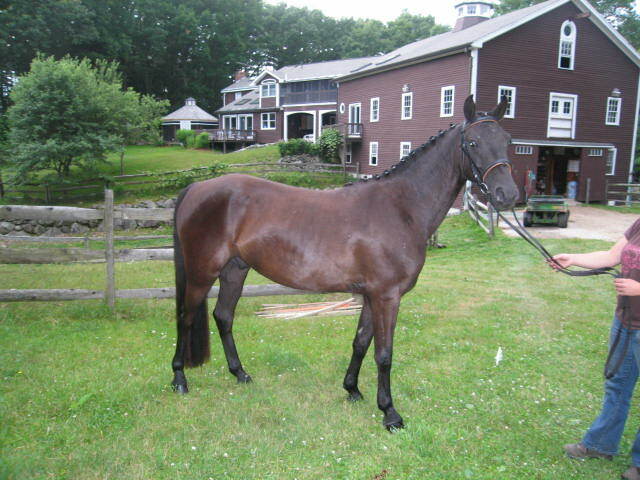 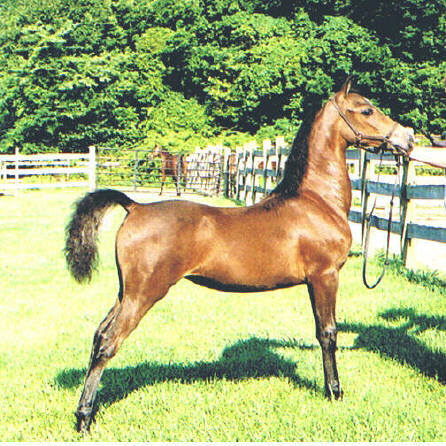 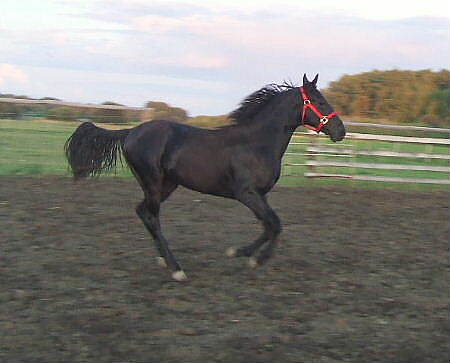 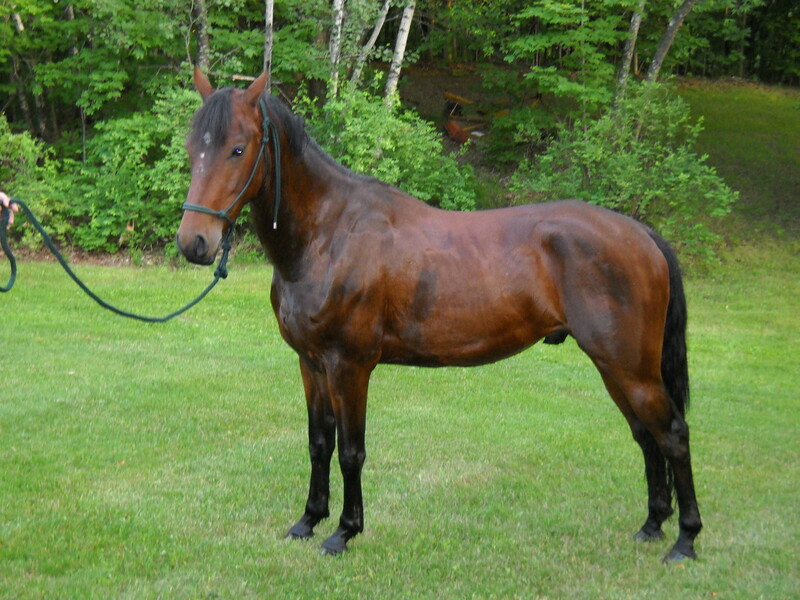 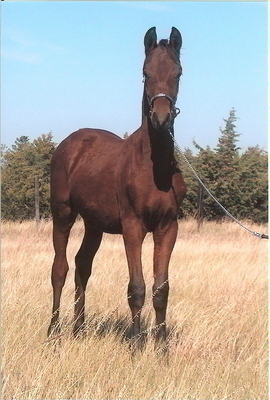 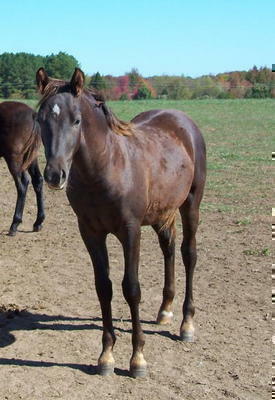 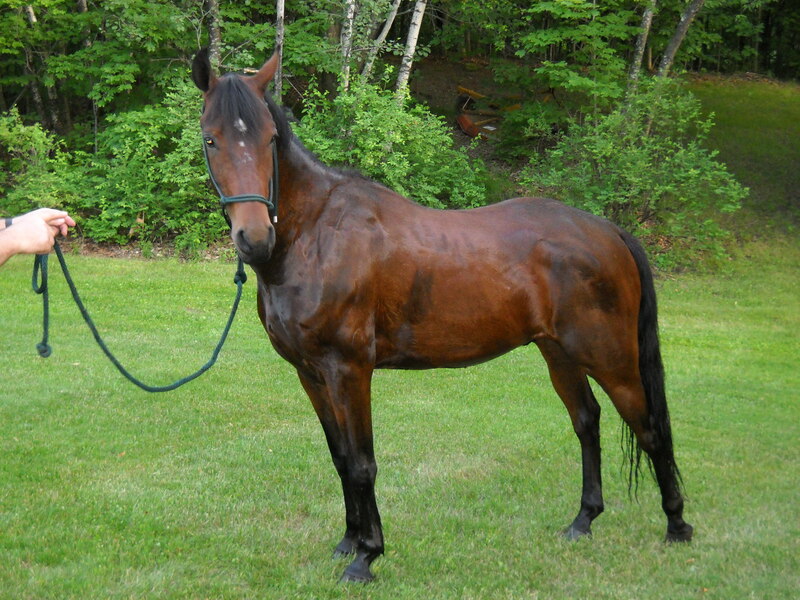 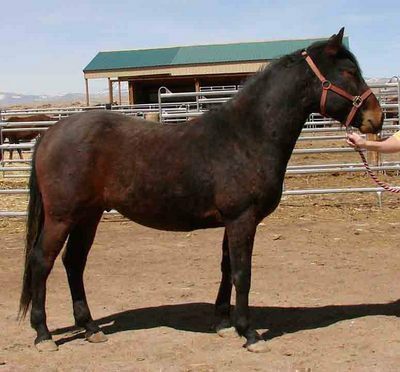 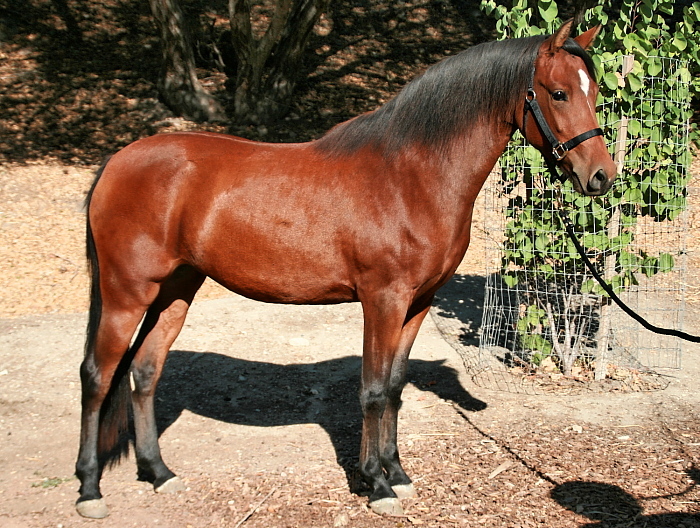 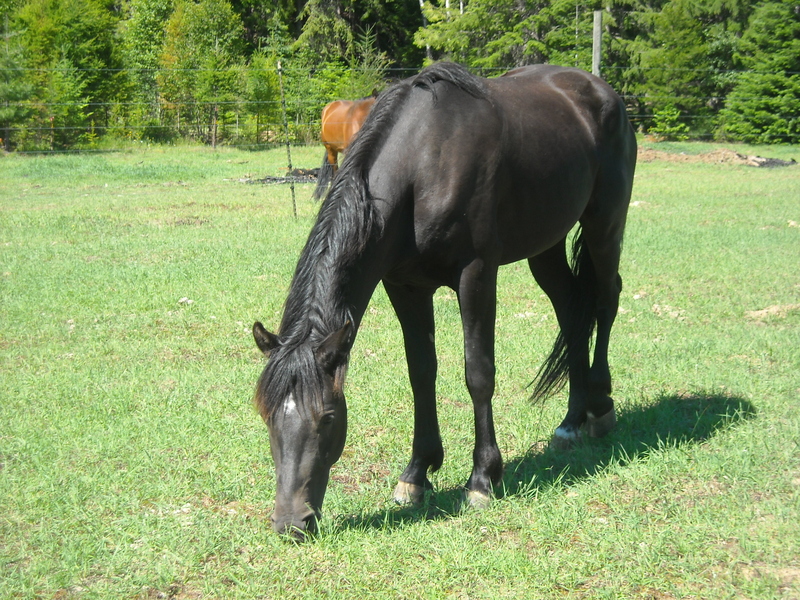 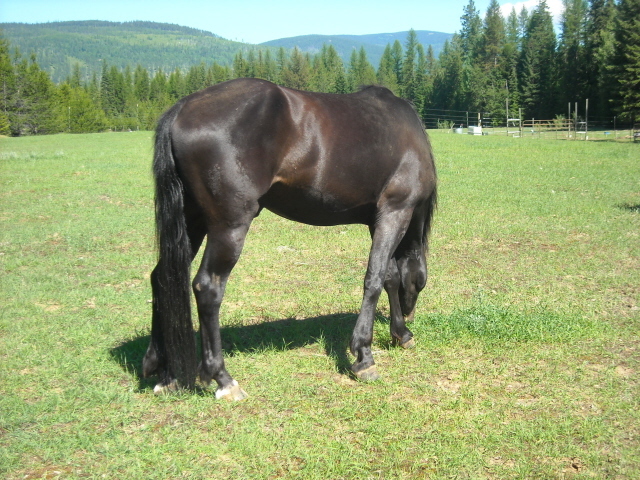 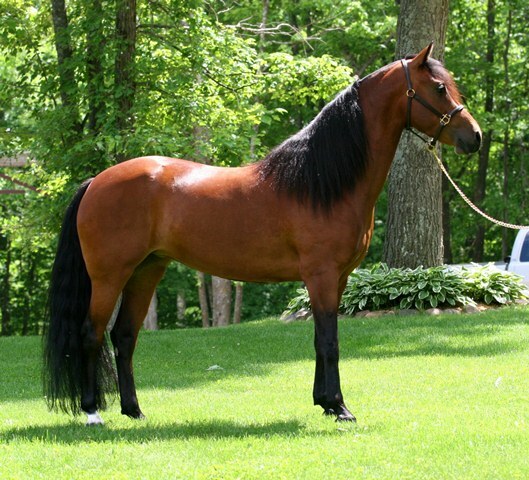 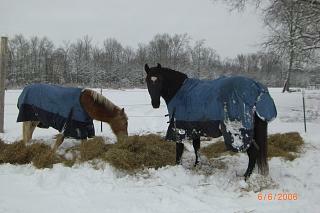 Sherman was the sire of Vermont Black Hawk, and Vermont Black Hawk founded a trotting family. 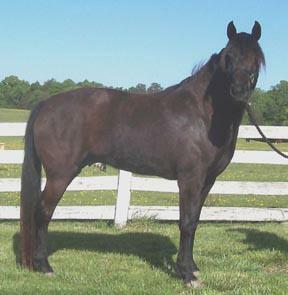 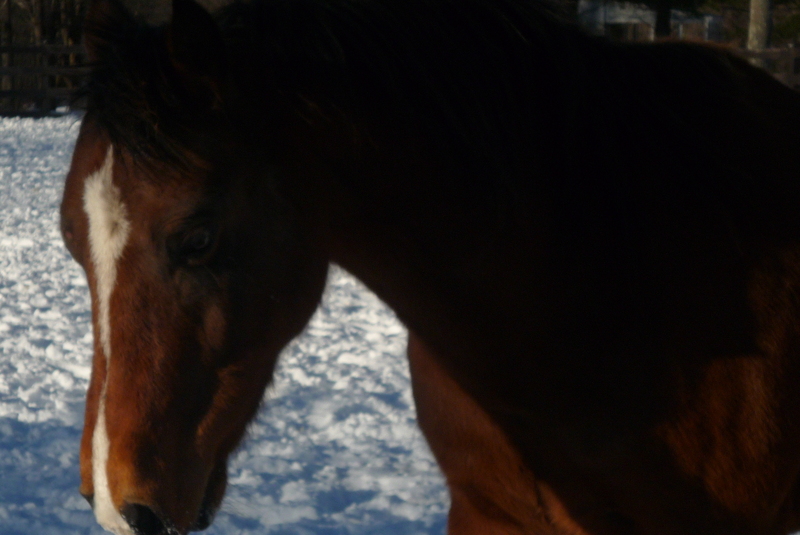 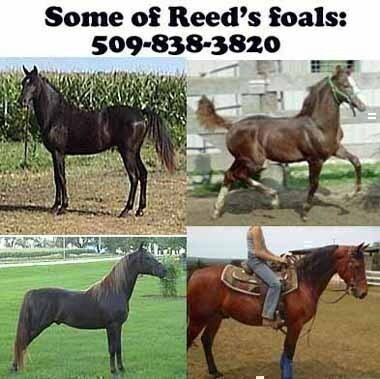 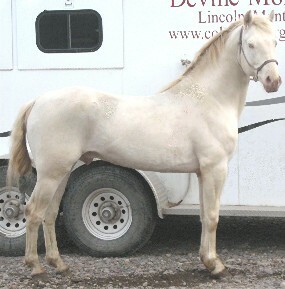 His dam was a half-bred “English” mare from New Brunswick. 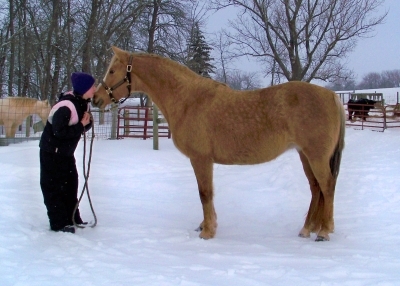 She stood sixteen hands high, and weighed about eleven hundred pounds. 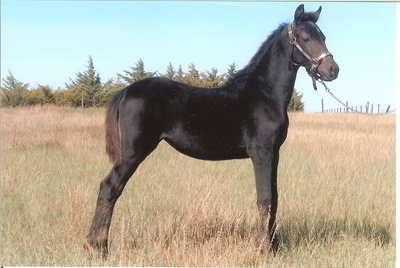 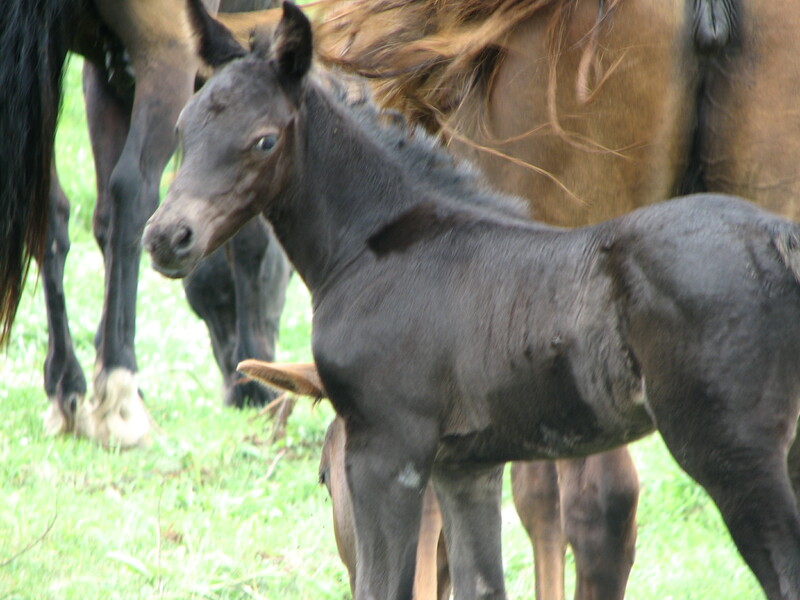 Vermont Black Hawk was foaled in 1833; he was a little under fifteen hands, and jetblack in color. 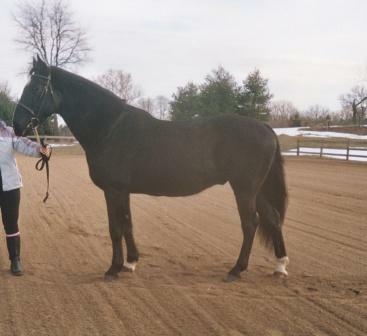 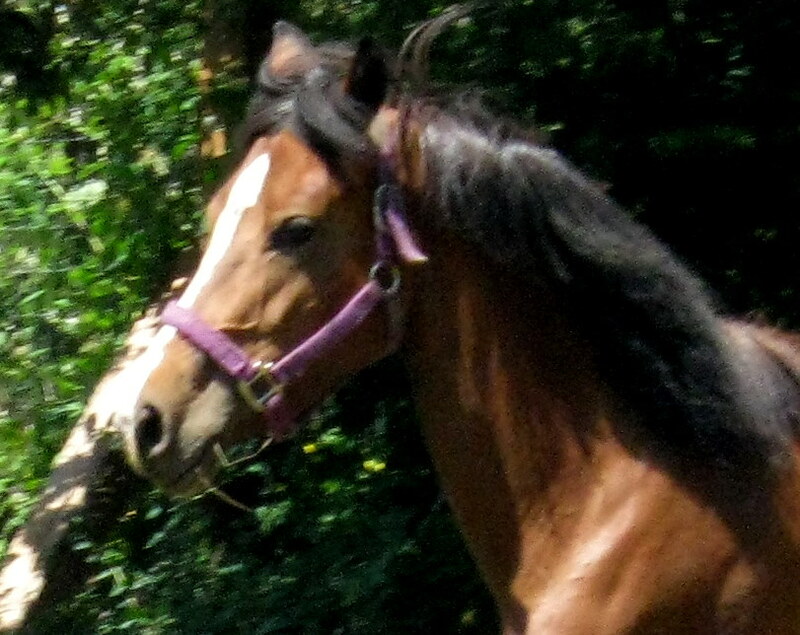 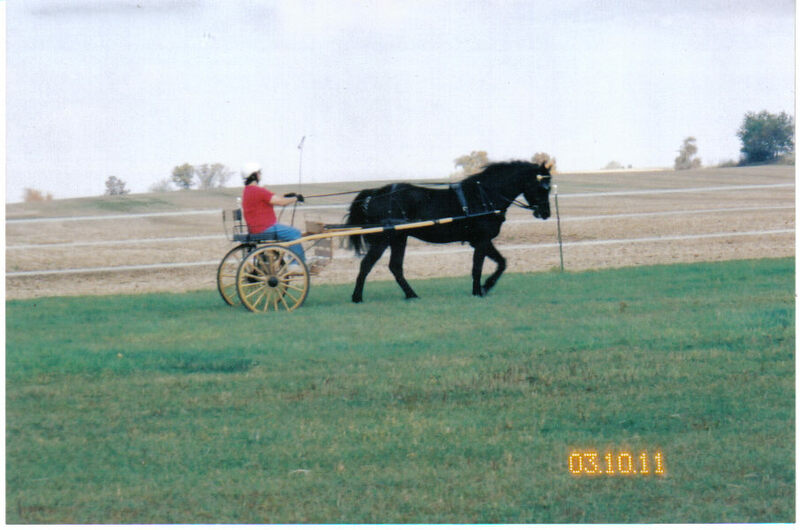 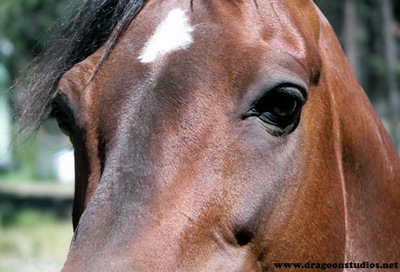 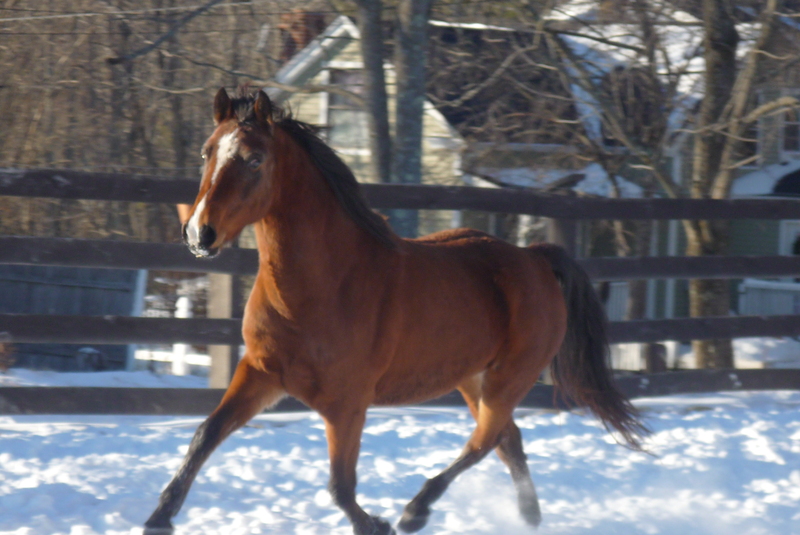 This horse, besides being a trotter, had every quality of a good roadster; he was strong, speedy, enduring; he had a lively but pleasant disposition, and he was remarkable handsome. 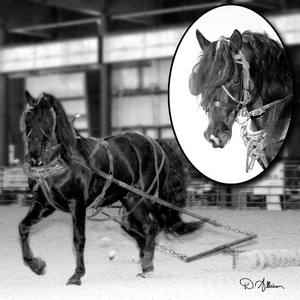 His back was short, he carried his head high, and he possessed that elastic “trappy” gait which is the true roadster way of going. 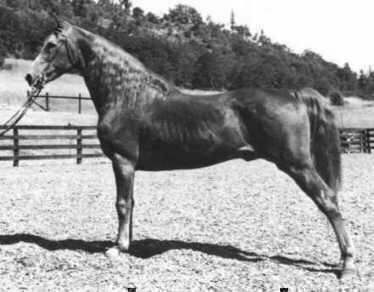 His most distinguished son was ETHAN ALLEN, a very beautiful little bay horse, whose dam was a highly bred gray mare, said to be of MESSENGER descent.” Ethan Allen’s trotting action was wonderfully smooth and pure. 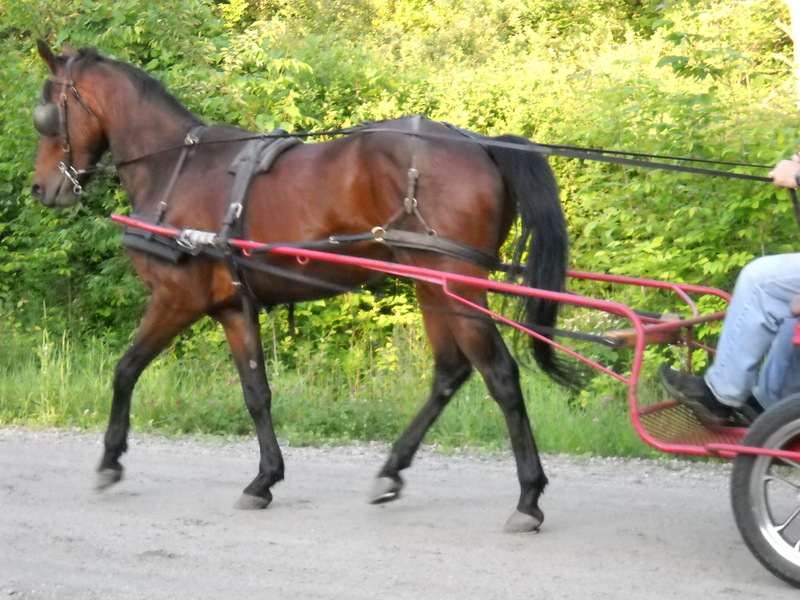 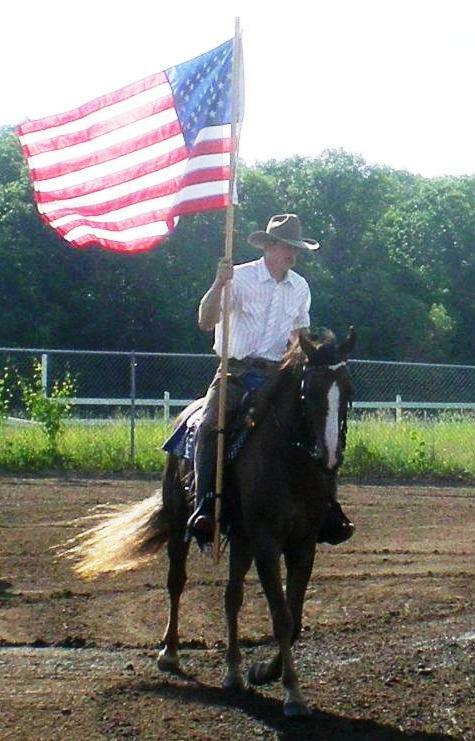 He has a record of 2.15 with a running mate. 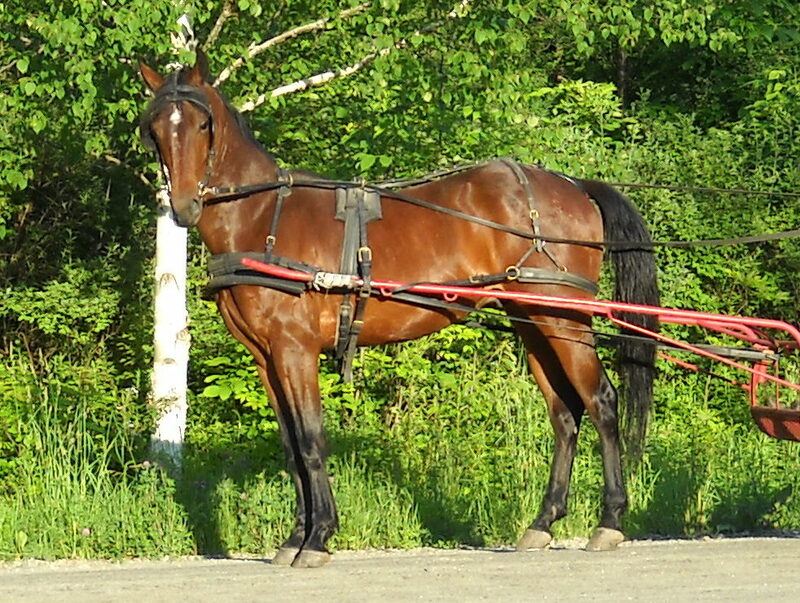 Ethan Allen’s record in single harness is 2.25 1/4. 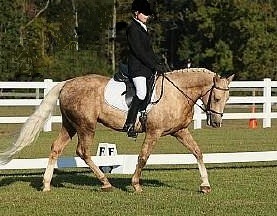 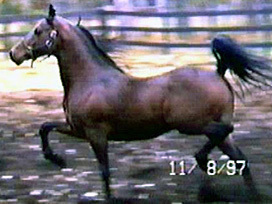 This discrepancy of 10 1/4 seconds between his record with and his record without a running mate is greater than it should be, and is probably due chiefly to the fact that his hind legs were faulty, his hocks being somewhat weak, and his pastern joints too long and delicate, so that he could not maintain his speed except for a short distance. 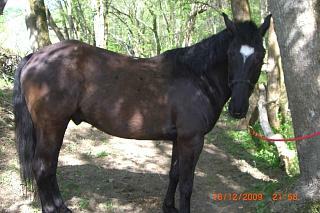 These defects he inherited from his dam. 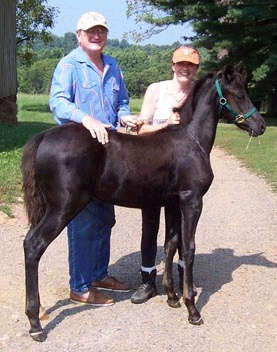 The best son of Ethan Allen was Daniel Lambert, who became the most distinguished progenitor of trotters that has appeared in the Morgan family. 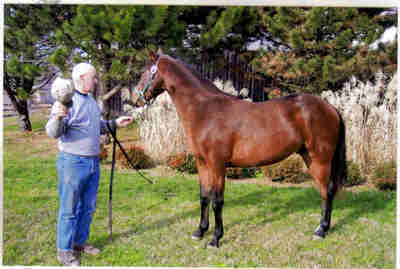 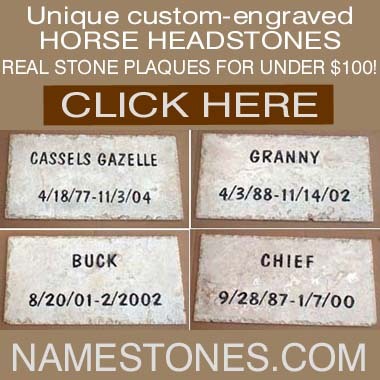 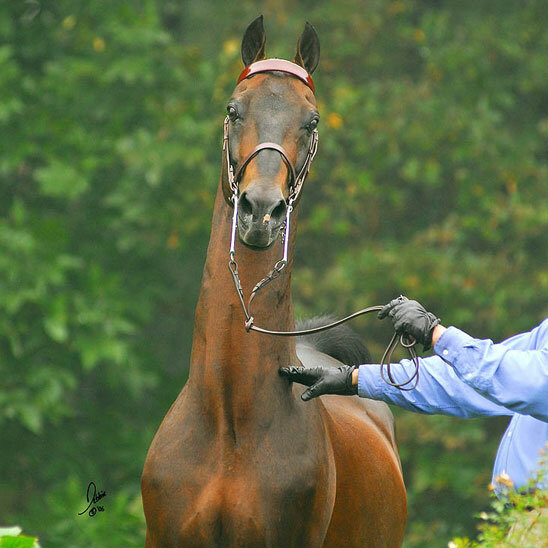 His dam was FANNY COOK, a chestnut, and a daughter of Abdallah, son of Messenger and sire of Rysdyk’s Hambletonian. 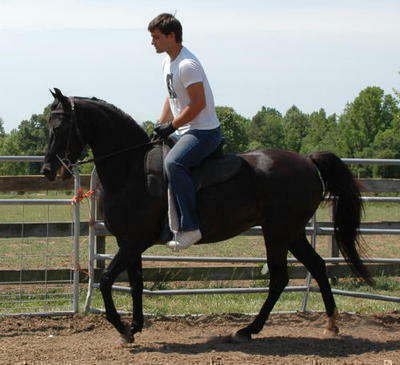 Thus in Daniel Lambert the Messenger and Morgan strains were united, and this combination has since produced many fast trotters. 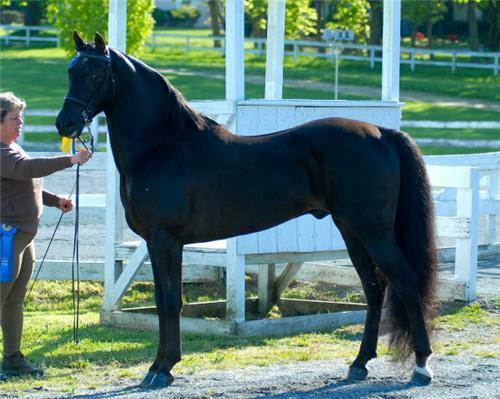 In Daniel Lambert disappeared the faulty conformation that Ethan Allen inherited from his dam, and he was not inferior in beauty to his sire or grandsire. 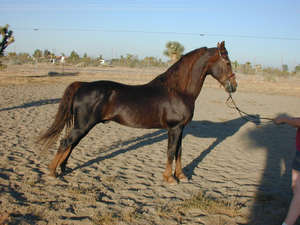 He was chestnut, with mane and tail some shades lighter, the mane being very silky, and the tail long, wavy, and well carried. 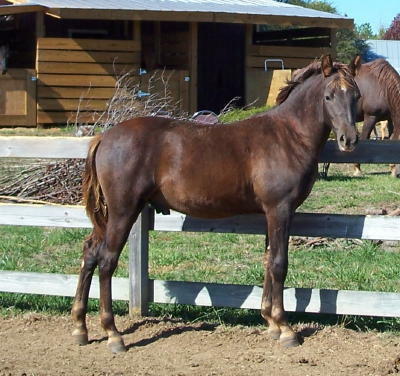 This peculiar coloring of two shades of chestnut is still common in the Lambert family, and, seen at its best, nothing could be more striking or picturesque. 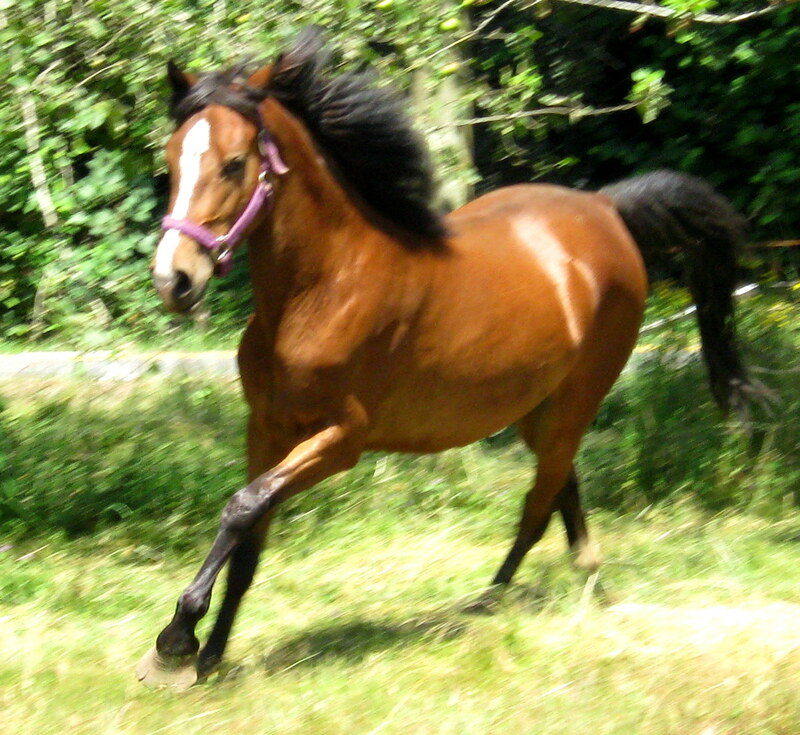 The Lamberts are intelligent, spirited, speedy, and courageous. 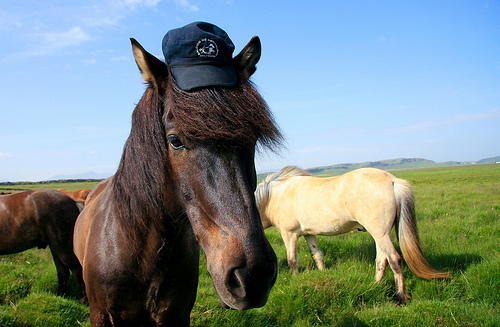 Perhaps it would be no exaggeration to say that the finest gentlemen’s roadsters bred in this country have been of Lambert stock. 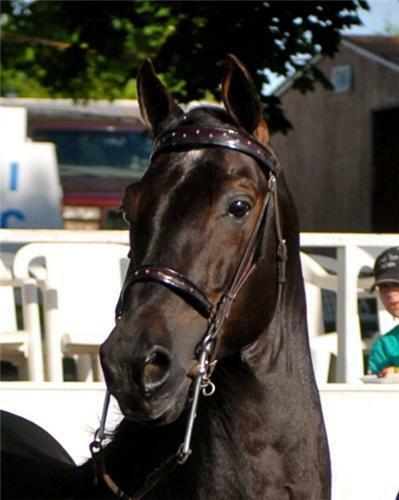 Daniel Lambert himself was a horse of commanding style and of magnificent carriage. 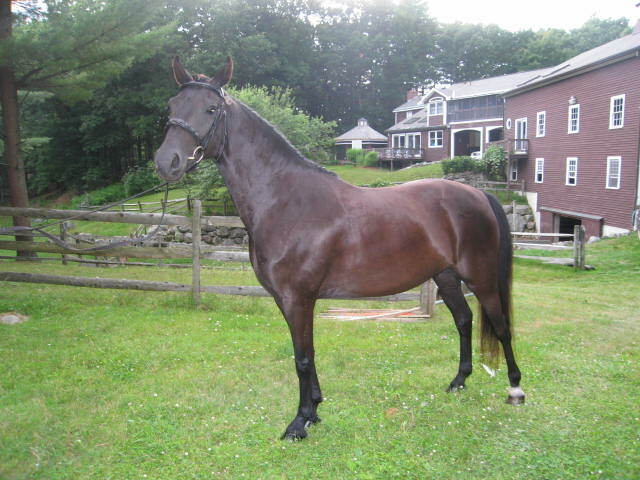 For many years he was kept in the vicinity of Boston, but late in life he was brought back to Middlebury, Vermont, where he had been raised. 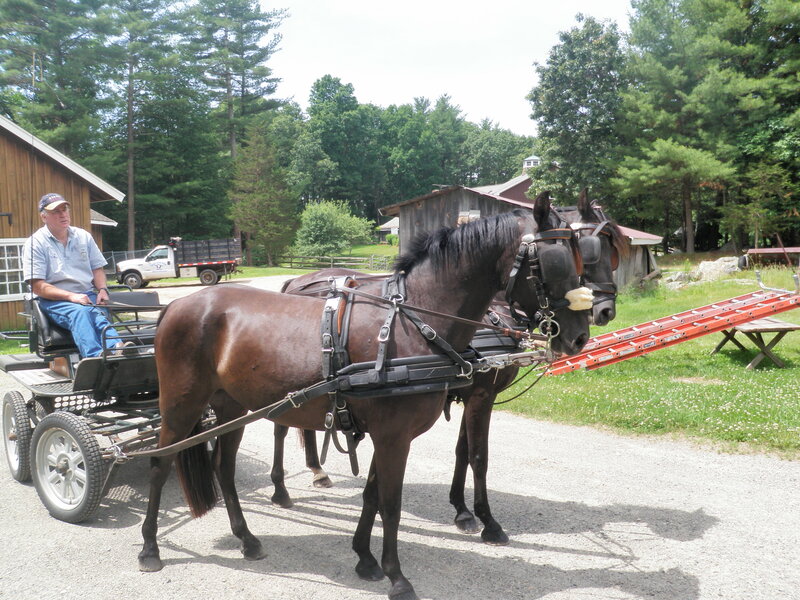 On this occasion all the inhabitants turned out with a brass band to welcome him home, and there was a procession through the village streets. 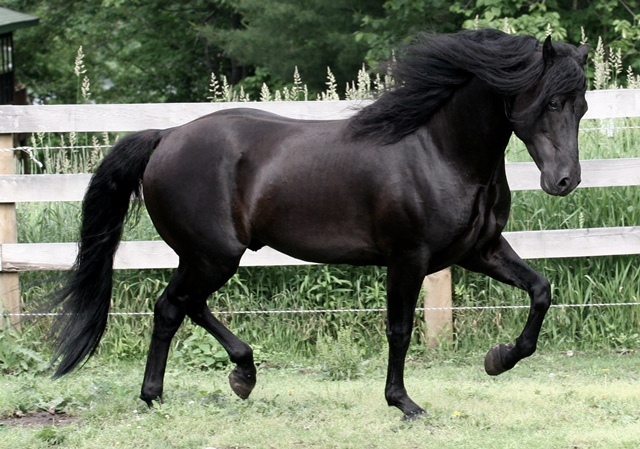 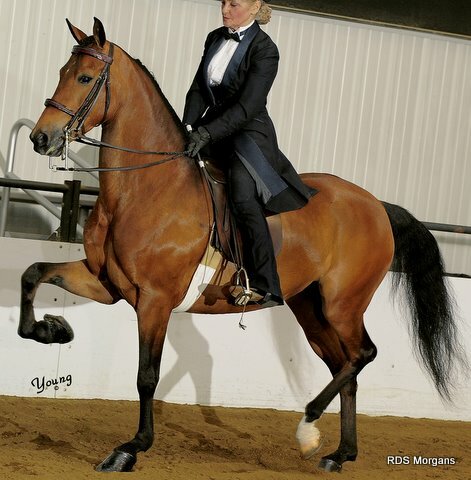 “The old horse,” relates an eyewitness of the scene, “kept time to the music, and was the proudest creature that ever walked on earth.” The gait of the Morgan horse is highly characteristic. 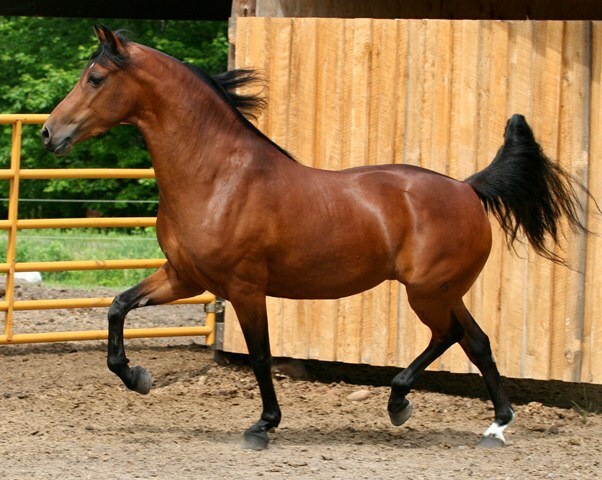 Though sure- footed, he is apt to carry his fore feet close to the ground, taking short elastic steps, which even when quickened to a rapid trot, seem to cost him the least possible effort. 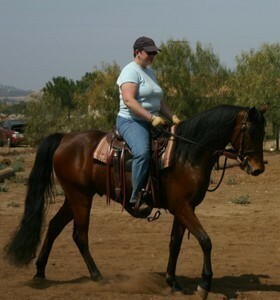 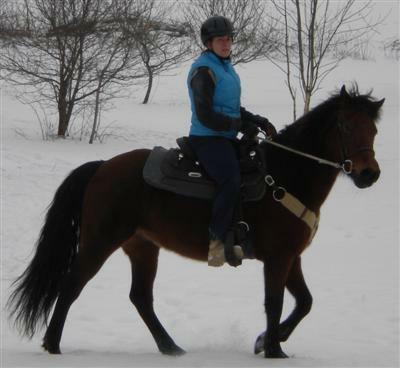 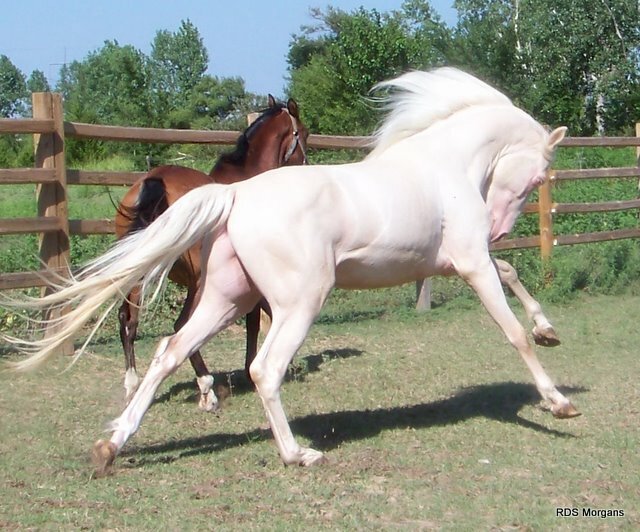 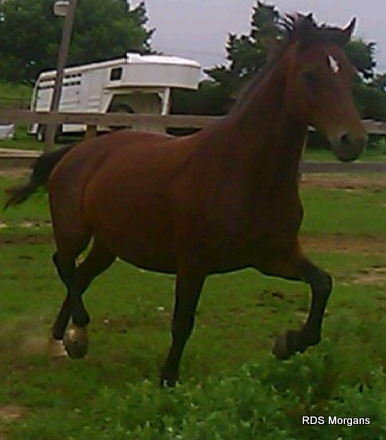 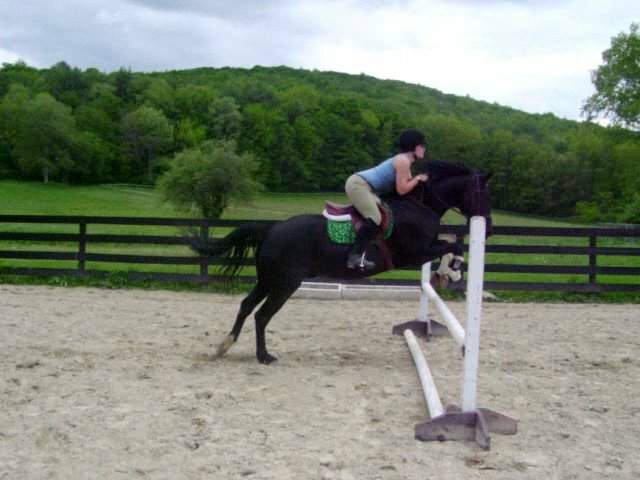 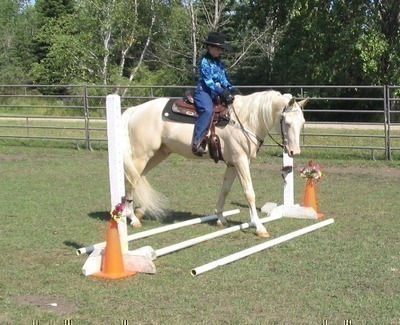 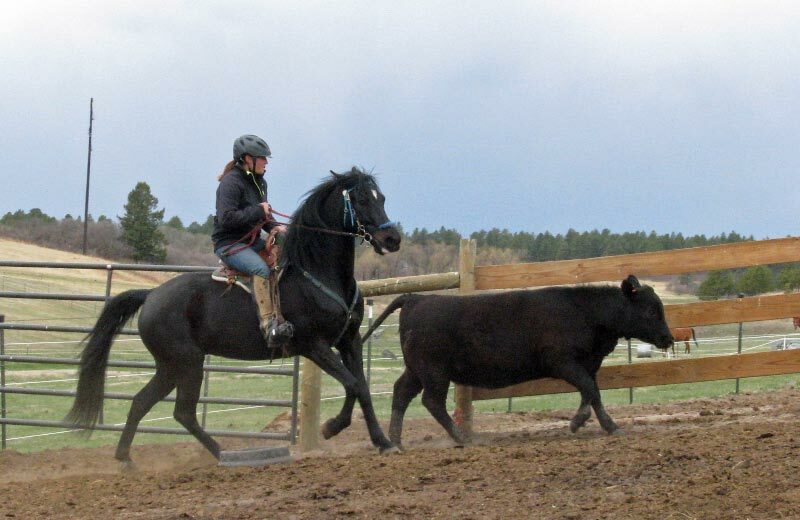 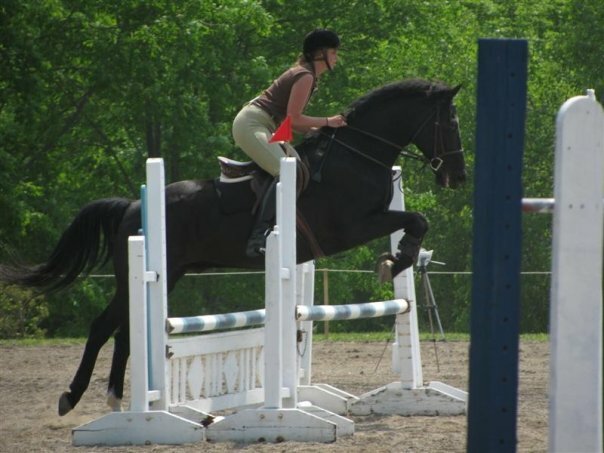 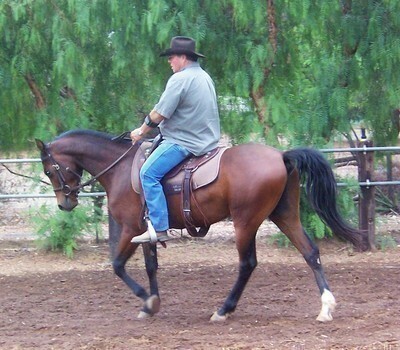 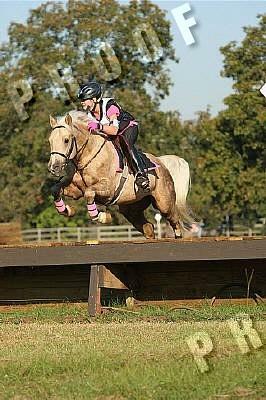 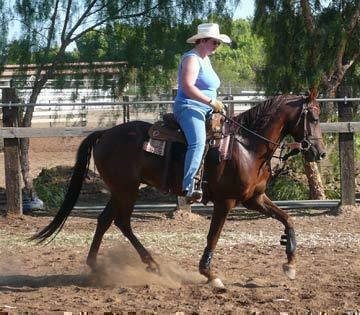 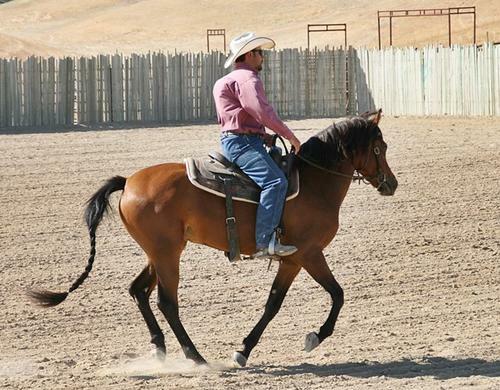 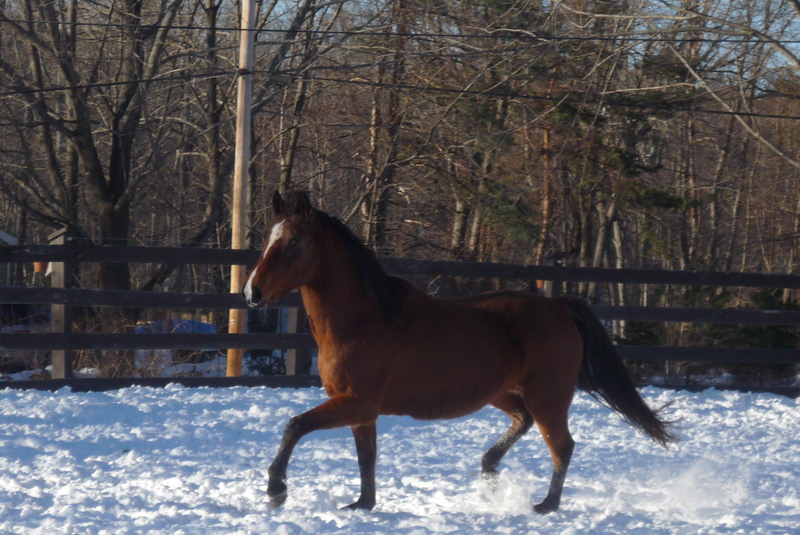 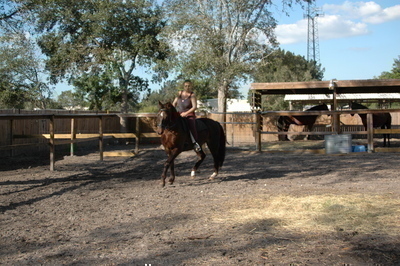 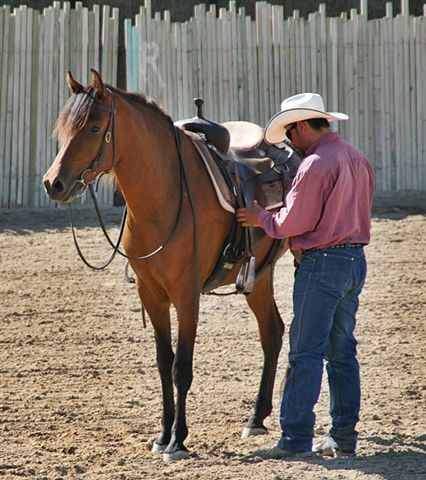 There is no swaying of the hips, no shaking of the whole frame, no pounding with the fore feet or high lifting of the hocks, but a smooth, easy, gliding motion. 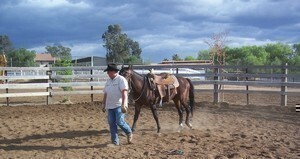 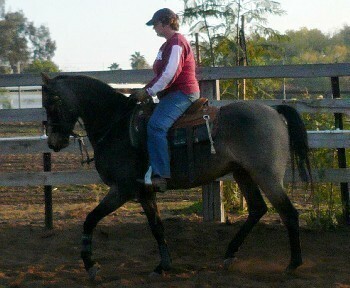 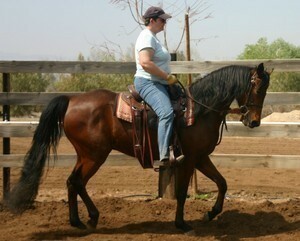 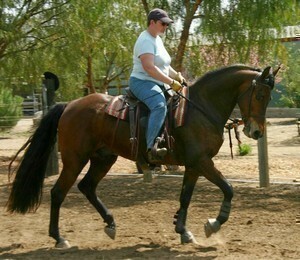 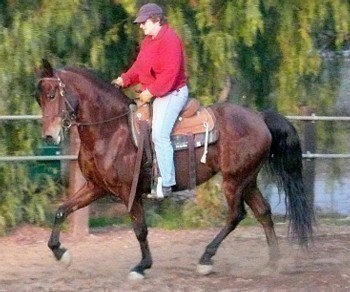 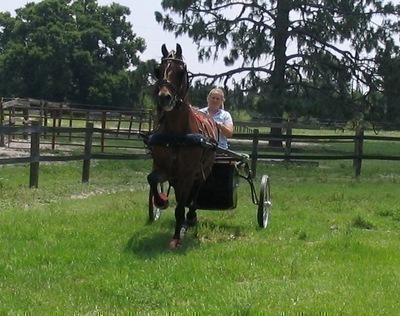 The Morgan both trots and gallops with his limbs well under him. 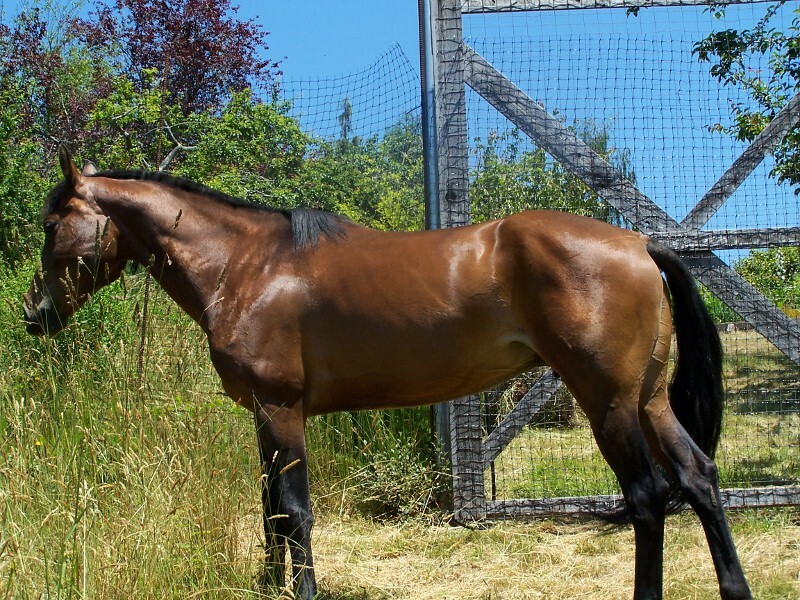 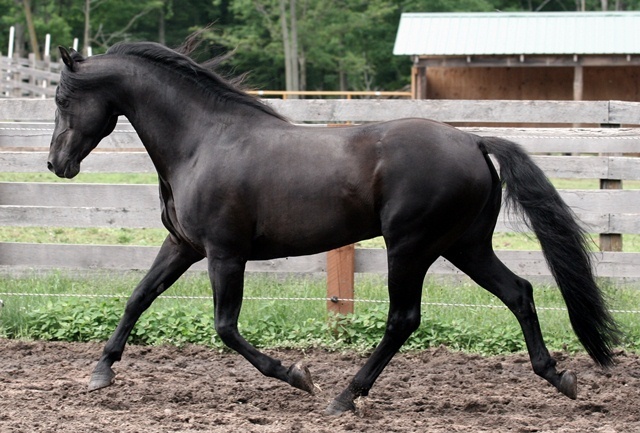 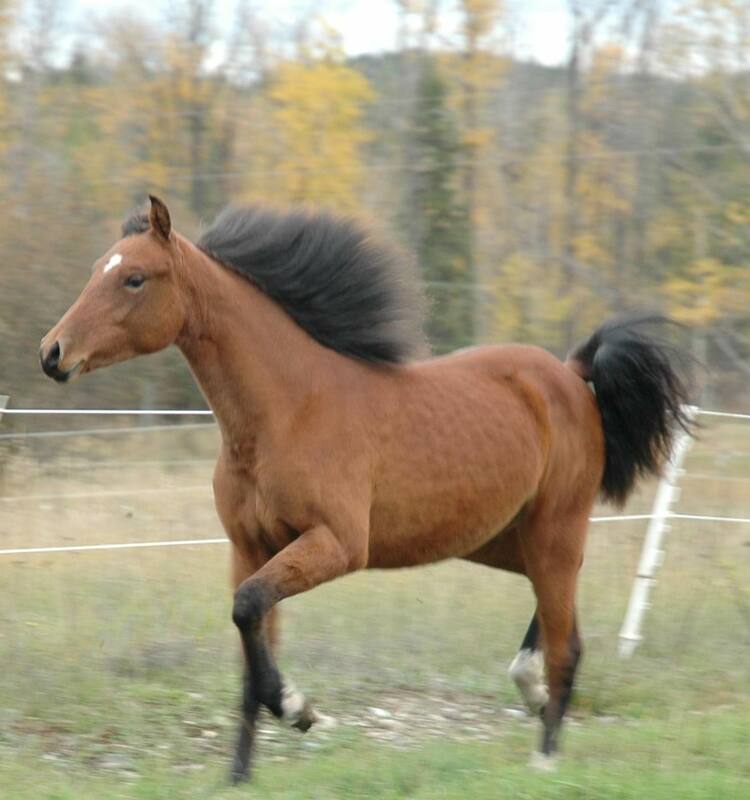 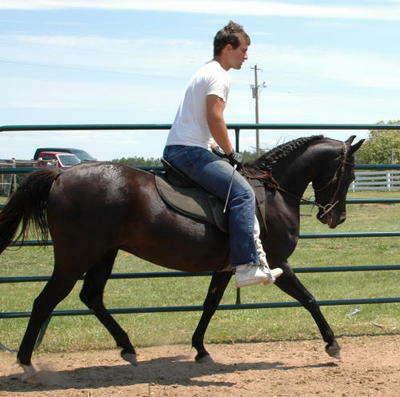 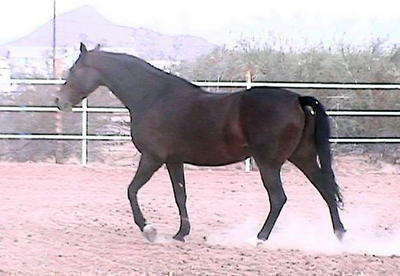 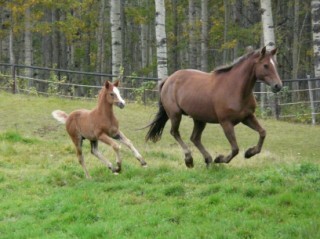 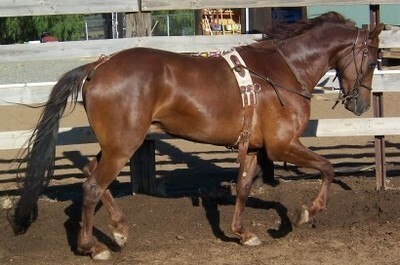 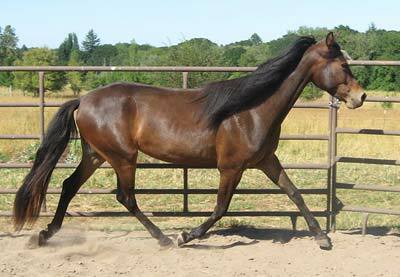 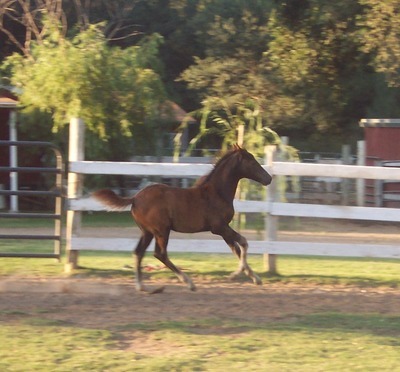 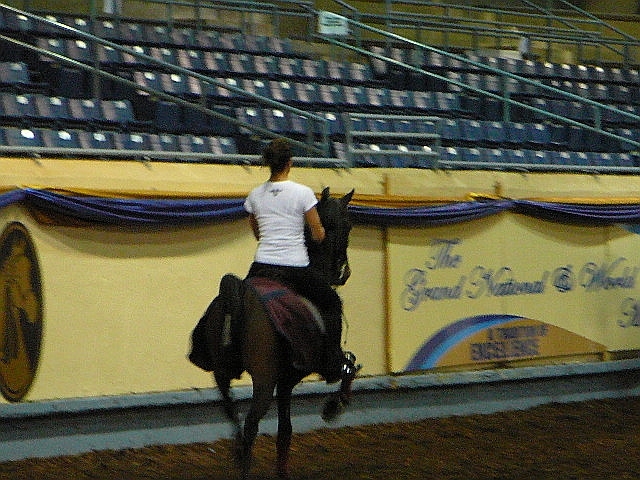 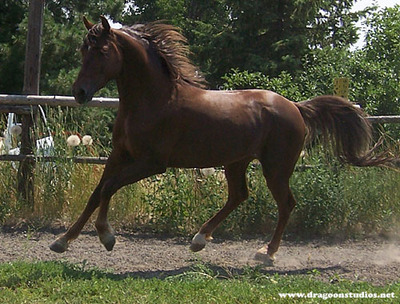 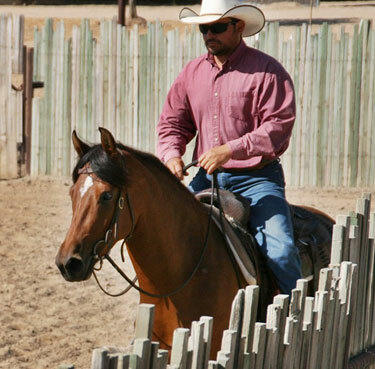 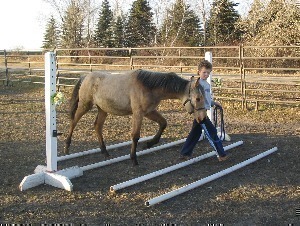 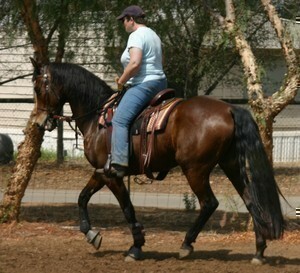 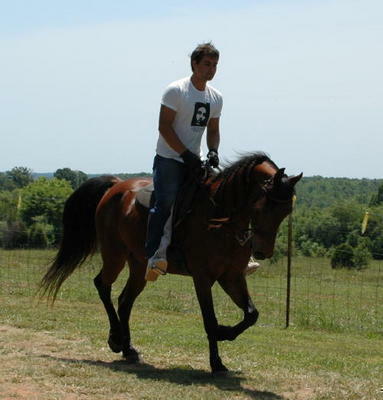 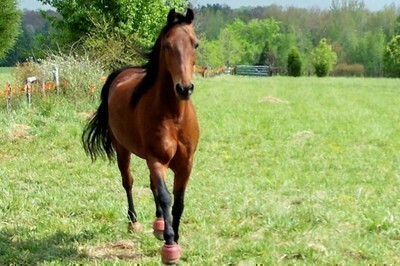 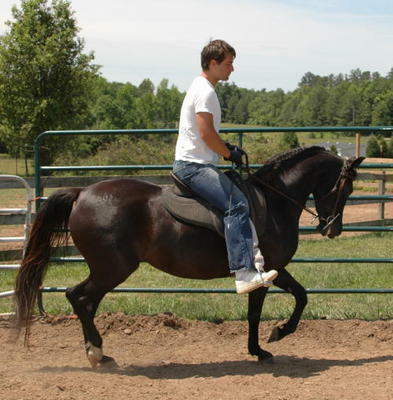 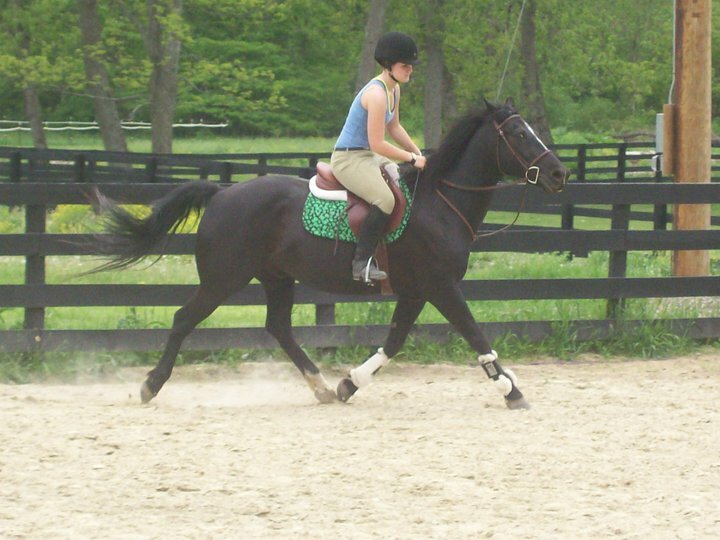 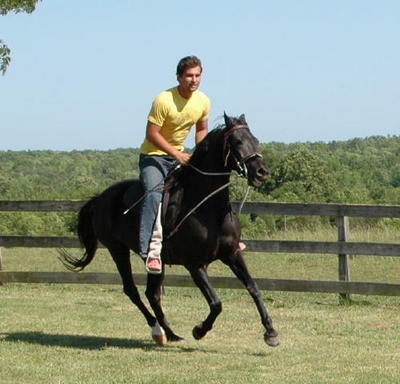 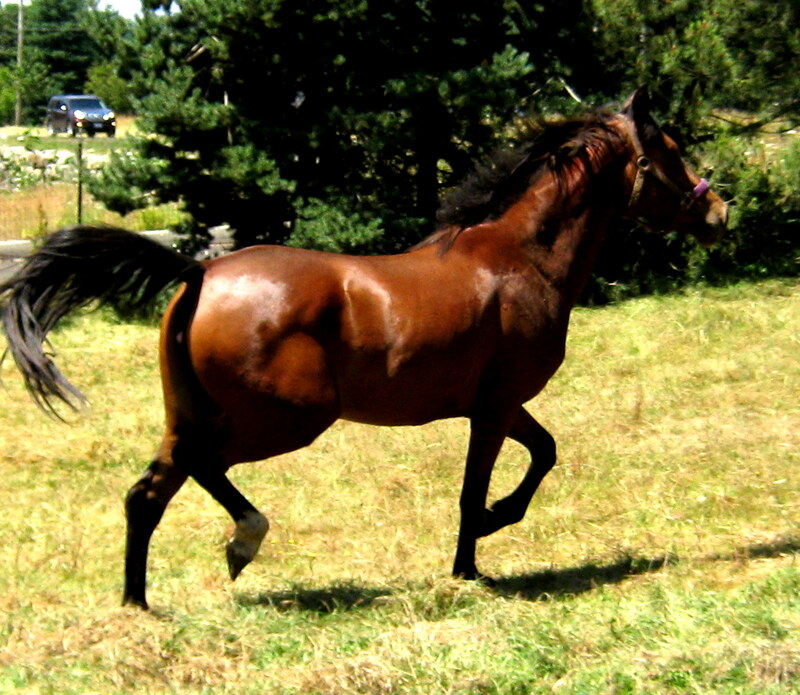 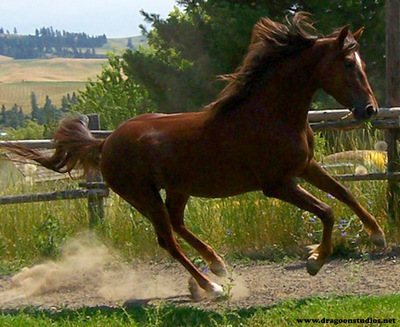 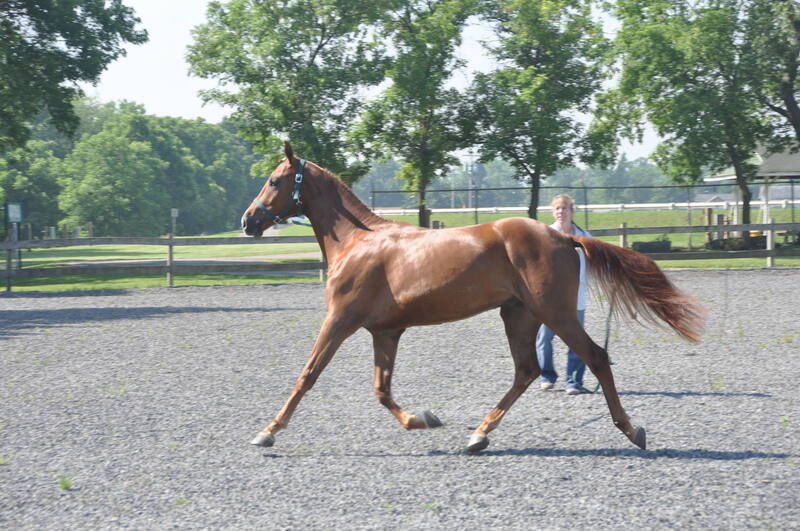 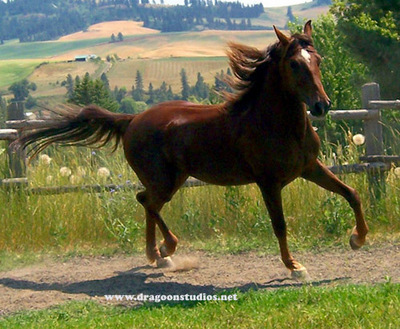 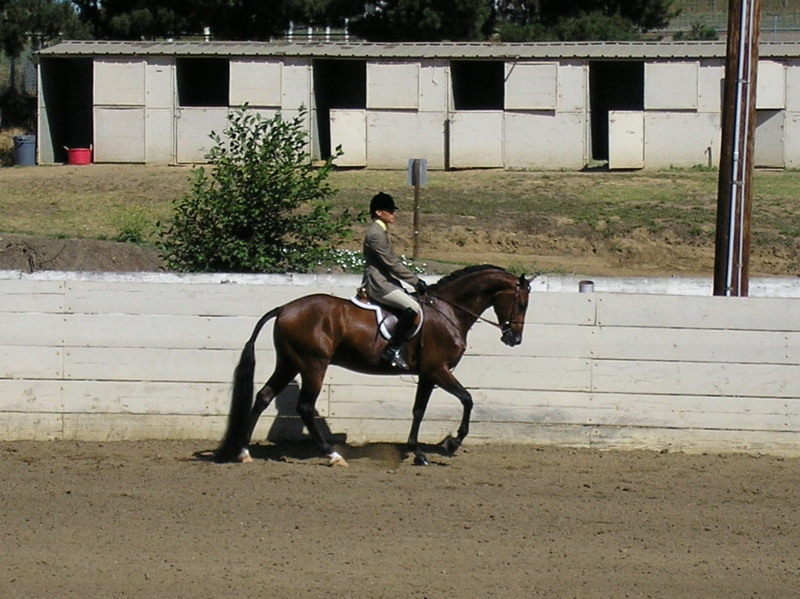 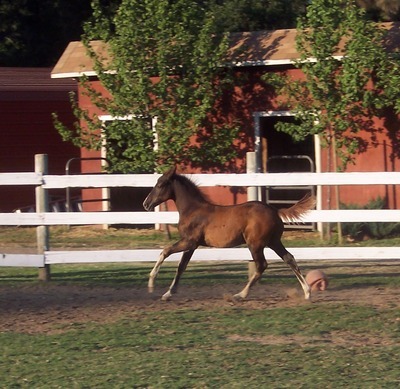 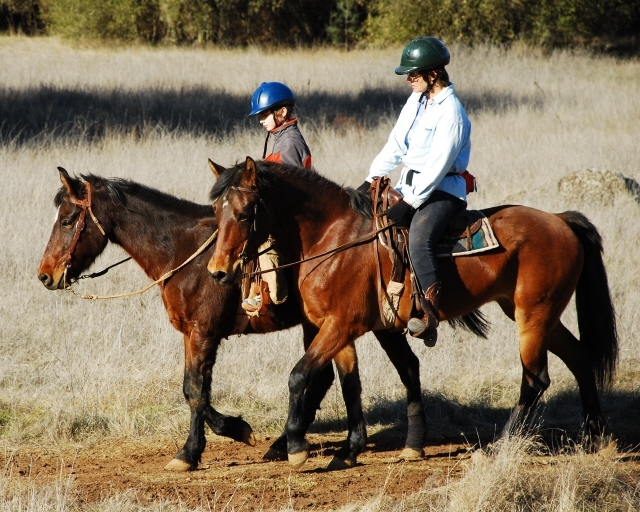 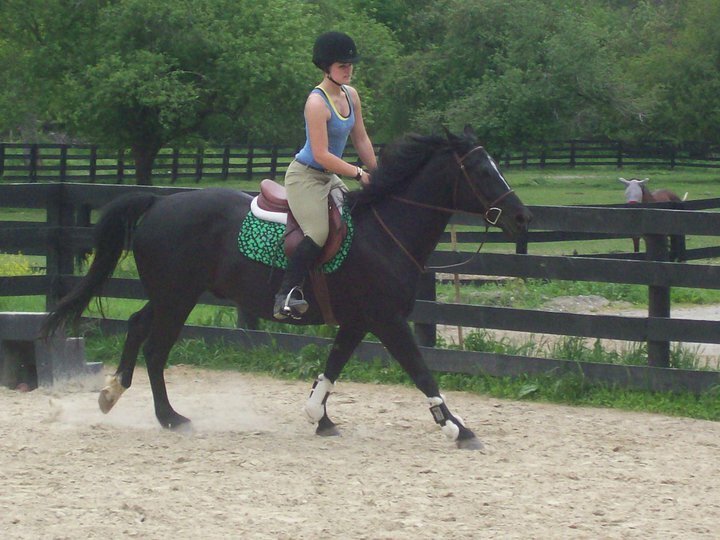 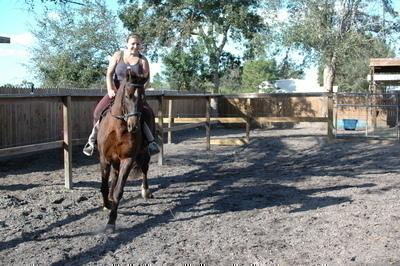 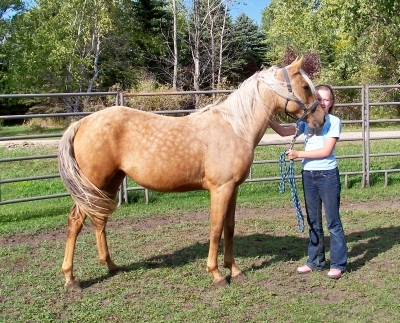 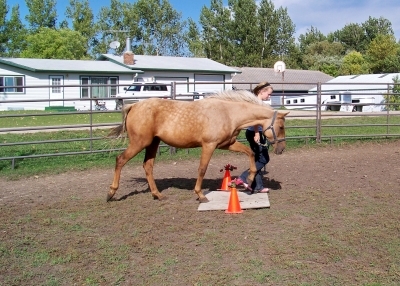 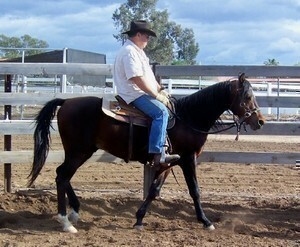 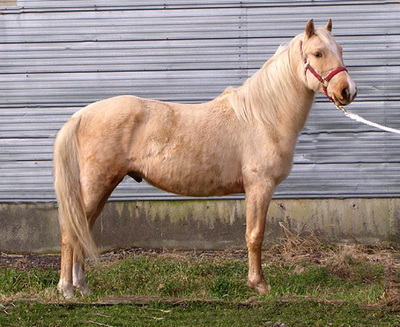 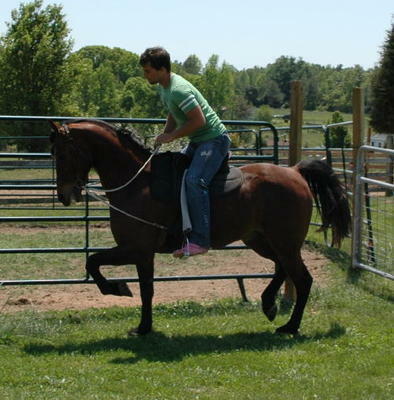 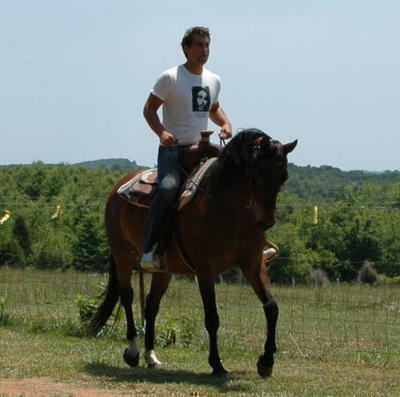 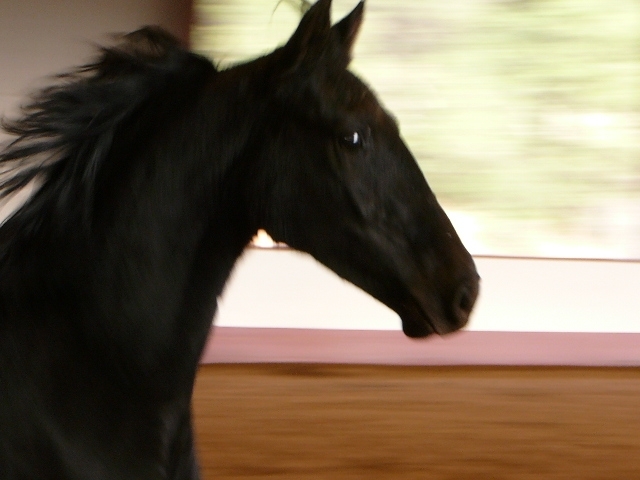 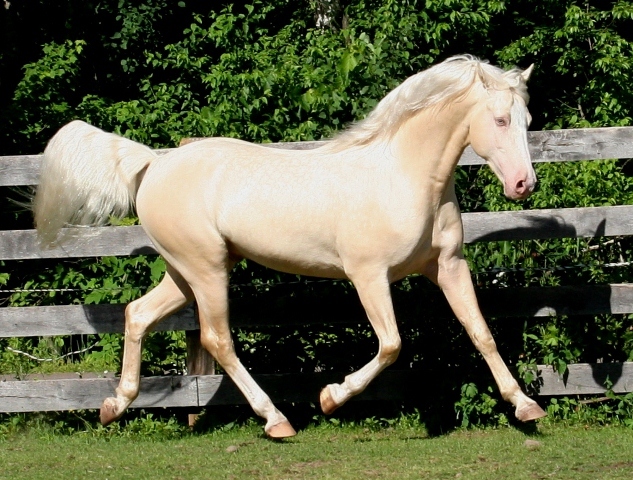 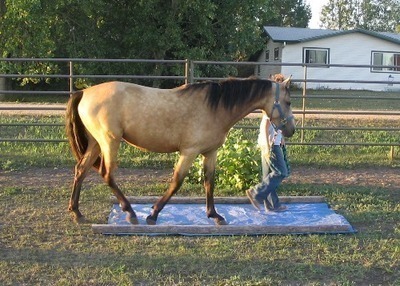 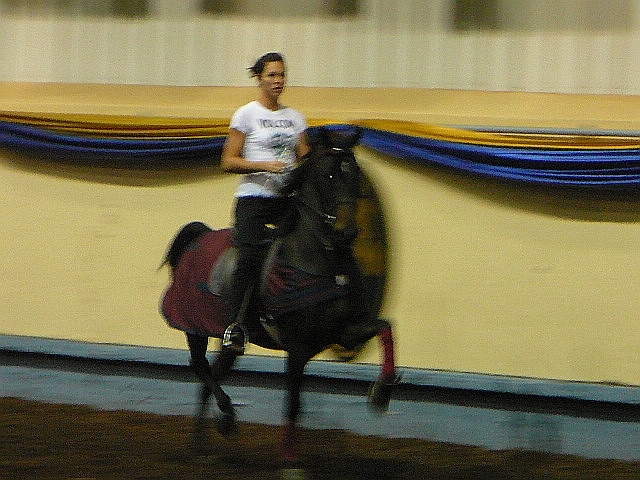 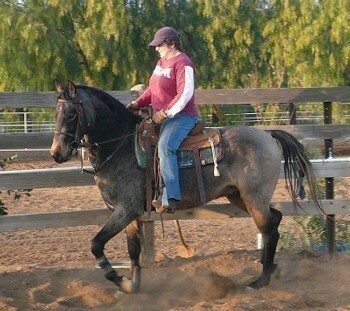 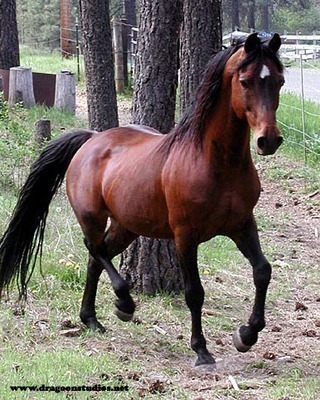 A longer, wider gait is commonly associated with the trotting horse. 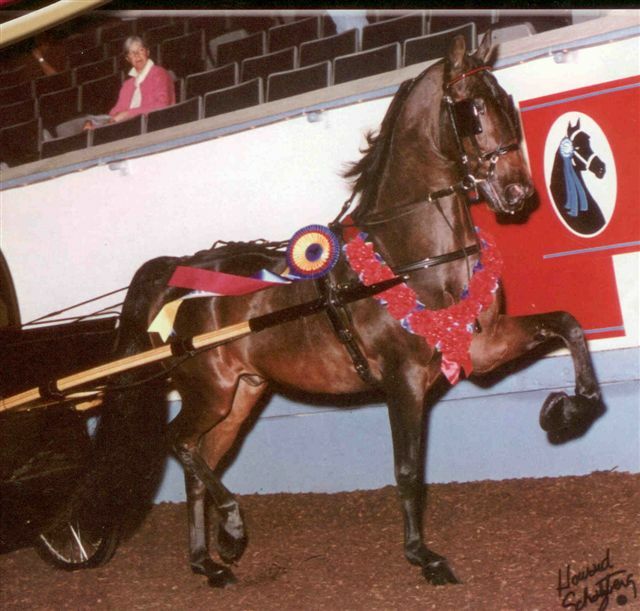 In fact, until within the fast few years it was thought that the ideal trotter carried his hind feet so wide as to plant them outside the track left by his fore feet. 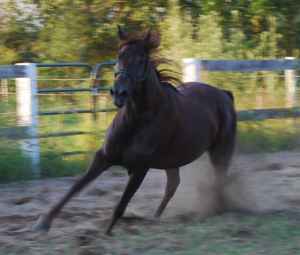 Many, perhaps most, fast horses do travel in this way; but, as a rule, the very fastest step no wider behind than in front. 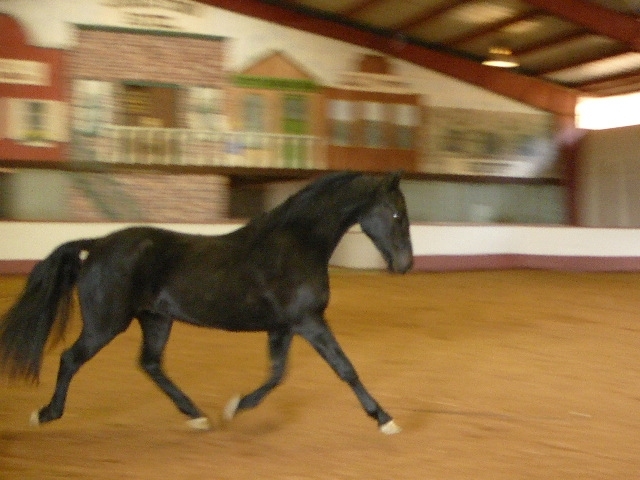 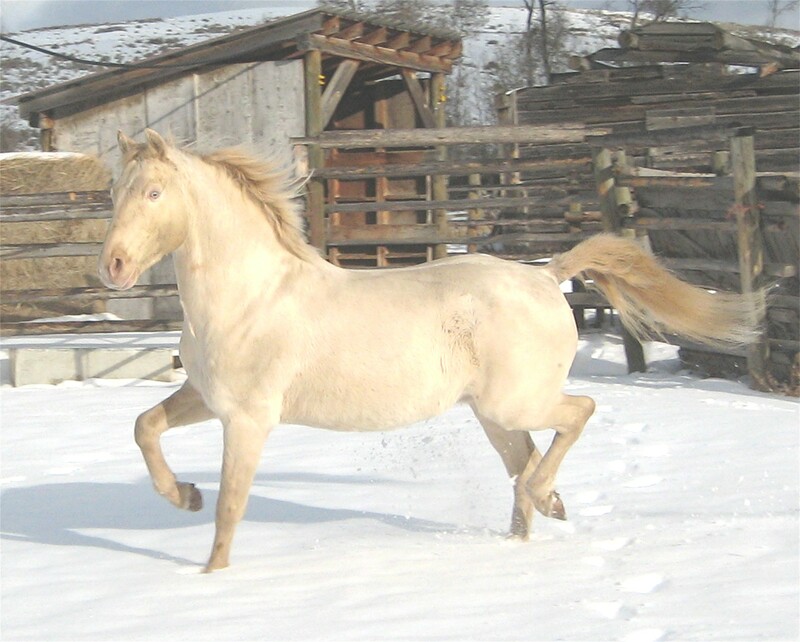 A long stride is however nearly, if not quite, essential to extreme speed; and many Morgan horses, when moving at their best pace, lengthen their gait very much, and go perceptibly nearer to the ground. 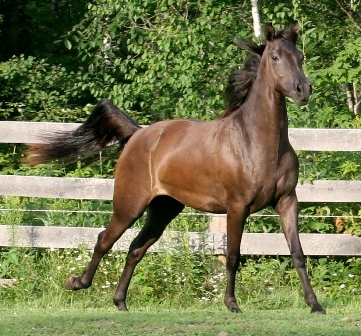 The Morgan action in front is, as a rule, not big enough for superlatively fast trotting, which is best performed by a peculiar and very graceful round motion of the fore legs. 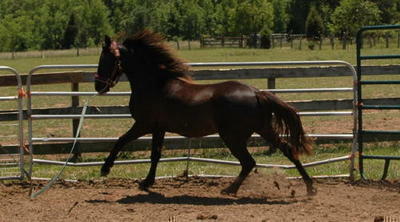 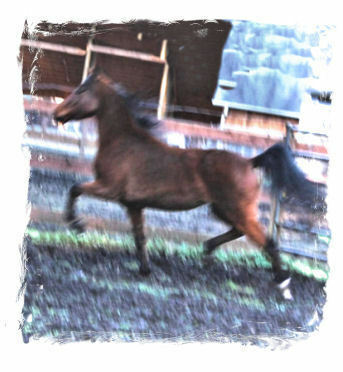 Some fast trotters have positively high action in front—so high as to seem like a waste of power. 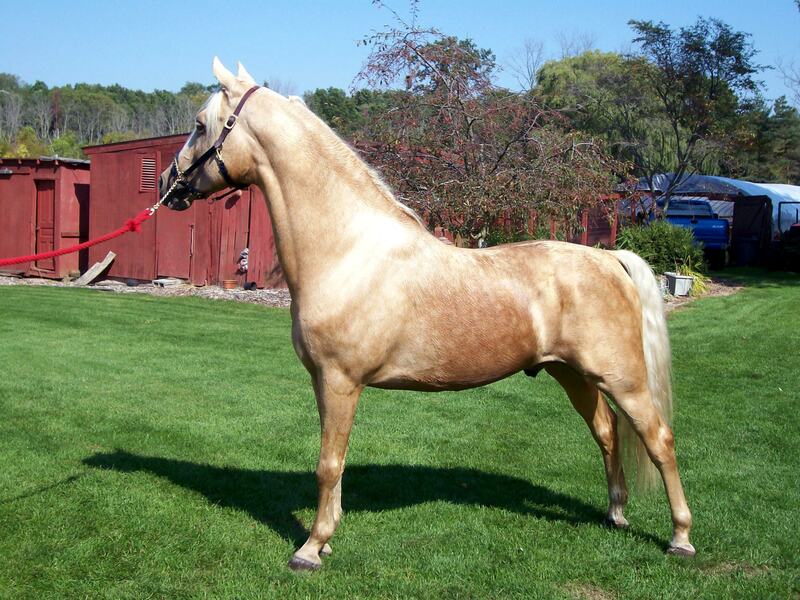 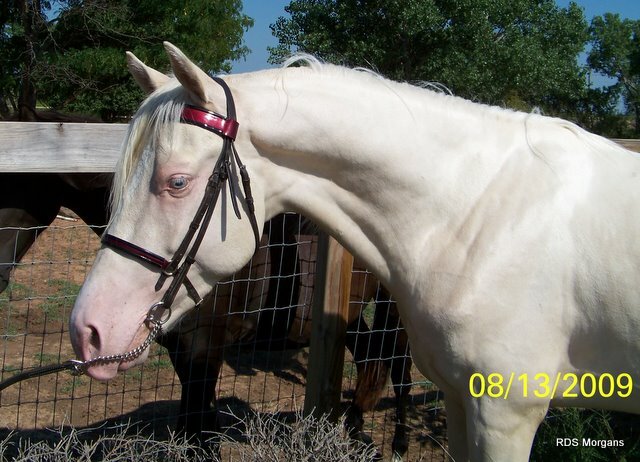 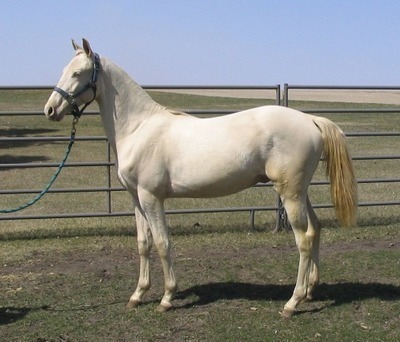 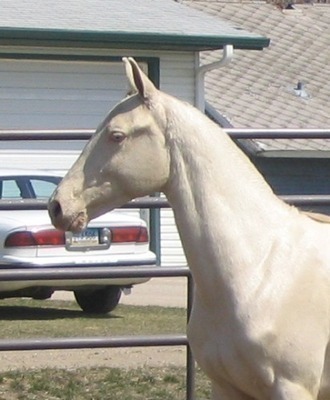 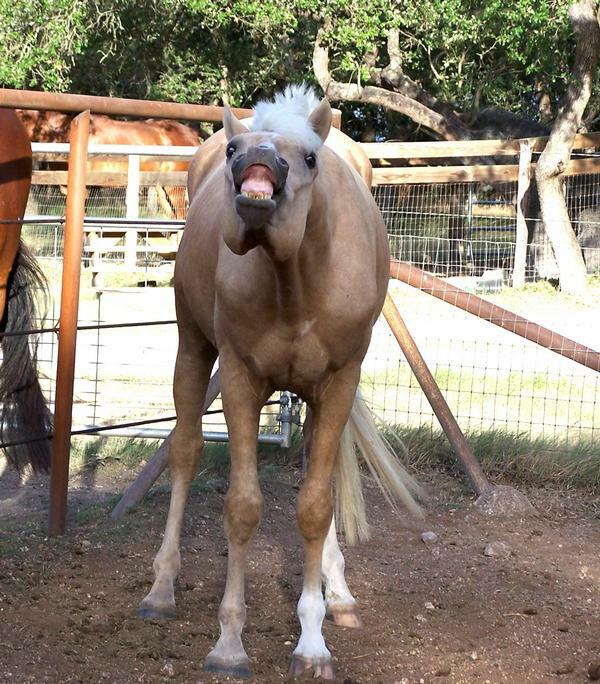 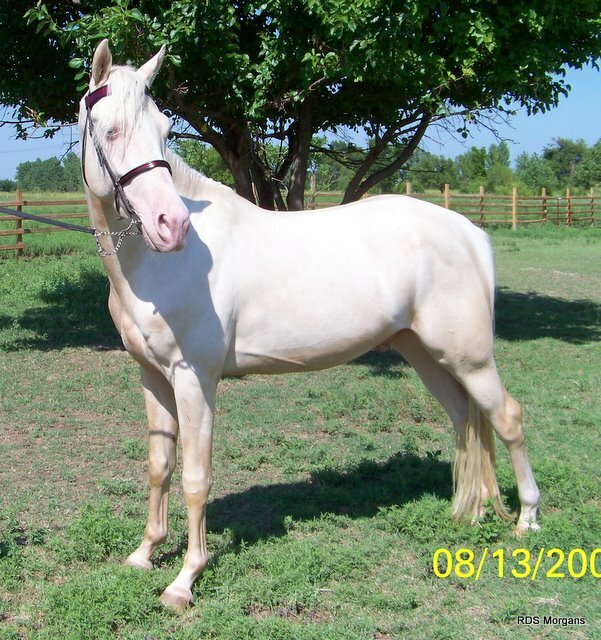 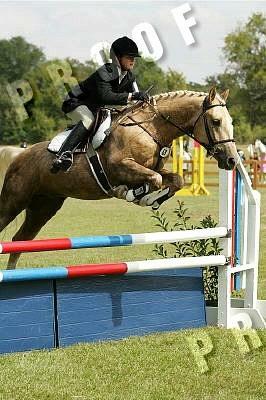 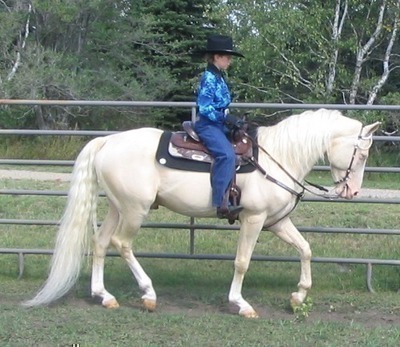 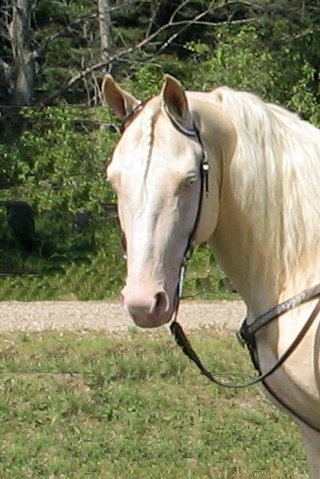 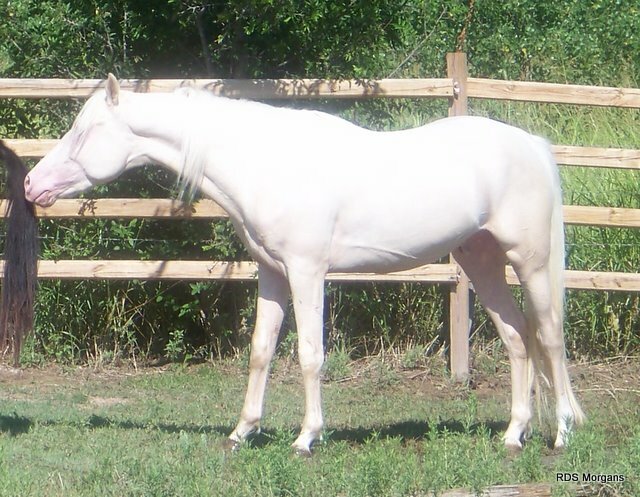 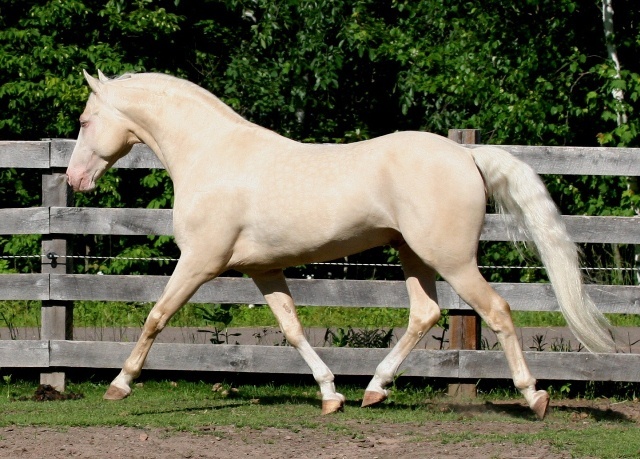 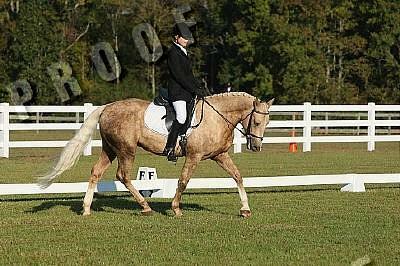 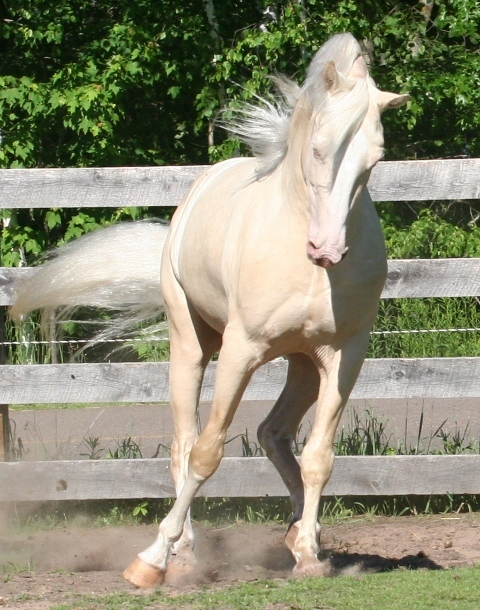 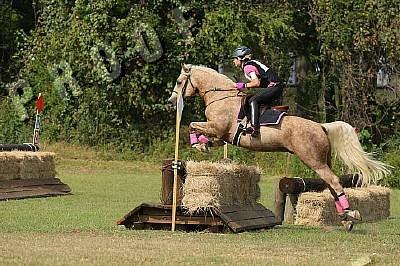 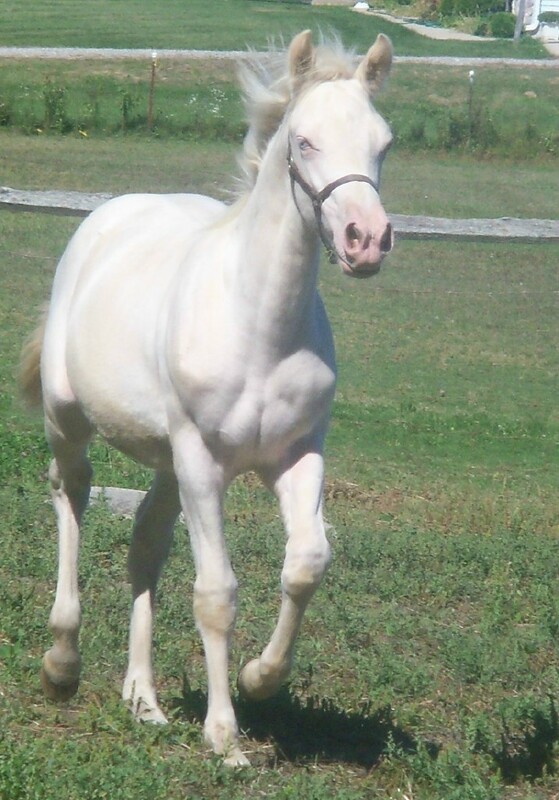 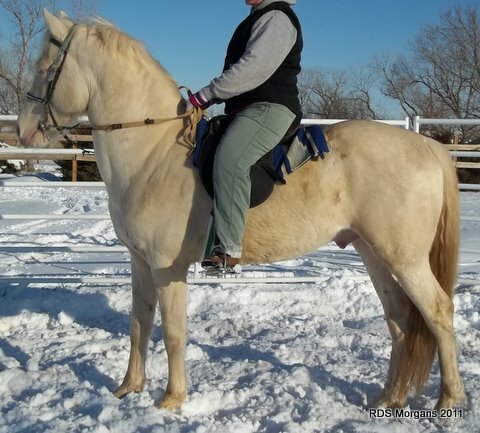 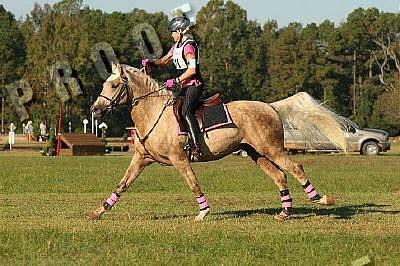 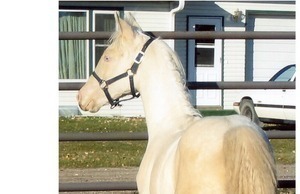 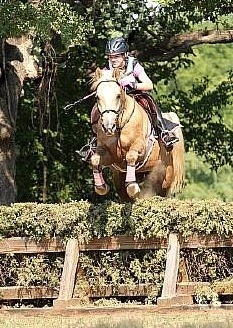 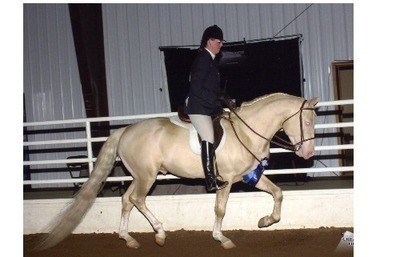 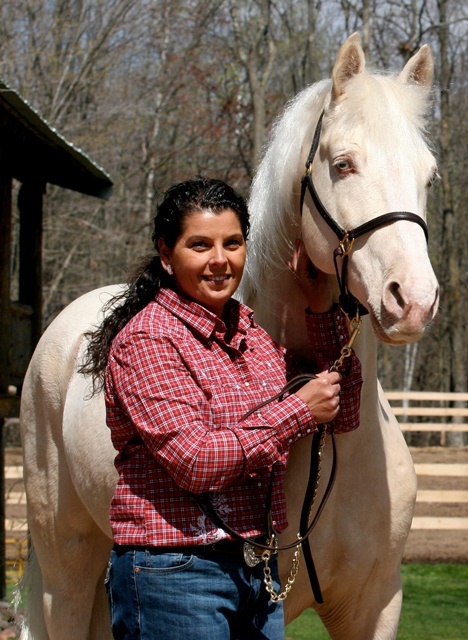 This is especially true of Allerton, a Wilkes- Mambrino Patchen stallion whose record is 2.091/4. 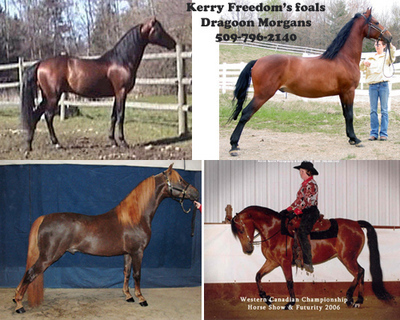 This excessive action is also found in some Morgan strains, especially among Sherman Morgan’s descendants. 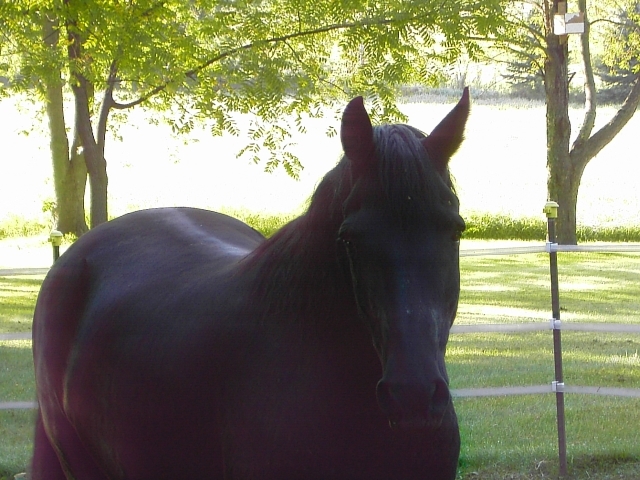 It was from a country doctor–and I trust veracious one, for he was my grandfather–that I heard, long years ago, the following story. 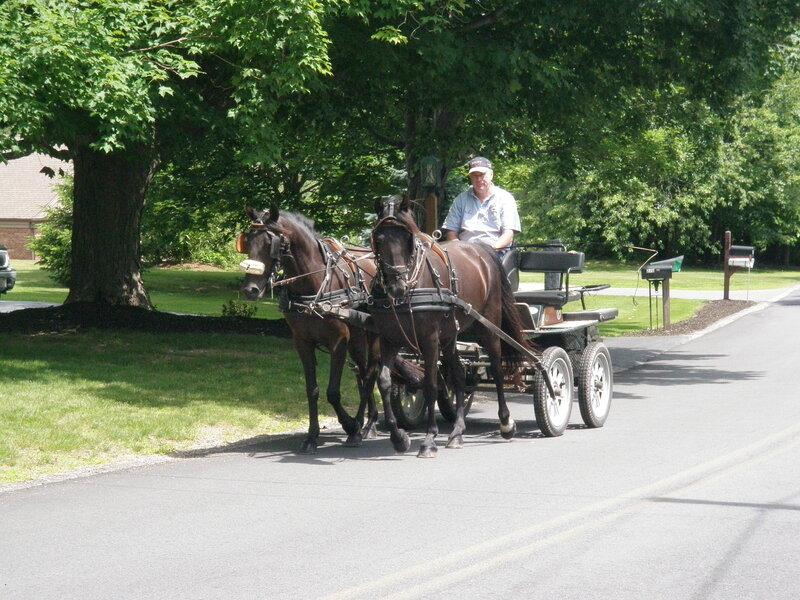 He was driving late one very dark night in autumn over a strange road. 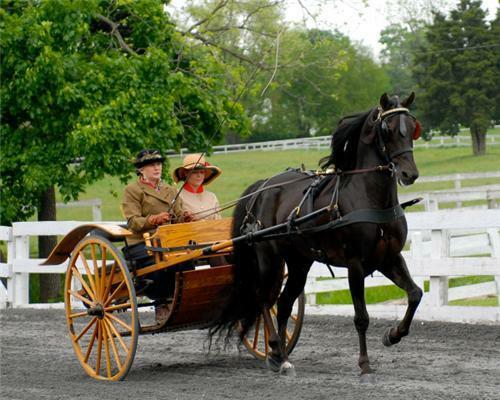 A violent rain had fallen during the preceding twenty-four hours, so that the highway was badly washed. 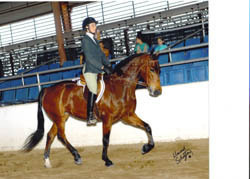 Presently his horse, a Vermont Morgan, made a leap, and crashed through what seemed to be the upper branches of a tree, taking the gig after him very neatly. 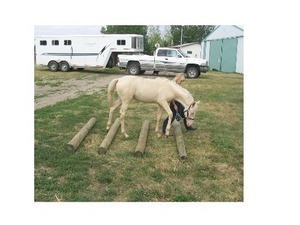 This was a little unusual, but still no harm had been done. 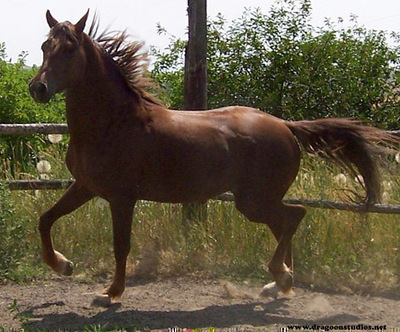 Half a mile or so further on, the horse made another jump; then came a crash and a shiver as before, and the gig reeled over another tree, as it appeared, poised for a moment on one wheel, and righted itself as the horse resumed his trot. 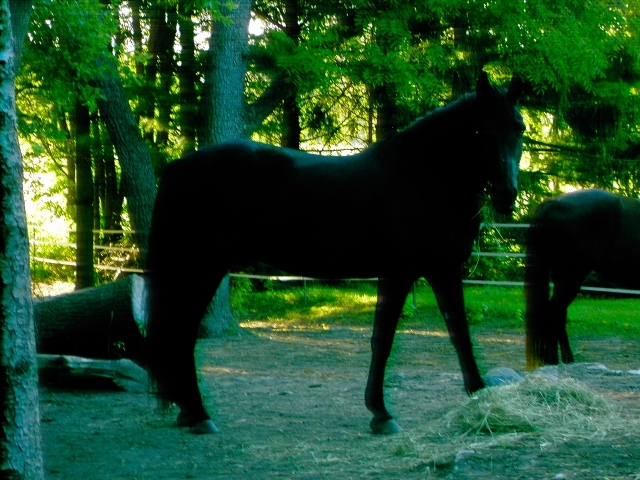 By this time the Doctor knew that he must be near a considerable river, with high banks, which flowed through these parts, and very soon he heard the waters roaring the rocks below. 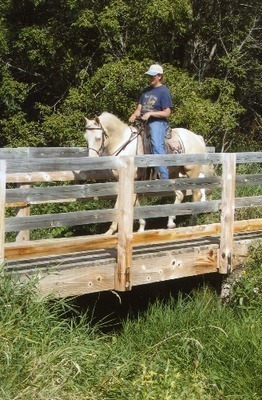 But now his horse came to a dead stop, refusing to cross the bridge. 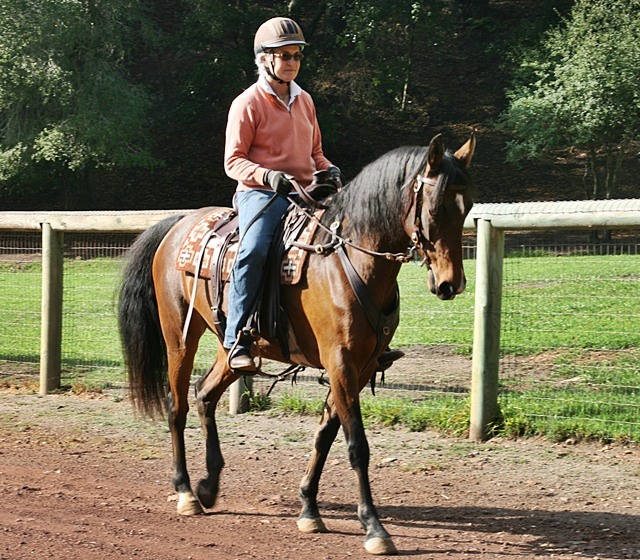 The Doctor urged him forward, and he took a few steps, but then moved back in his tracks. 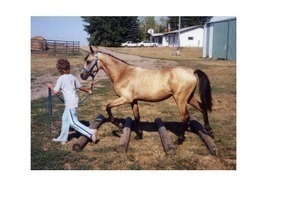 This was repeated twice. 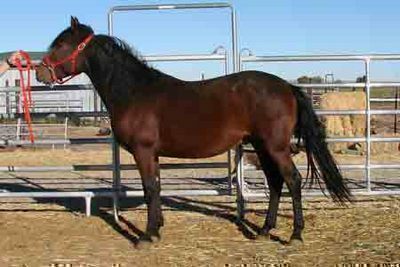 Finally, vexed as such unusual obstinacy in an animal long accustomed to rough and nocturnal traveling, the Doctor struck him with the whip. 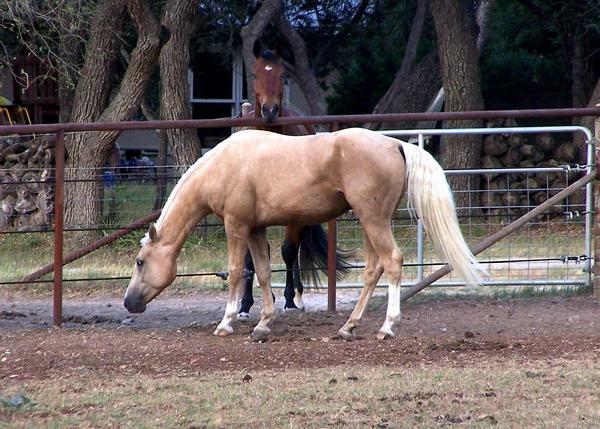 The horse squealed with disgust at this treatment, shook his head, advanced as before and then backed again, and cast an inquiring glance behind him at his master. 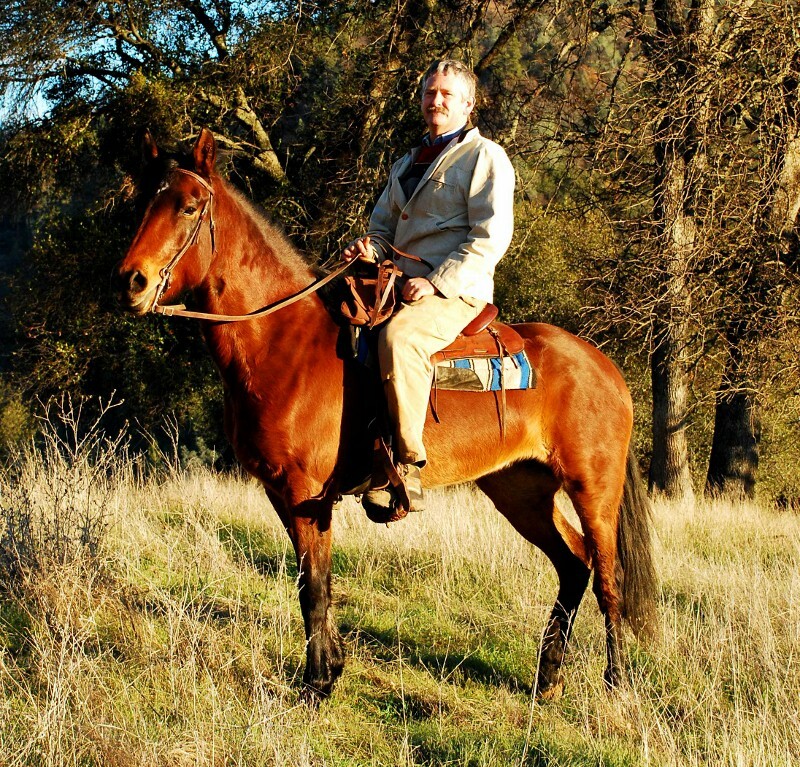 Now at last, the Doctor, dismounting, went forward to reconnoiter. 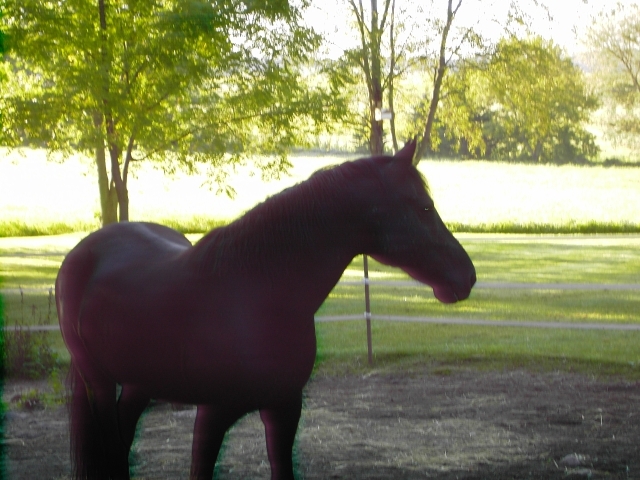 And this is what he saw. 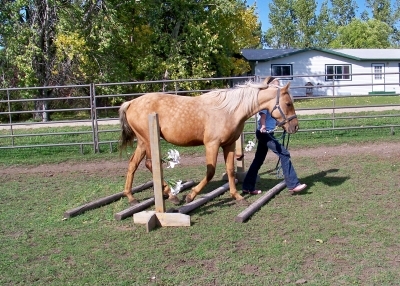 The flooring of the bridge had been swept away completely by a flood; nothing was left but the sleeper running from bank to bank, and it was on one of these sleepers that the horse had walked out so far as he could with safety to the gig and it’s occupant. 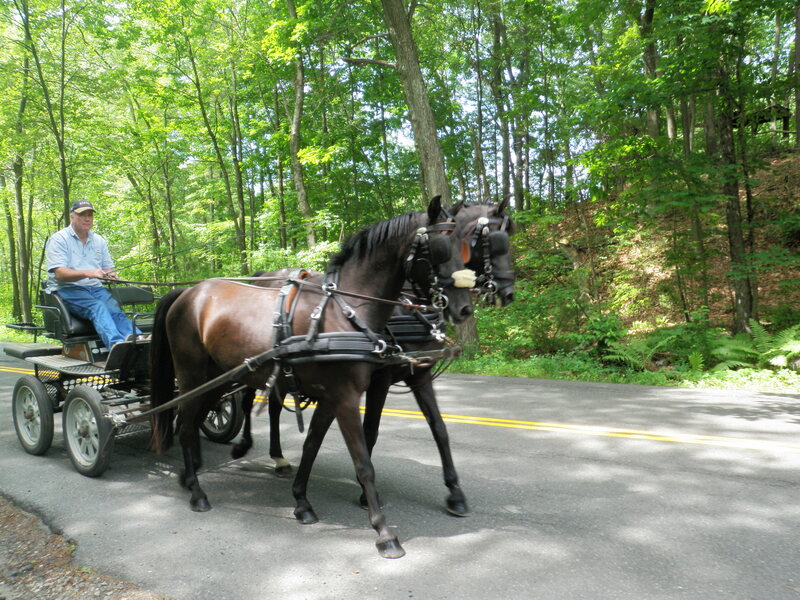 The obstructions half a mile and a mile back, which the roadster had jumped, were brush fences put up to stop travel on the highway until the bridge could be repaired. 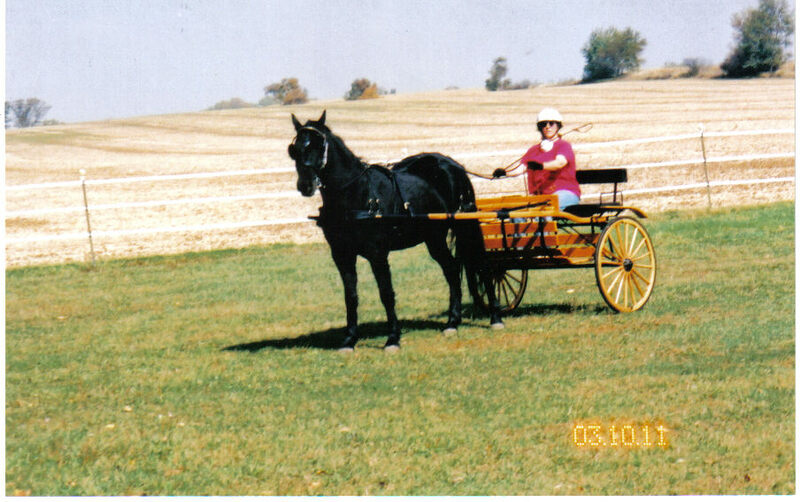 Now that we are in vein, I trust that the reader will pardon me if I relate another anecdote of a Morgan roadster. 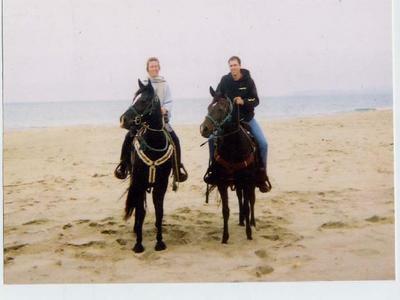 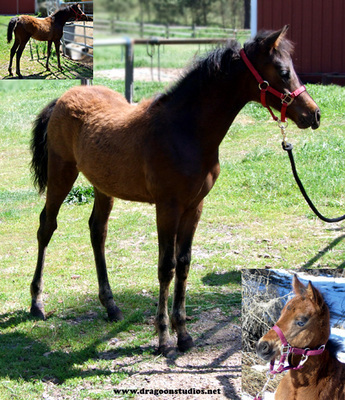 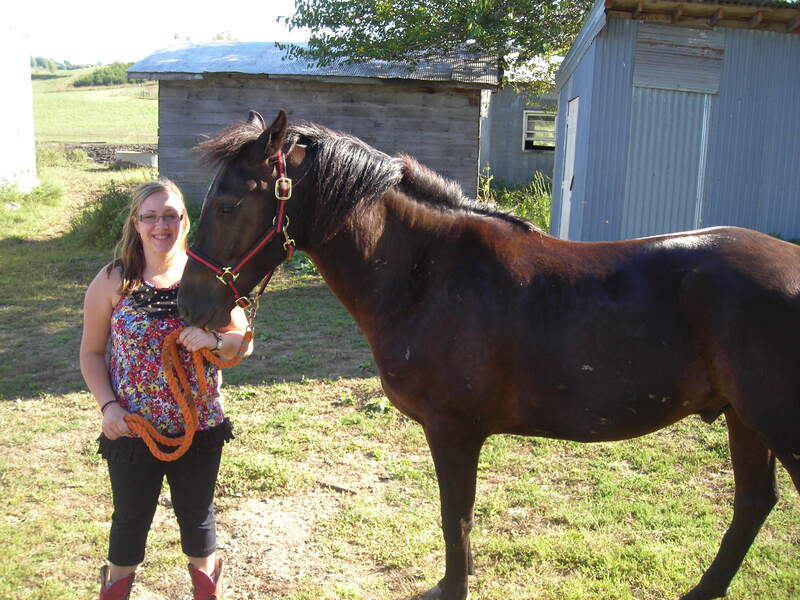 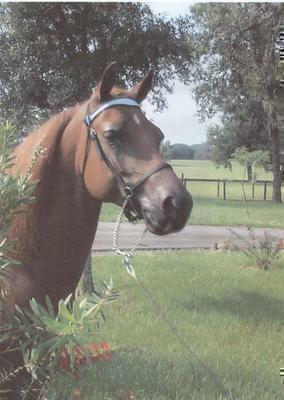 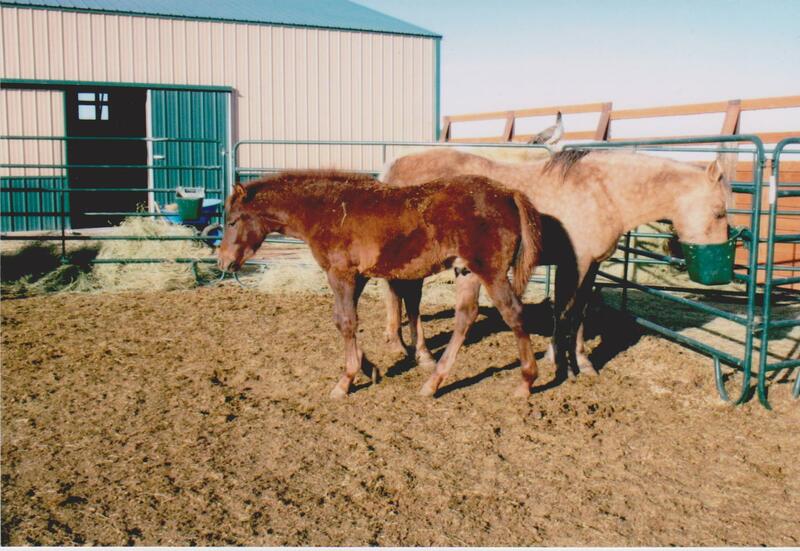 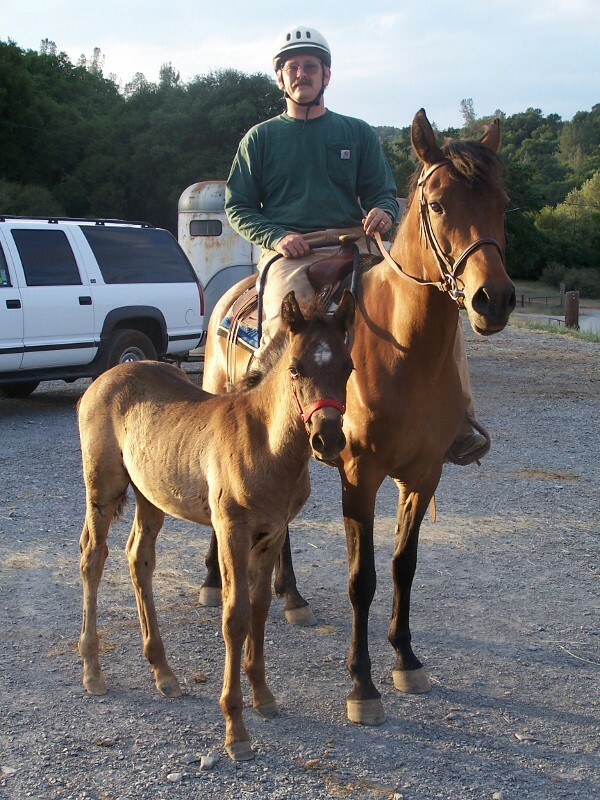 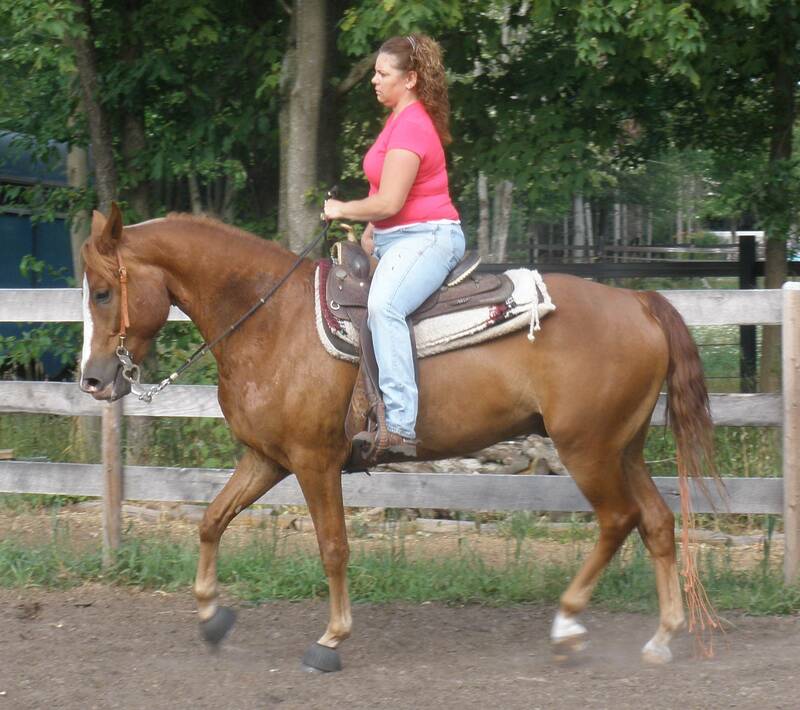 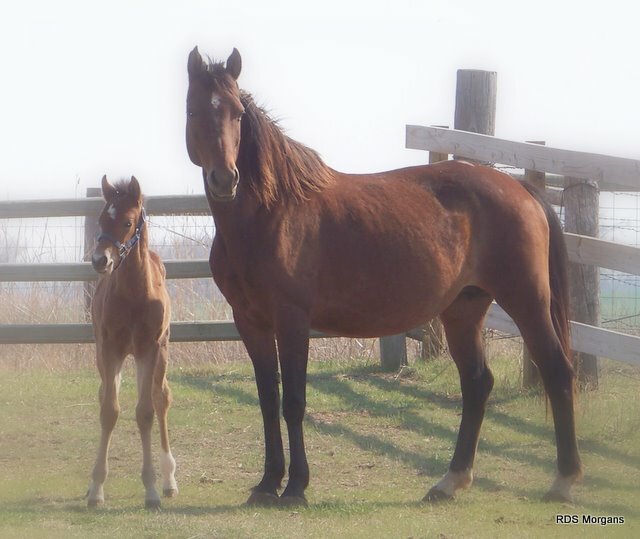 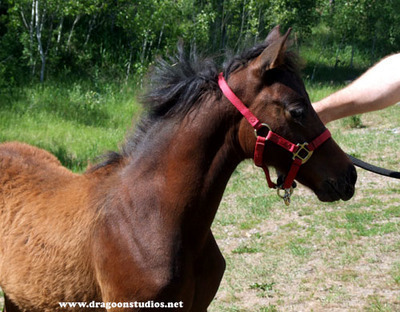 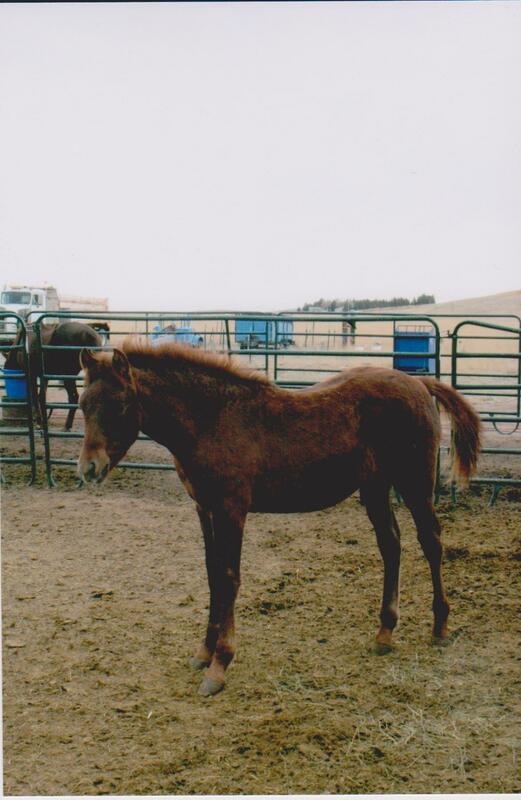 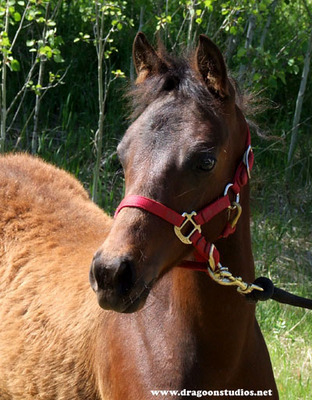 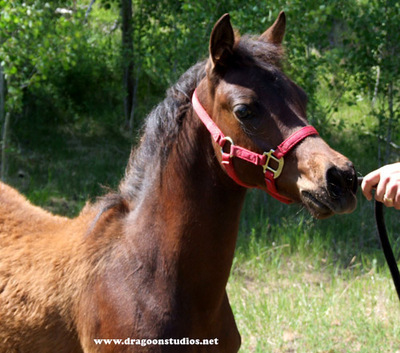 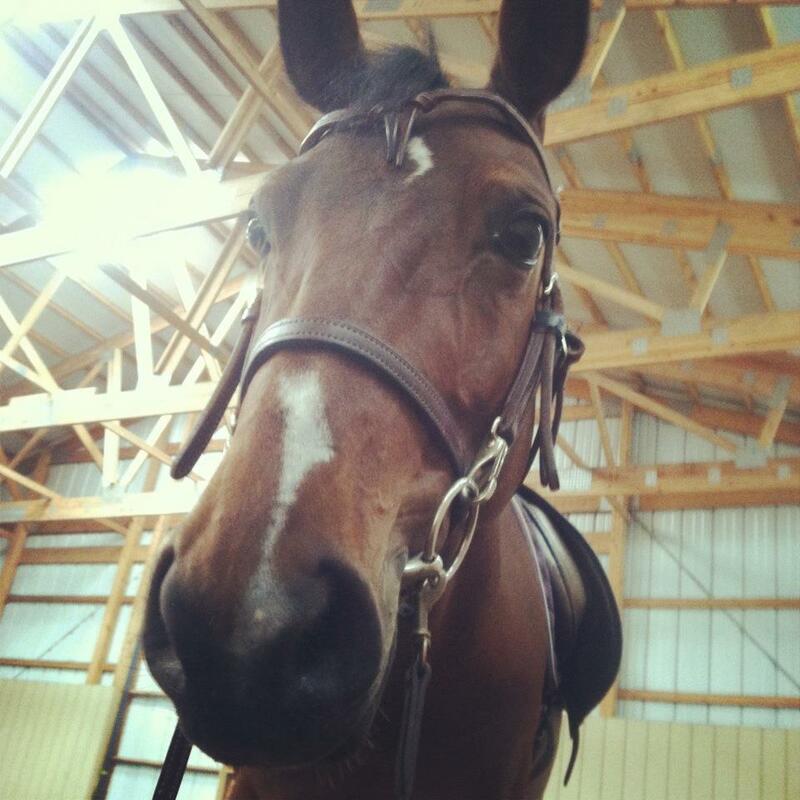 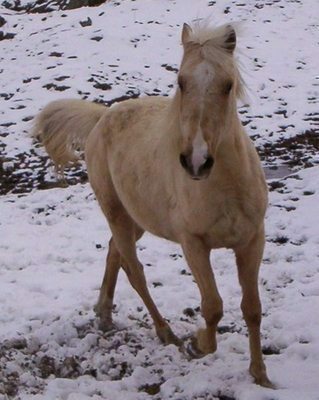 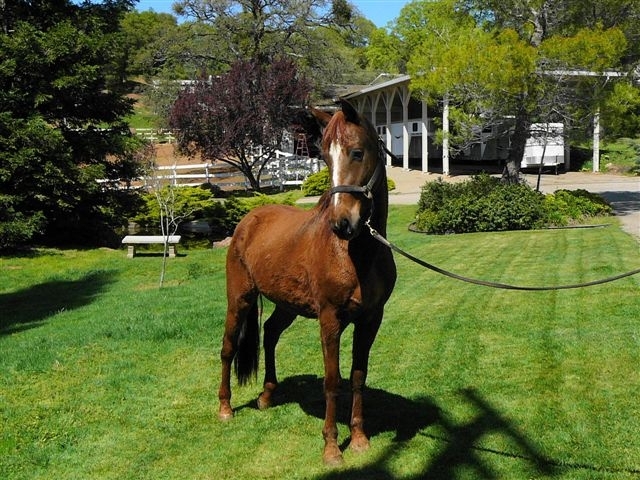 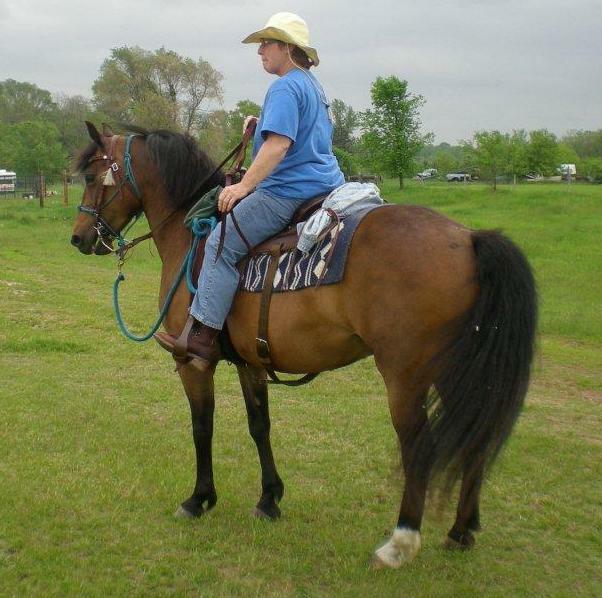 This was a chestnut mare belonging to an old and highly respected “Vet.” One very dark night the Doctor was driving toward home at a fast trot on a level road, and in his proper place on the right hand side of it. 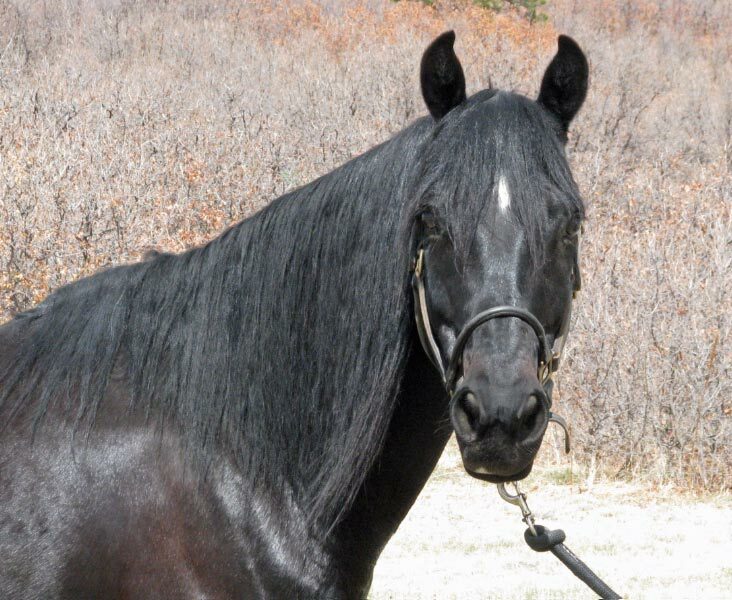 Presently he heard a vehicle approaching, though in the opposite direction; but as his lights were burning brightly, and the highway was a broad one, he thought nothing of it. 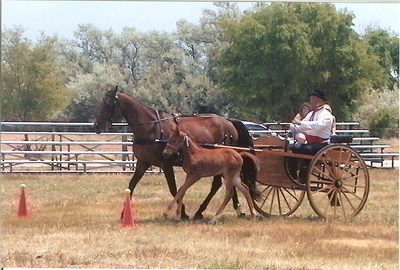 Suddenly, however, before he could stop her, his steed made a violent jump to the left, crossing the road, and barely had she done so, when the approaching wagon, driven, as it appeared, by a drunken man, dashed by in the track which the Doctor’s buggy had just left. 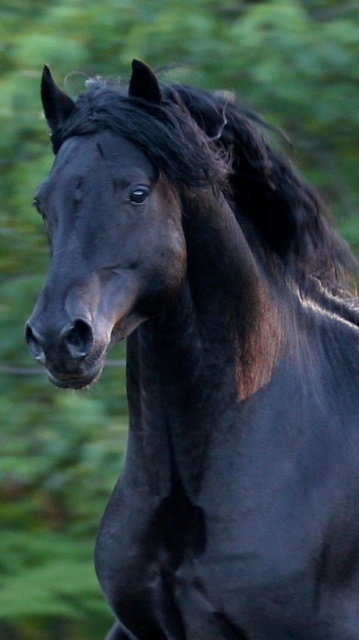 The intelligent mare had waited till the last moment, thinking that the vehicle which she heard, would keep to the right, as it should have done; and then, foreseeing that a collision was otherwise inevitable, she had spring out of the path of danger. 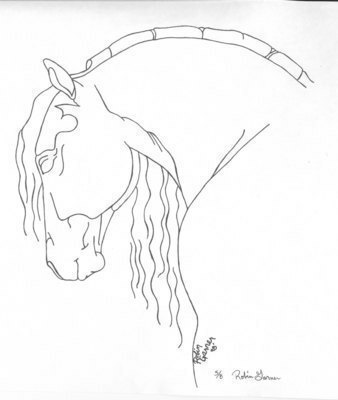 I have sketched the most speedy and highly finished branch of the Morgan stock, which is that of the LAMBERTS, descended, through Ethan Allen, from Vermont Black Hawk. 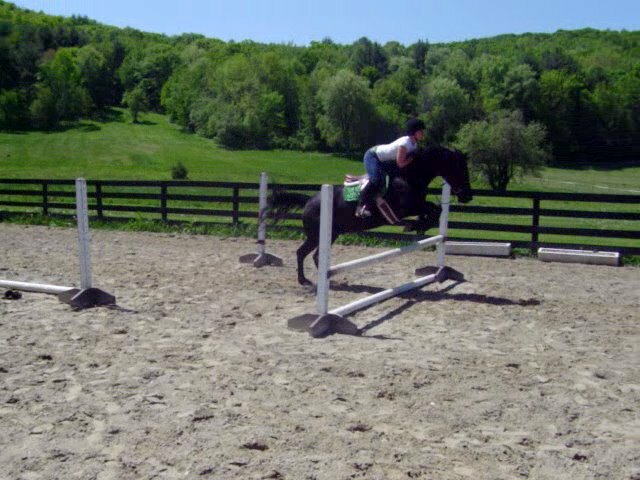 Vermont. 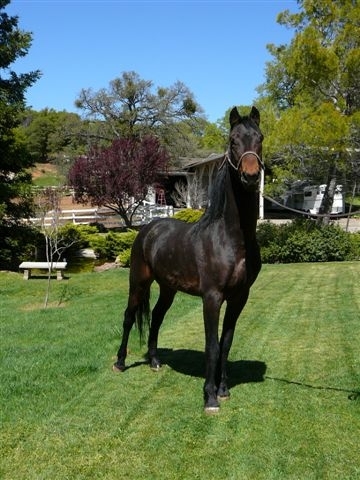 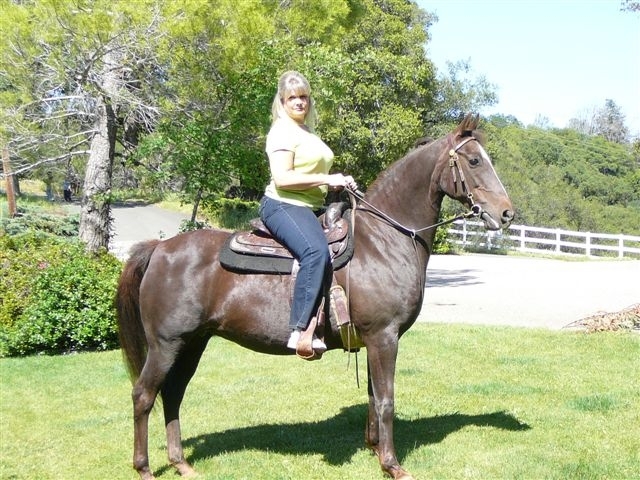 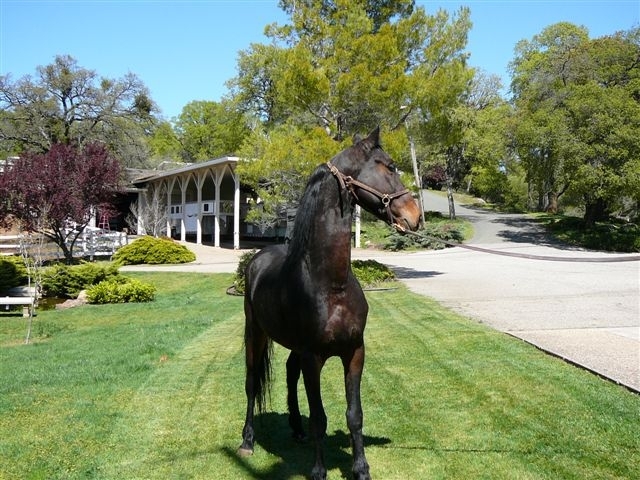 Black Hawk had also a son called Vermont Hero and Vermont Hero was the sire of GENERAL KNOX (whose name I have mentioned), a famous trotting stallion, and founder of a subsidiary roadster family. 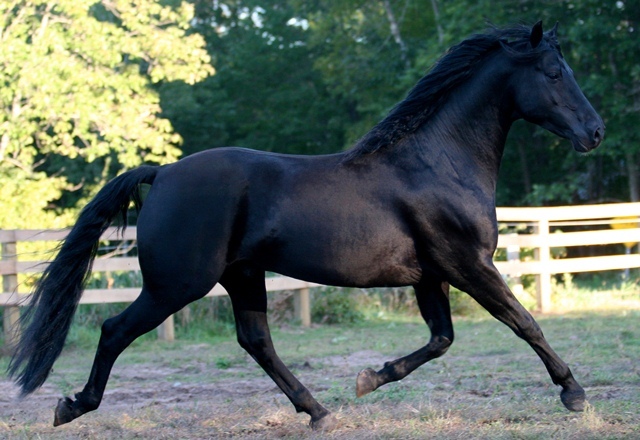 This animal had every excellence except that of beauty. 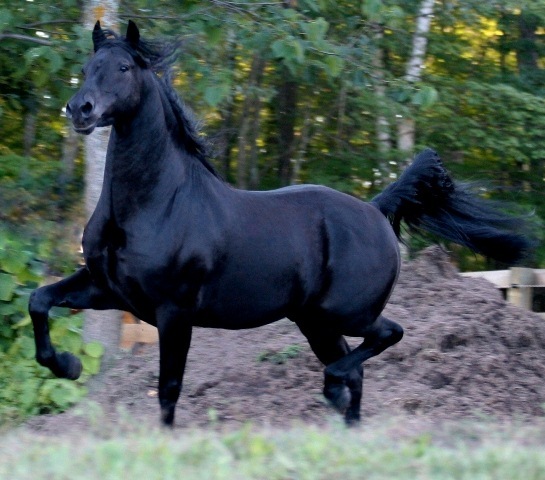 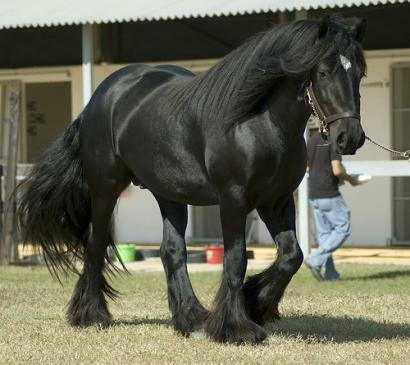 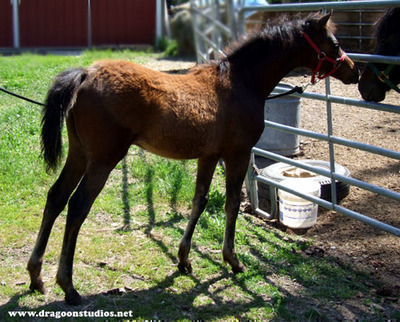 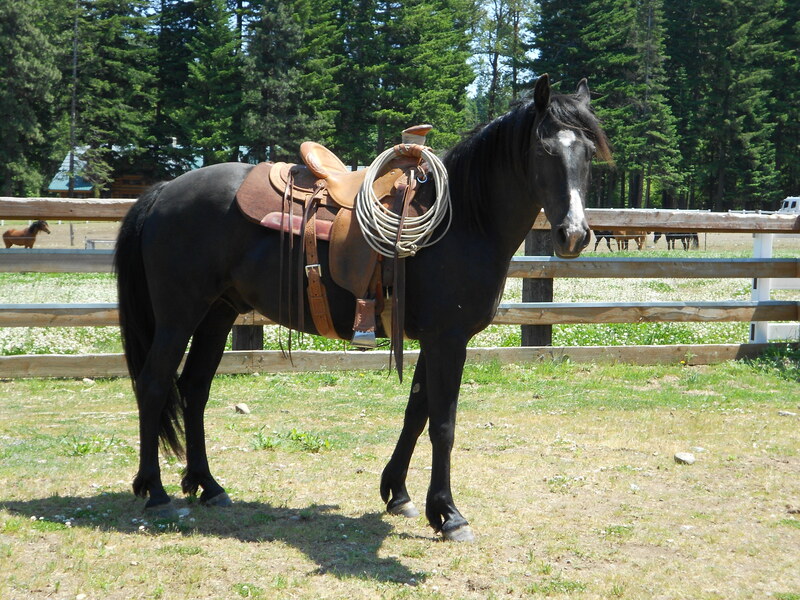 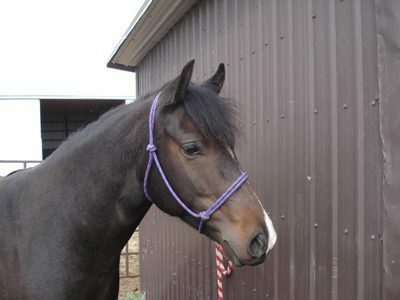 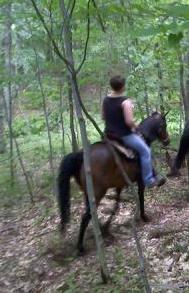 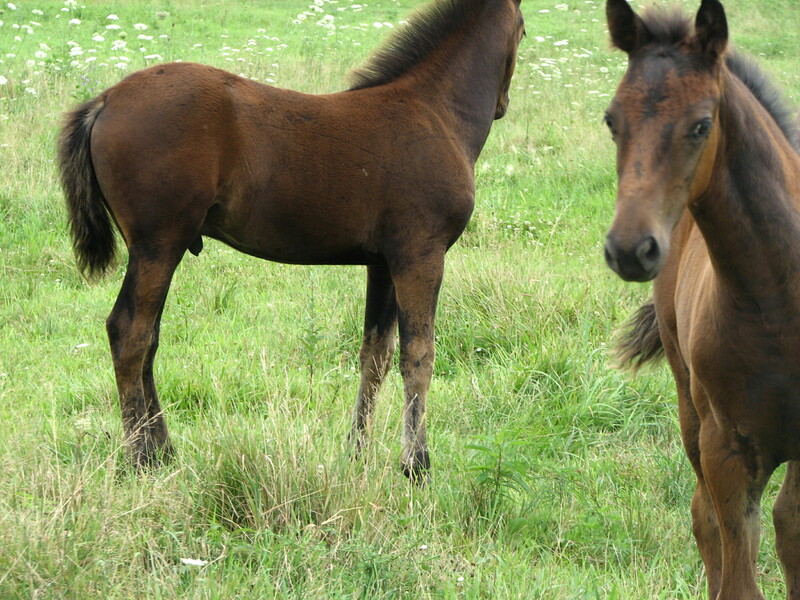 He was a stout shortlegged black horse, about fifteen hands high, with a good plain head. 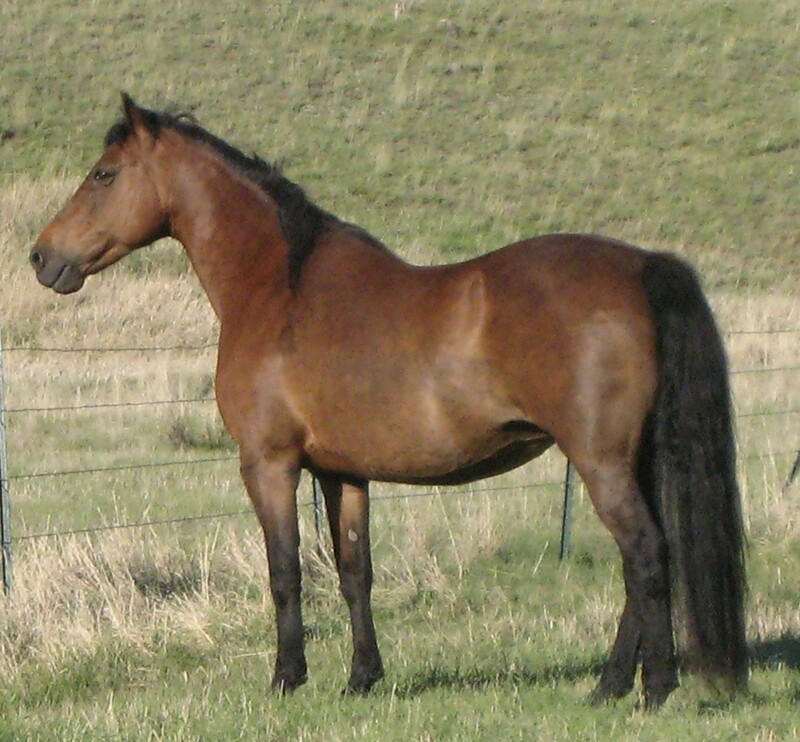 The Knox horses bear a wonderful family resemblance, and they are noted for their courage, endurance, docility, and intelligence. 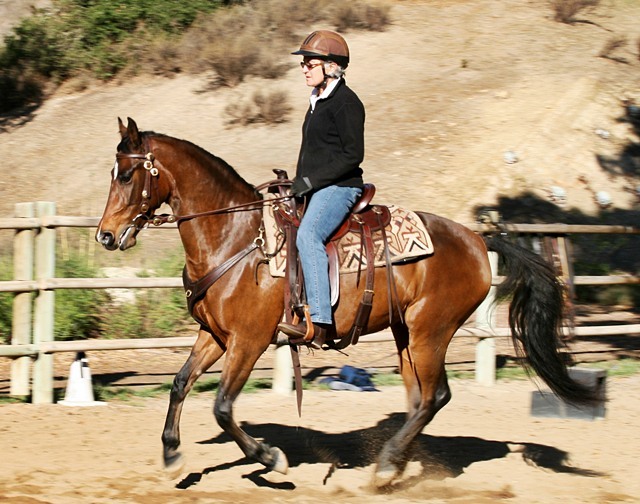 No branch of the Morgan family is more serviceable or more amiable that this one, and, with the possible exception of the LAMBERTS, none is more speedy.